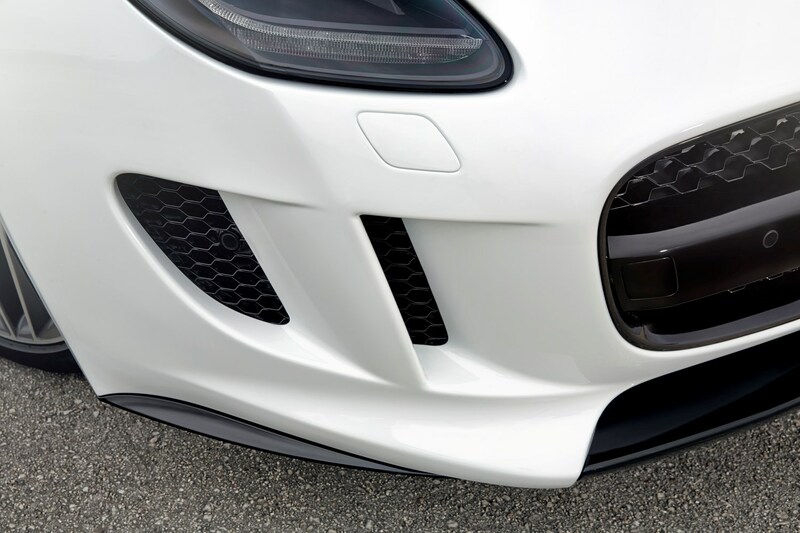 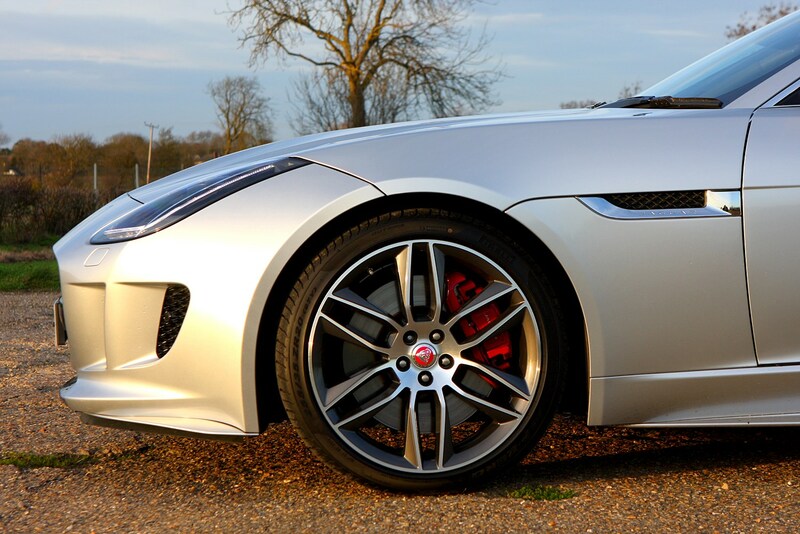 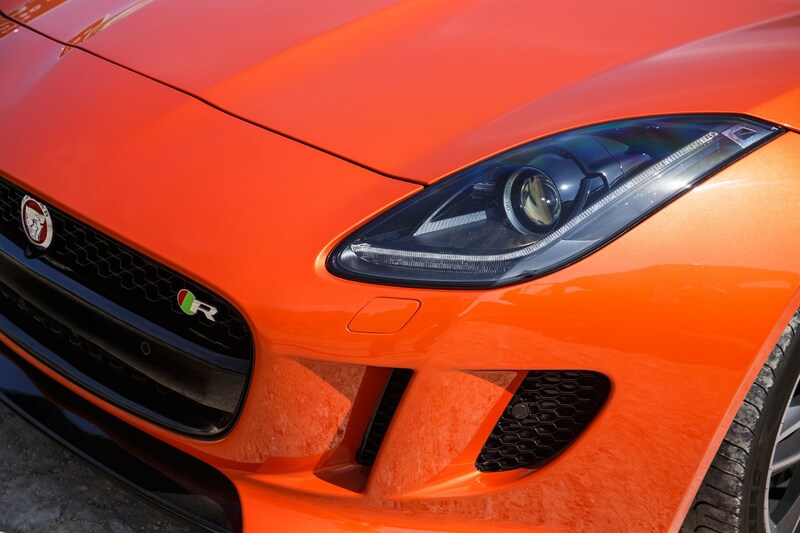 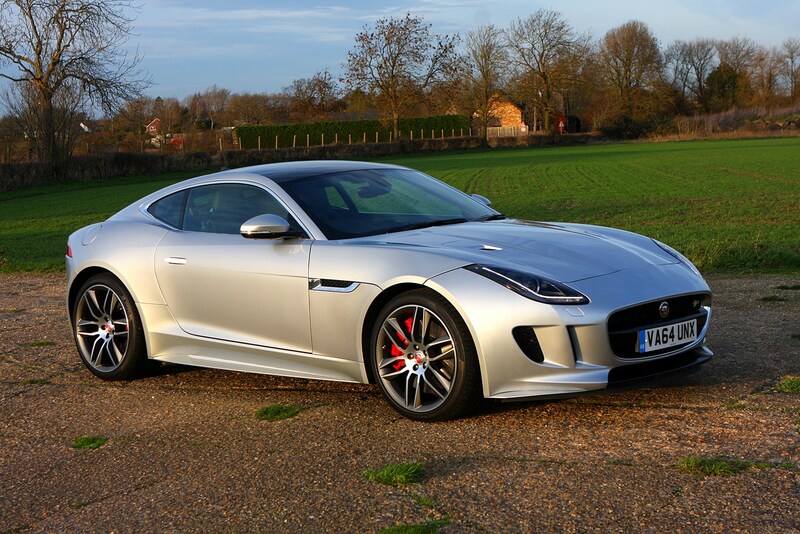 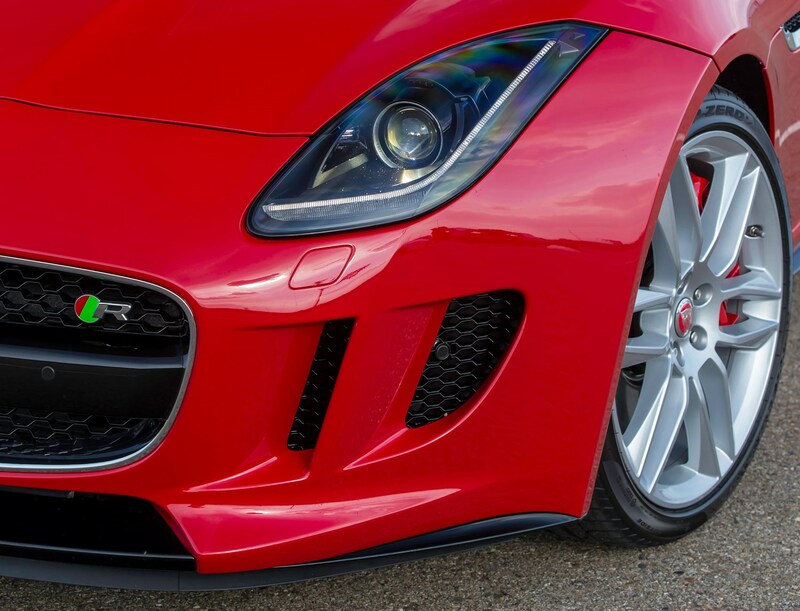 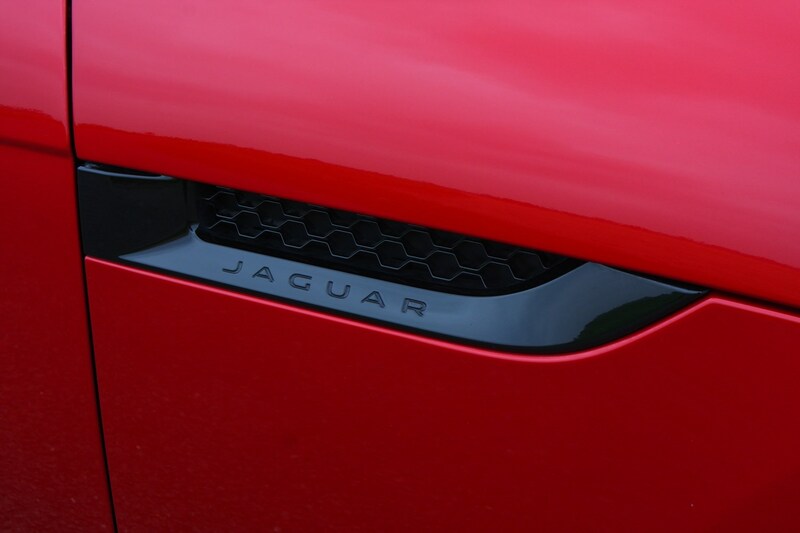 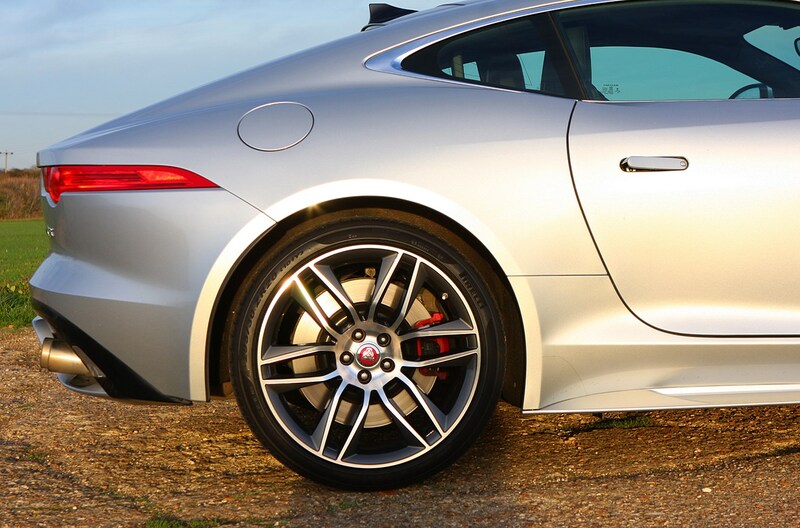 The Jaguar F-Type R Coupe is the flagship model in the F-Type range. 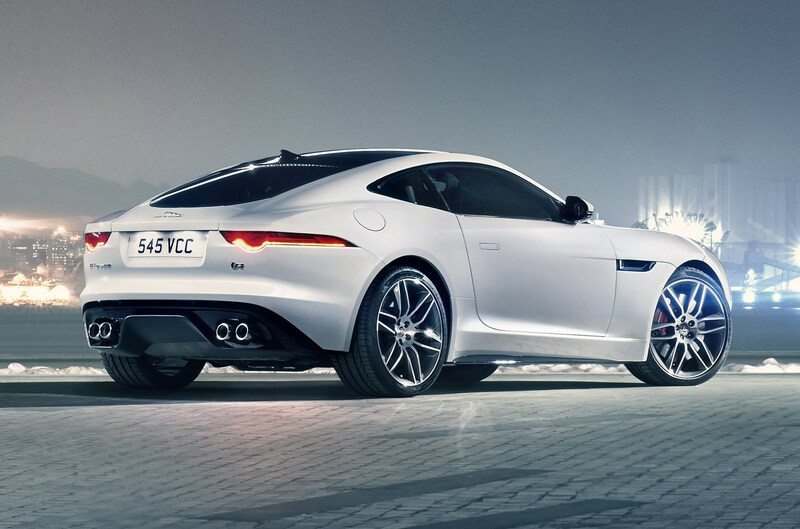 It’s pretty, luxurious and fantastically fast. 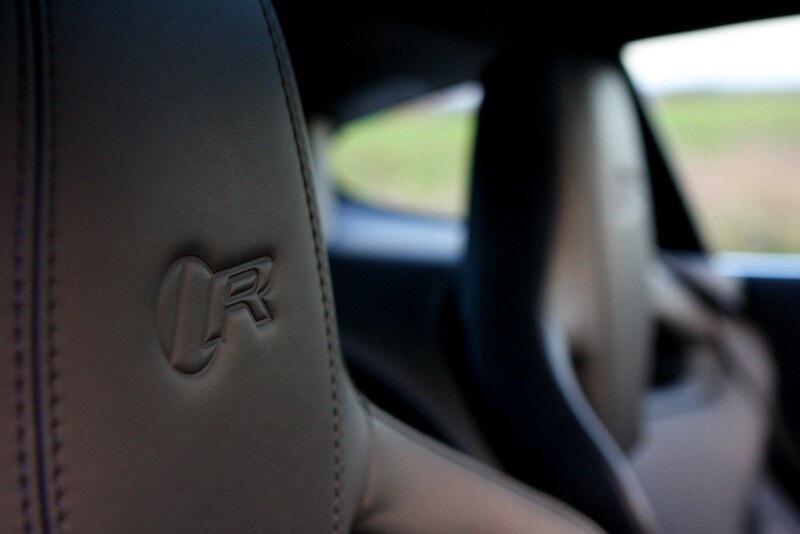 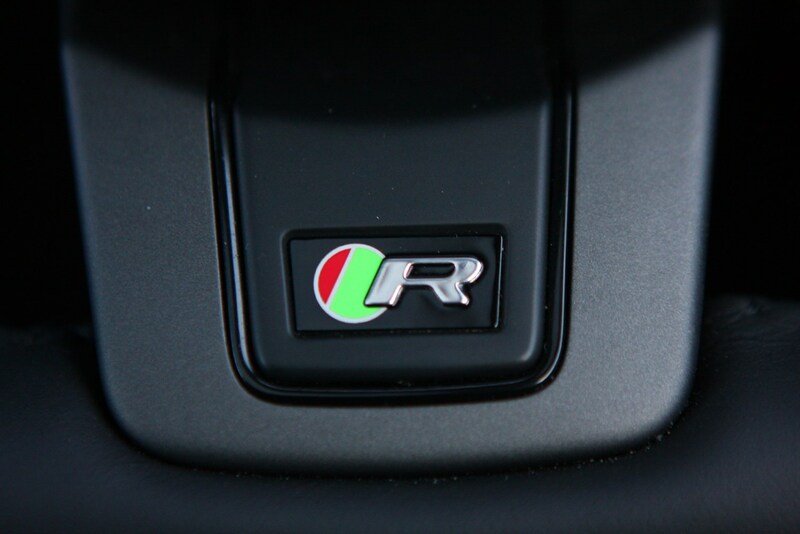 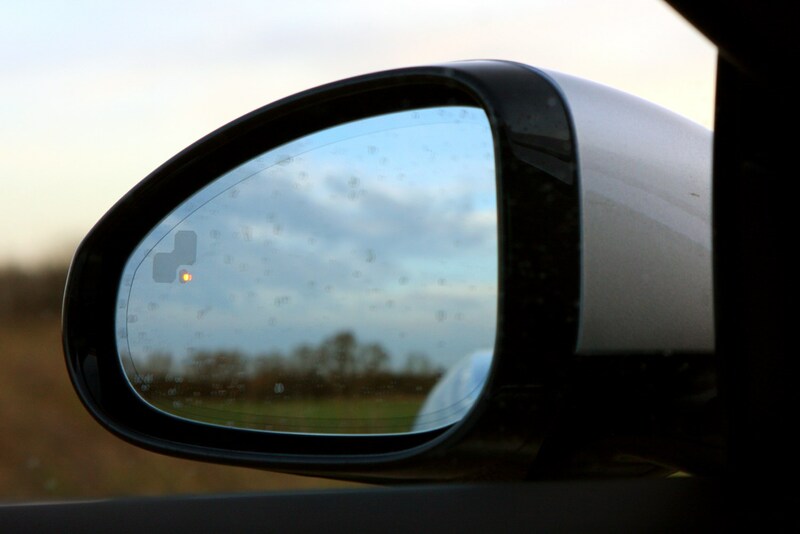 After an initial drive we were left staggered by the R’s sheer capability, both on the road and on the race track. 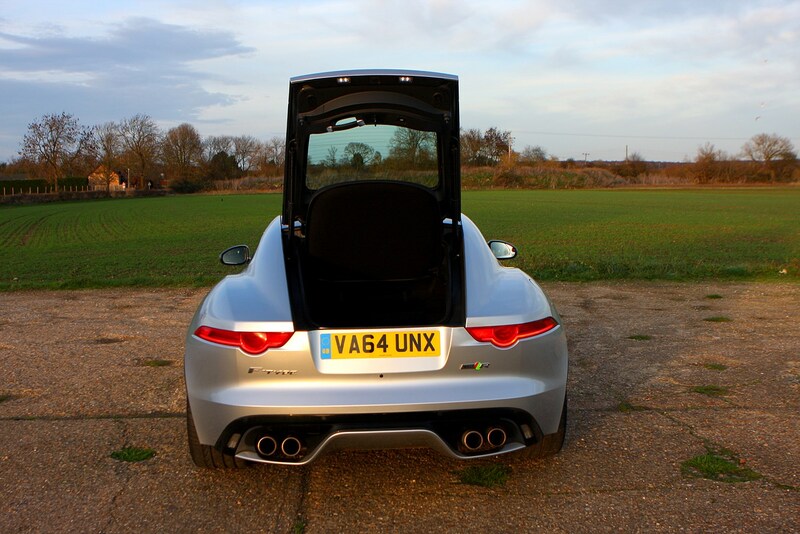 Not only that, but it’s docile and pleasant on the motorway and unintimidating in town too. 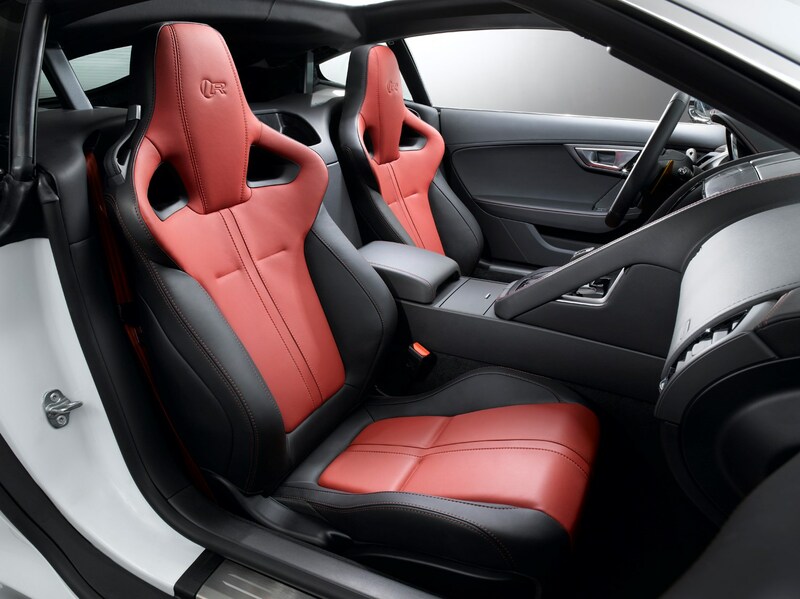 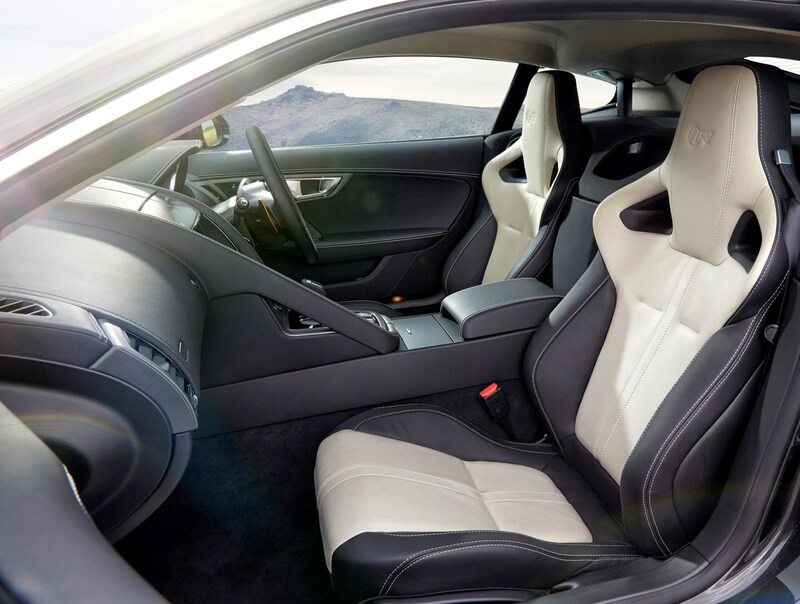 The interior is a plush yet functional place to be and the seats strike the perfect balance between comfort and performance motoring. 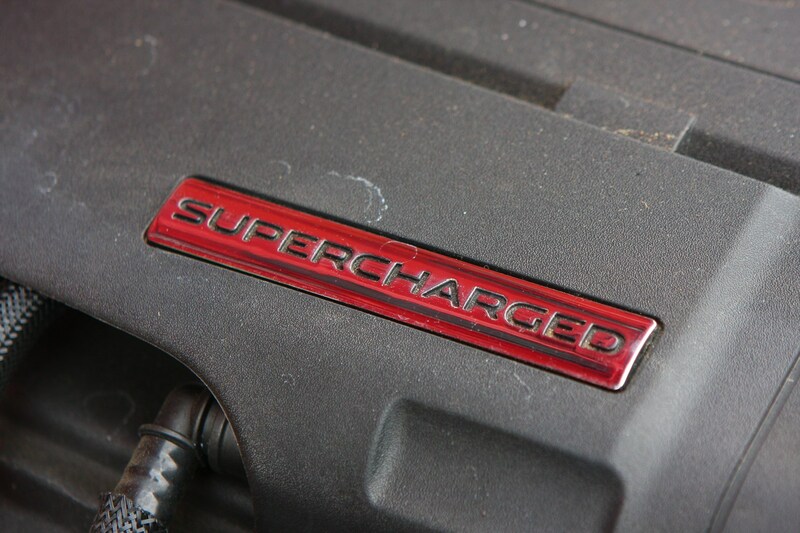 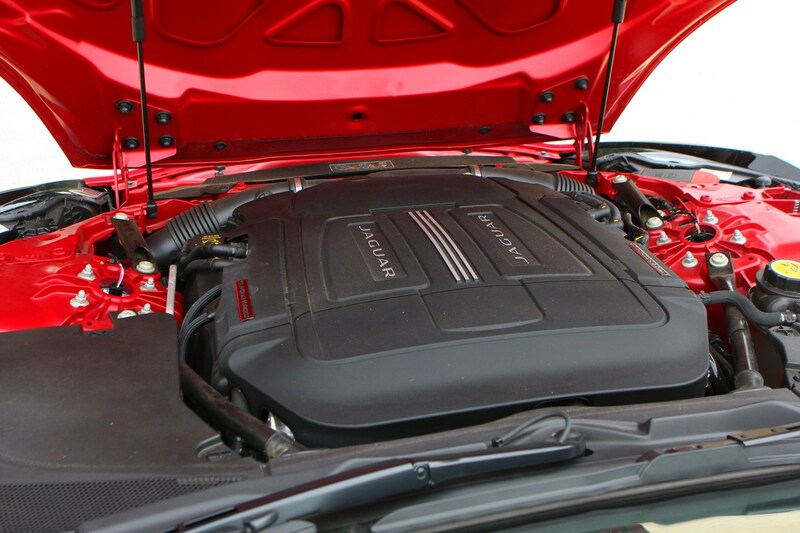 Underneath its beautifully sculpted bodywork sits a 5.0-litre supercharged V8 petrol engine developing a brutish 542bhp and 680Nm of torque to drive the rear wheels. 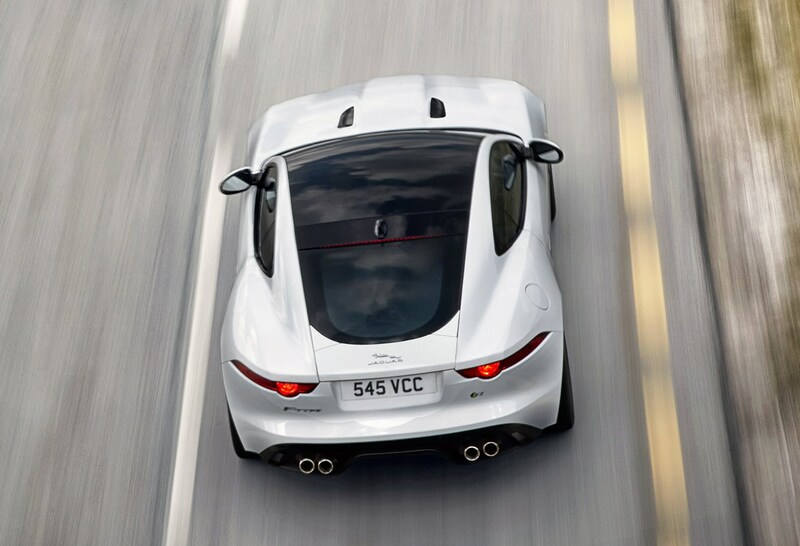 It’s the fastest F-Type Coupe available, smoking its way from 0-62mph in 4.2 seconds and on to an electronically limited top speed of 186mph. 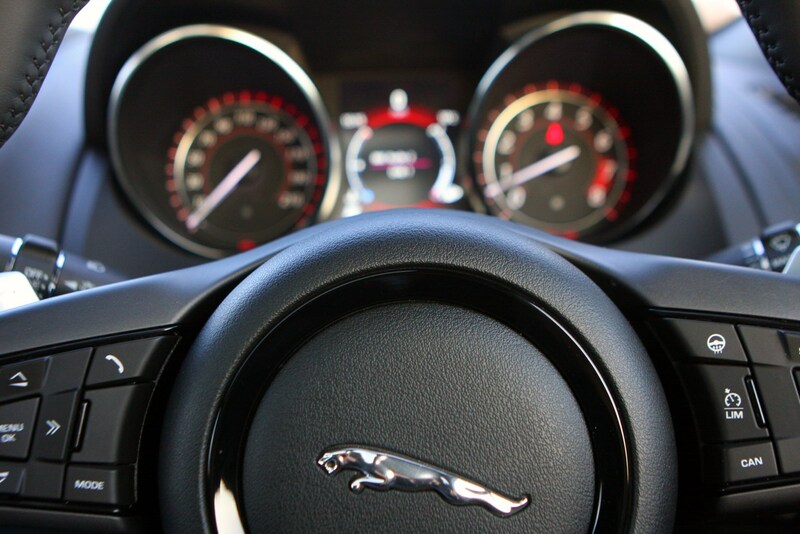 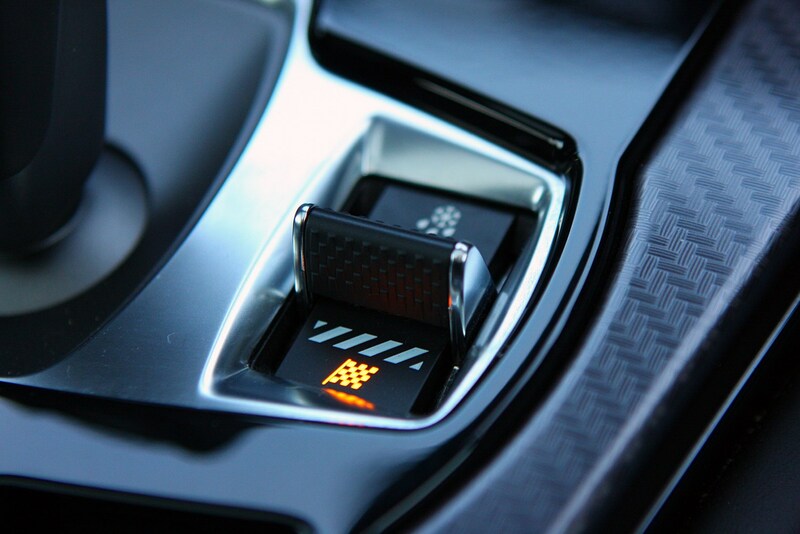 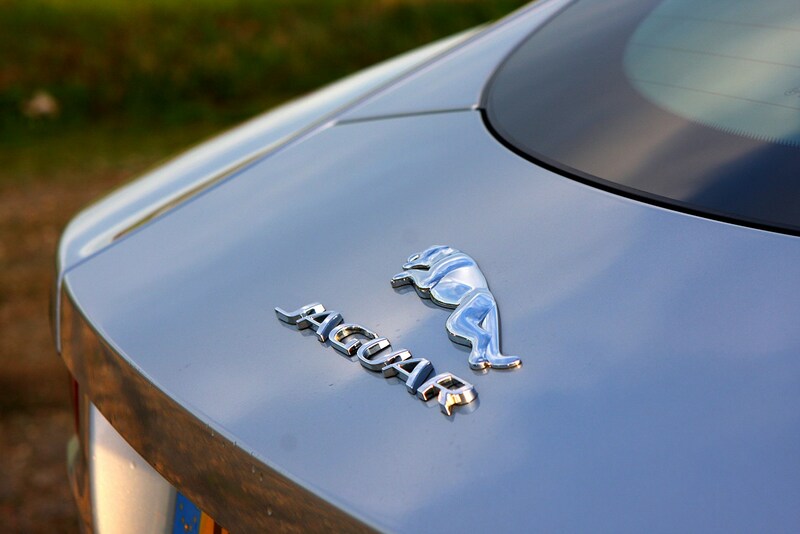 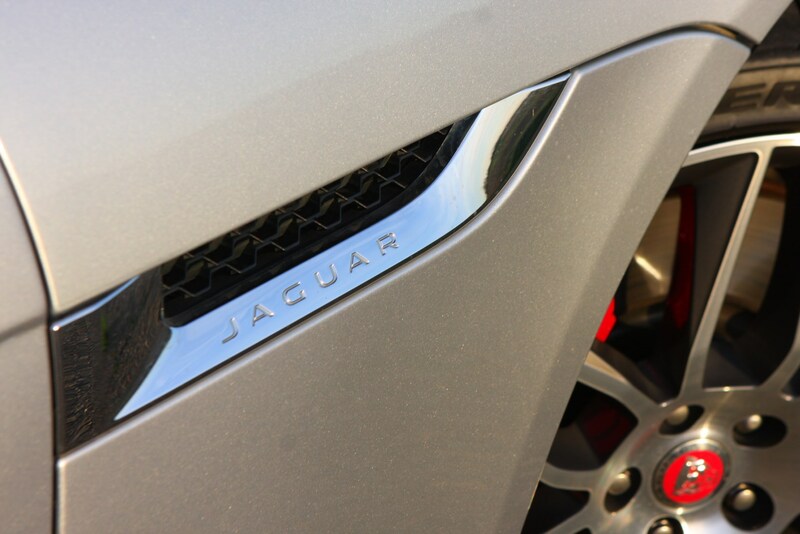 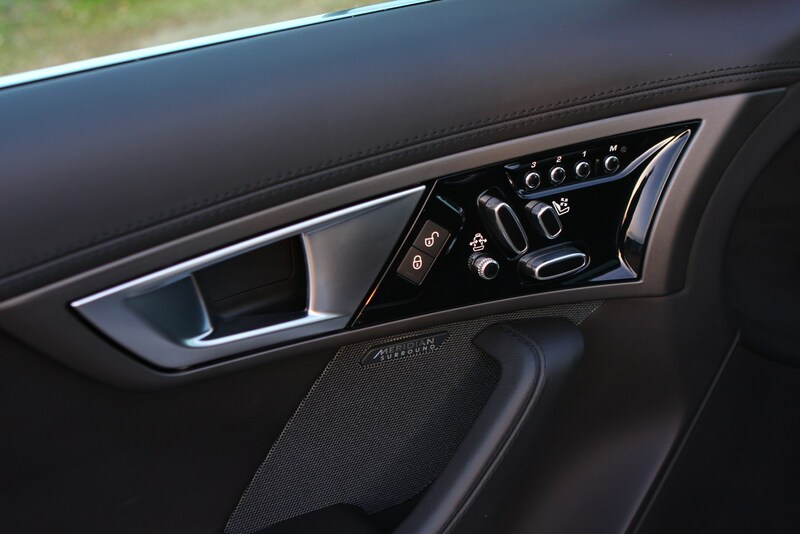 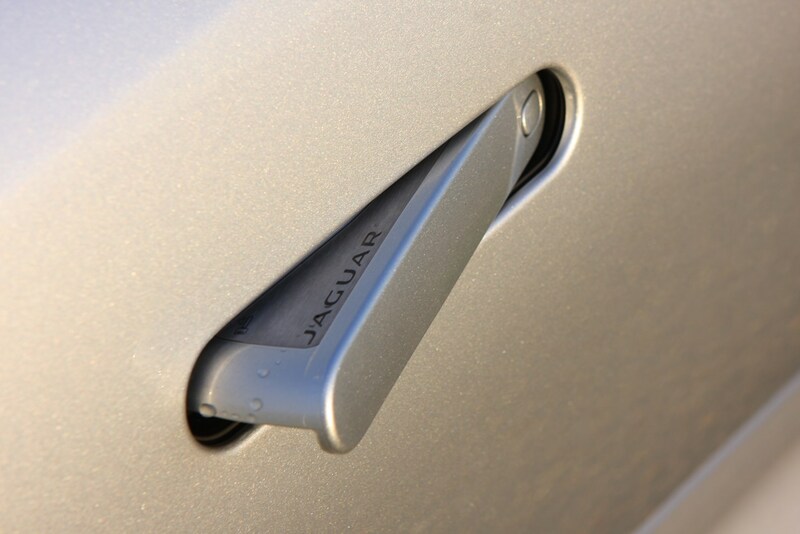 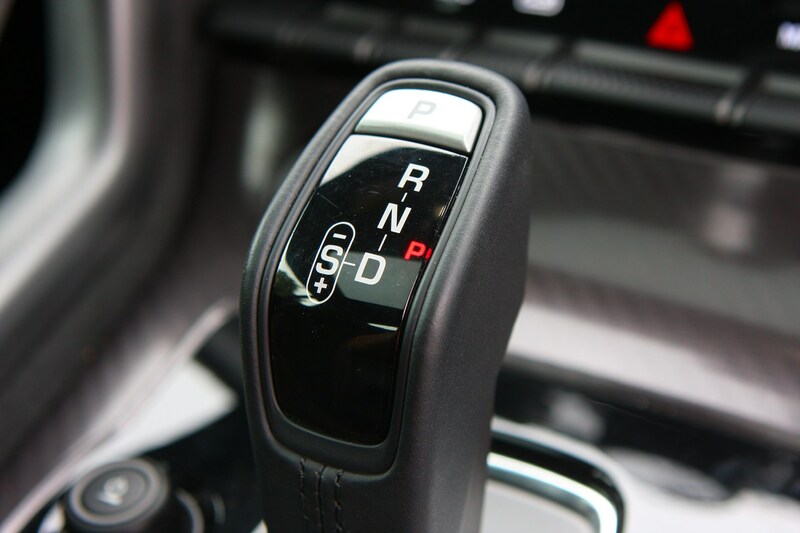 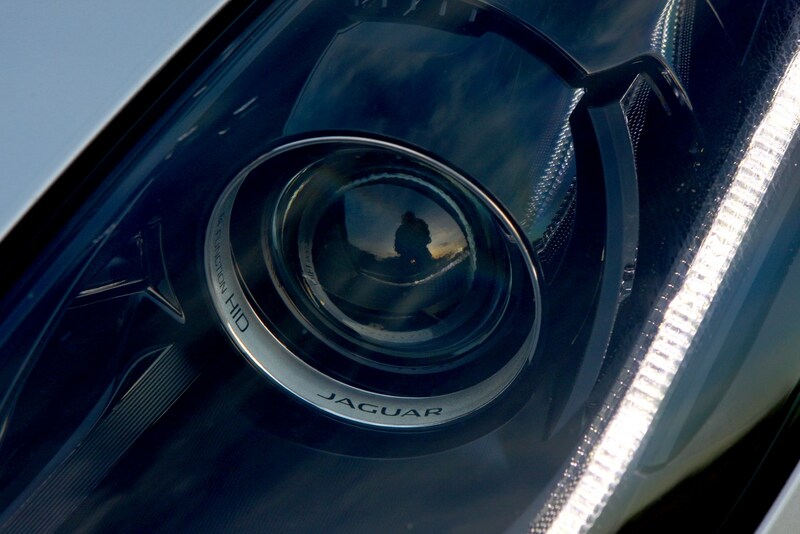 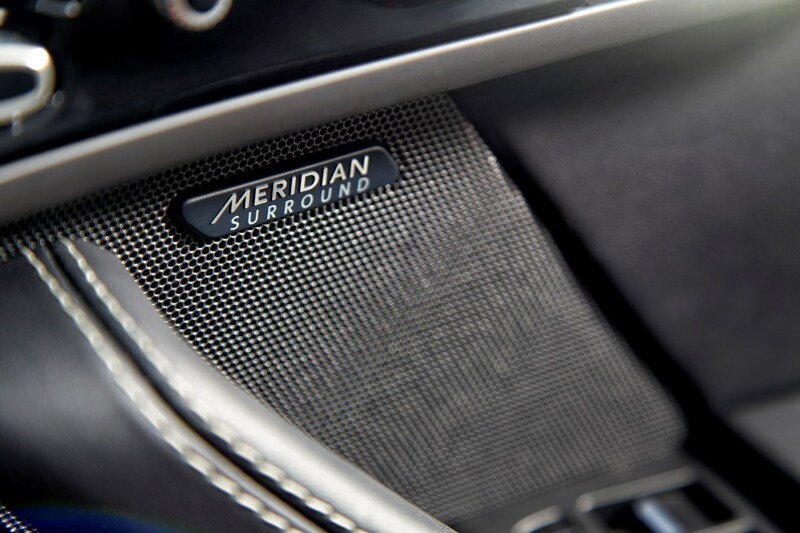 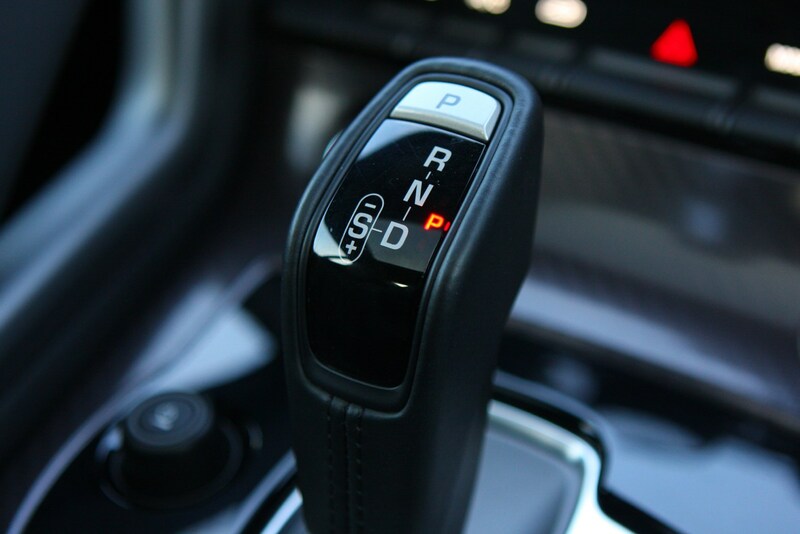 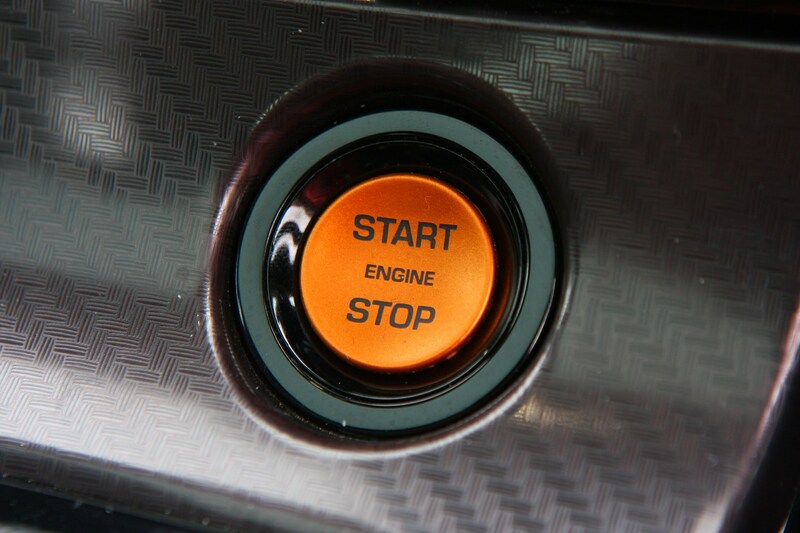 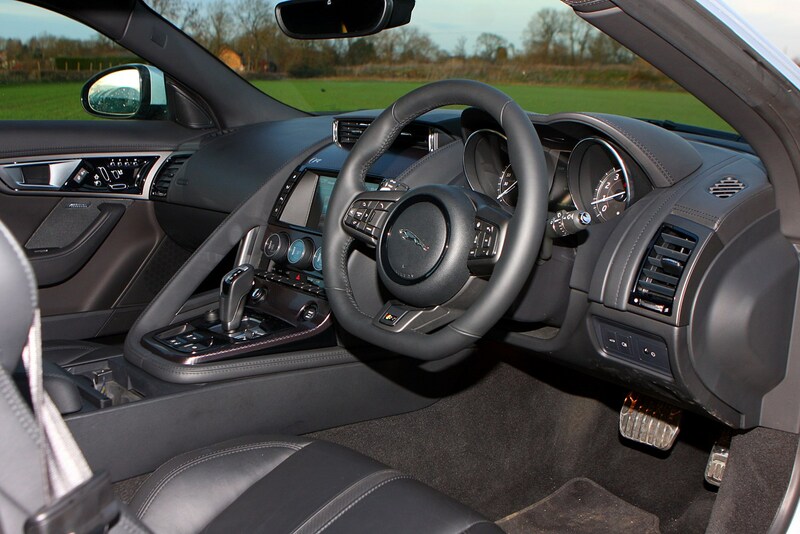 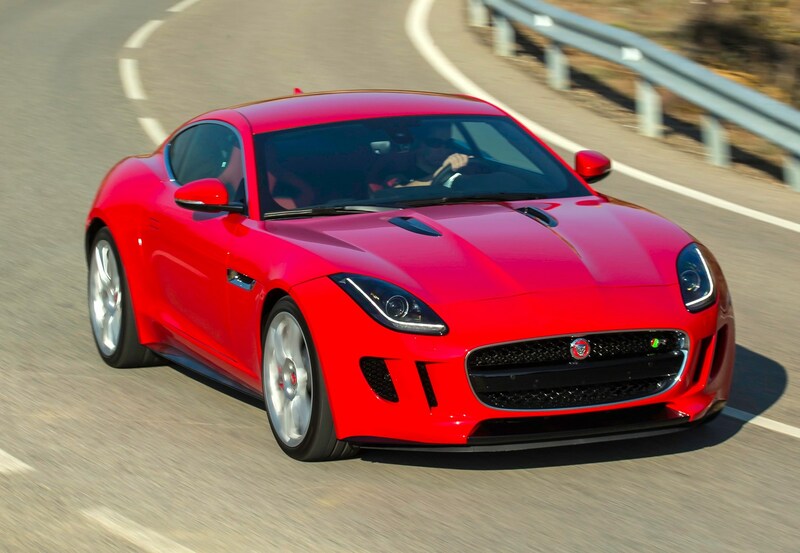 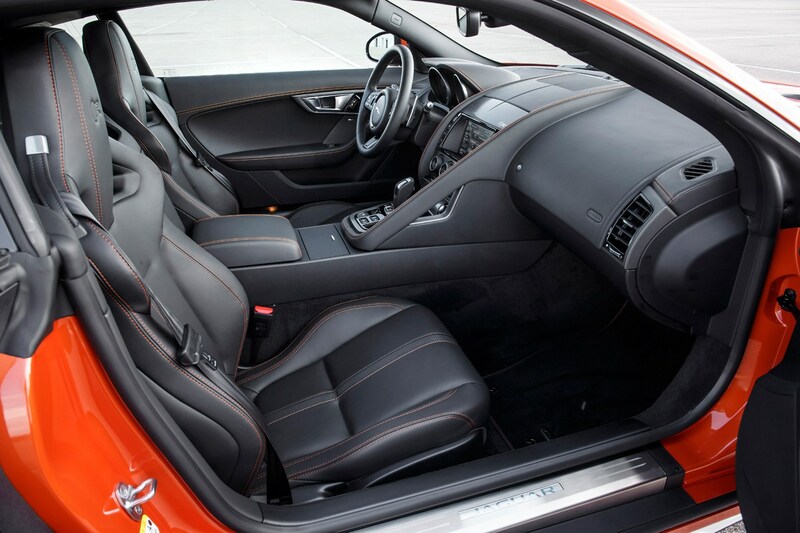 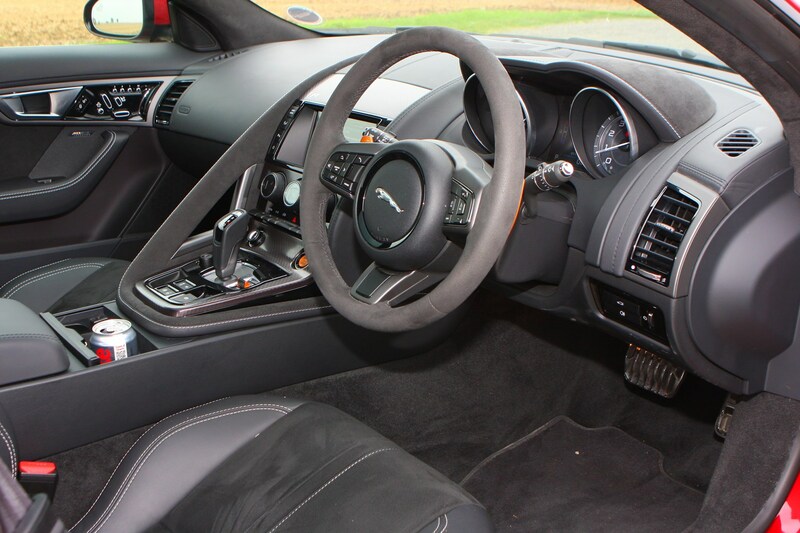 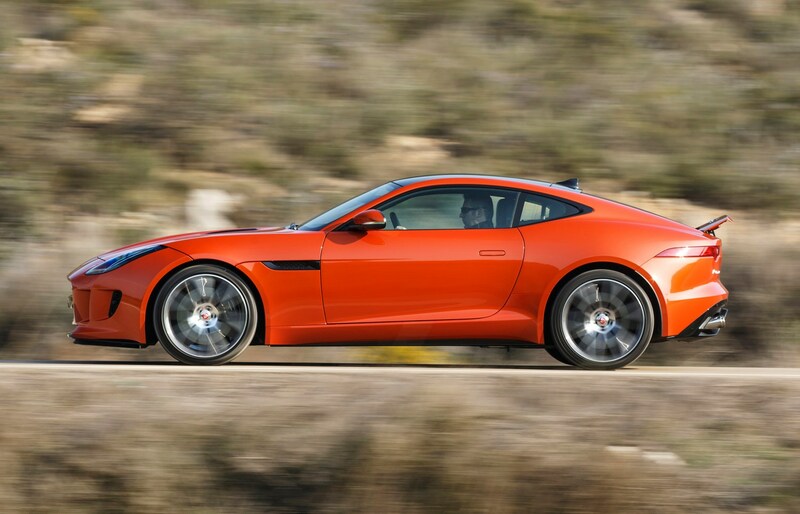 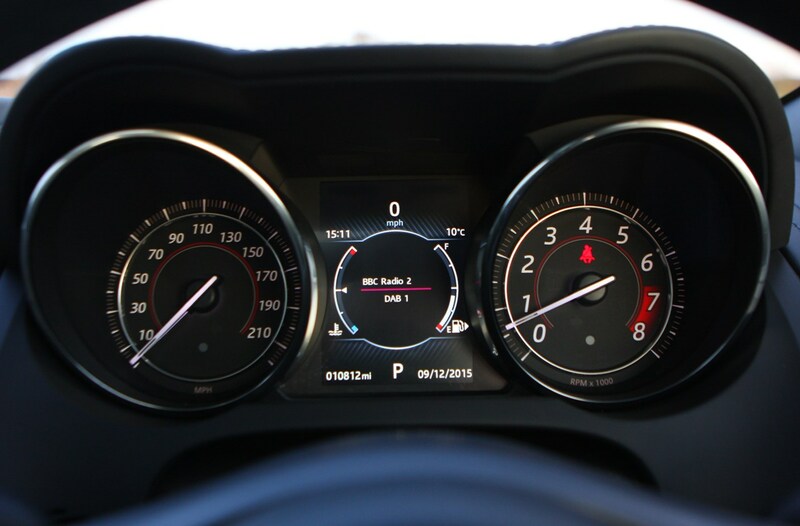 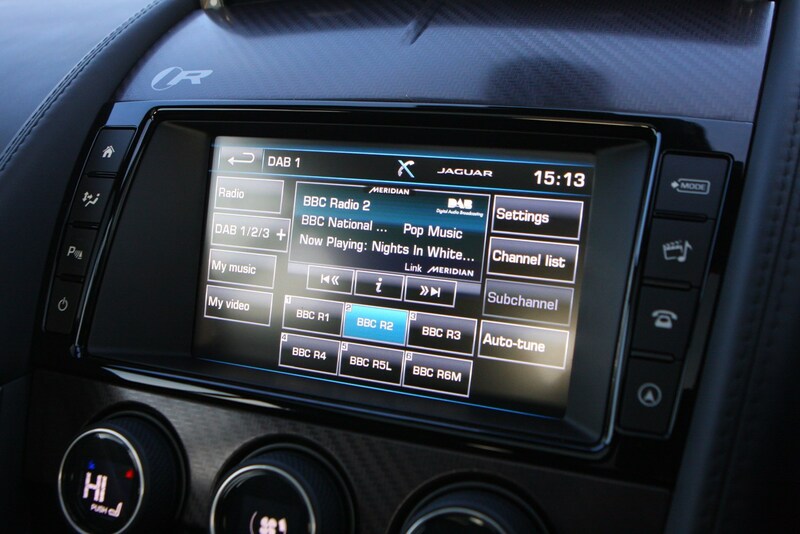 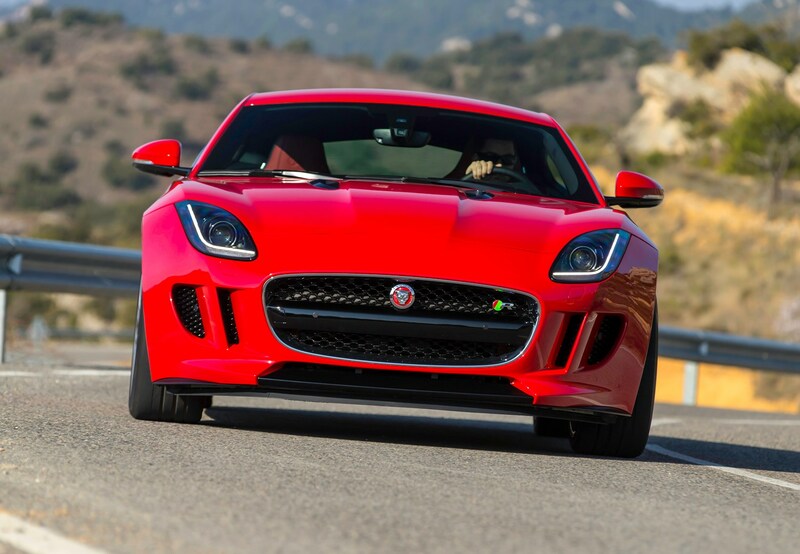 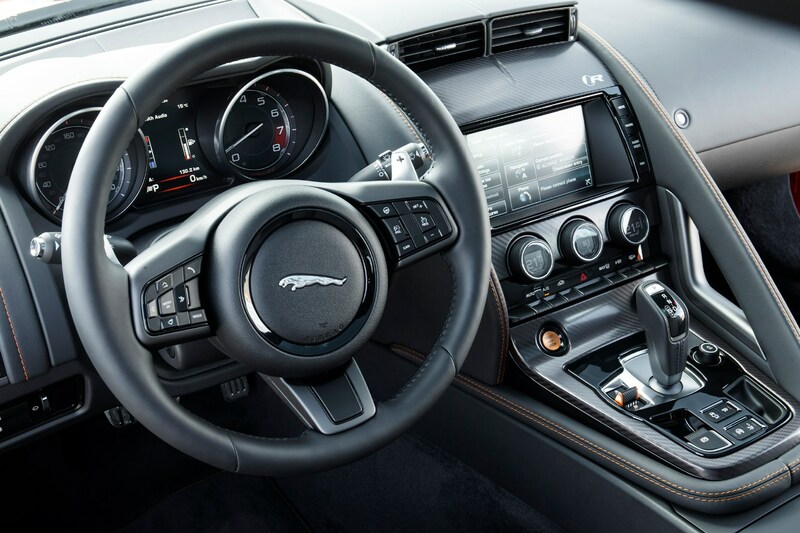 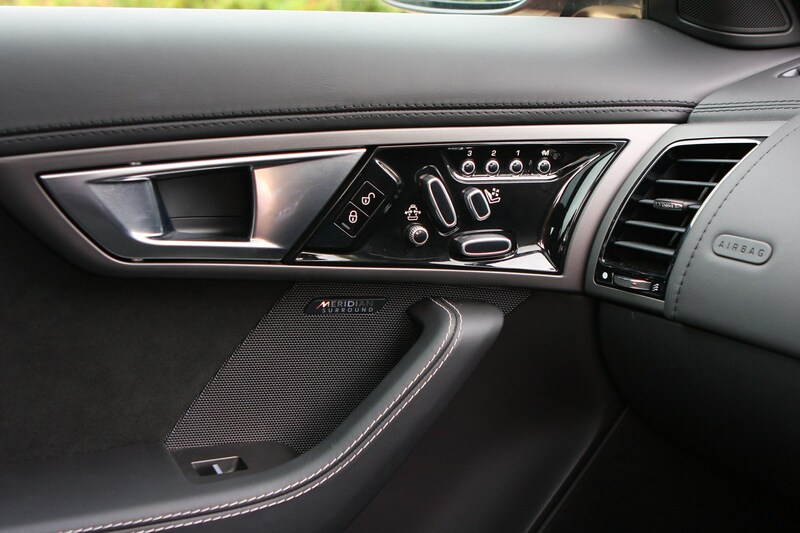 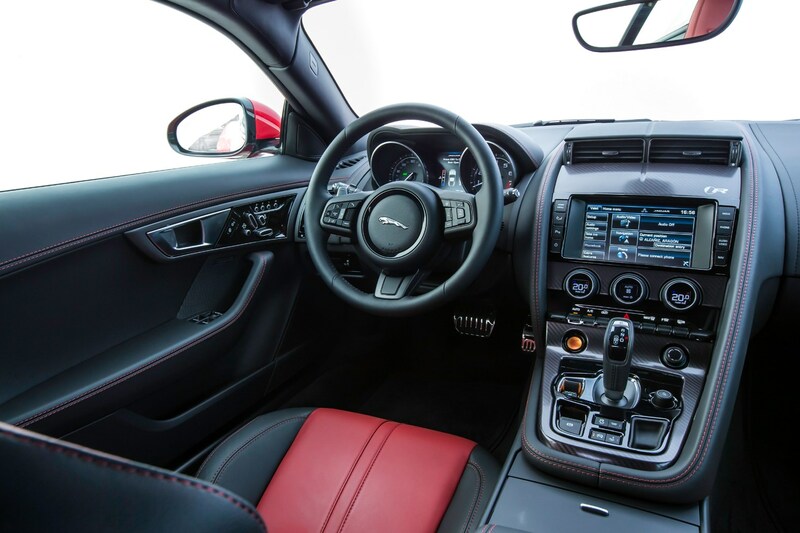 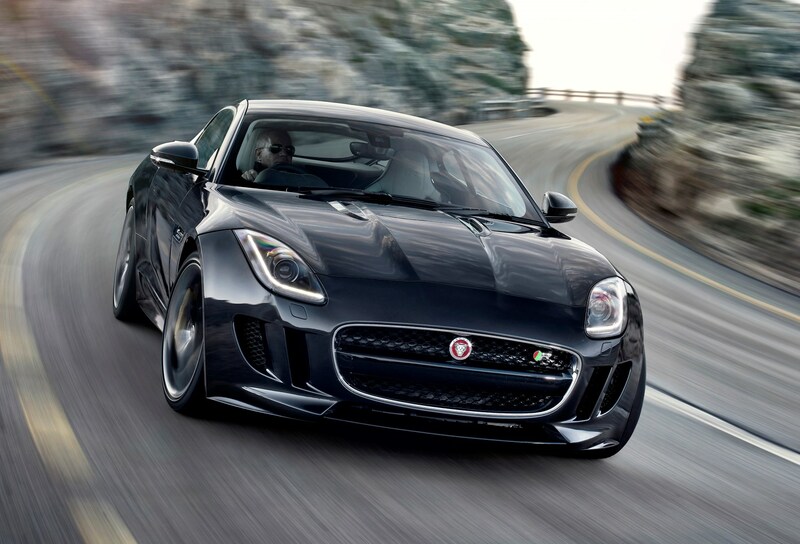 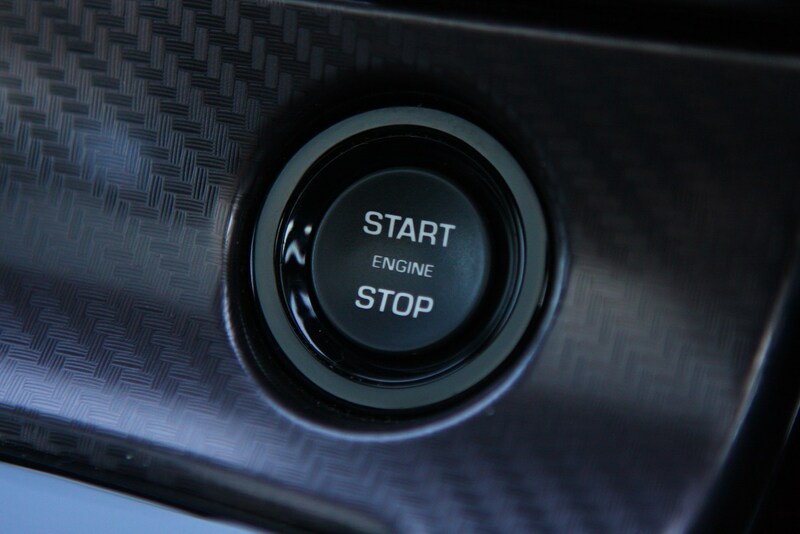 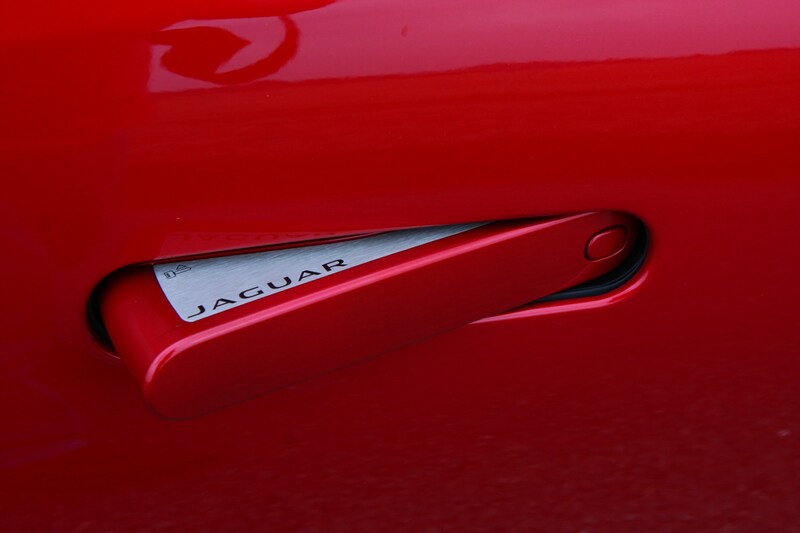 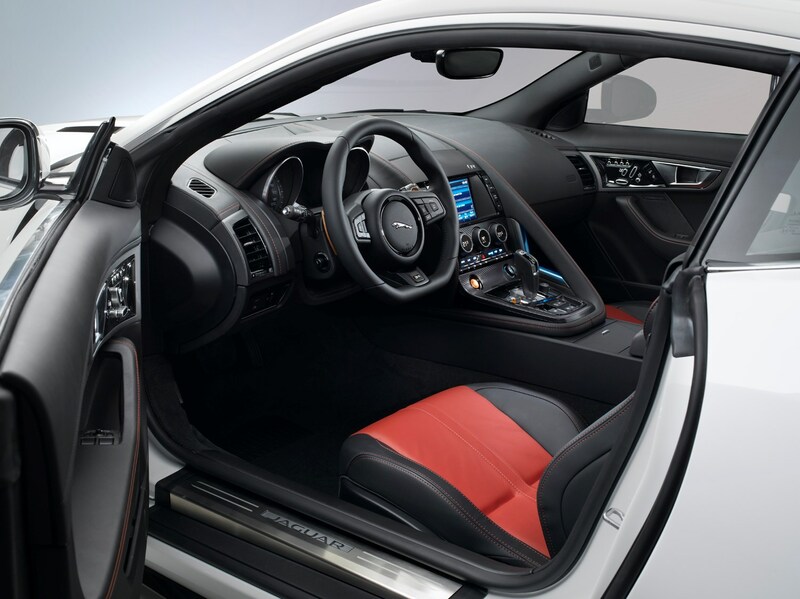 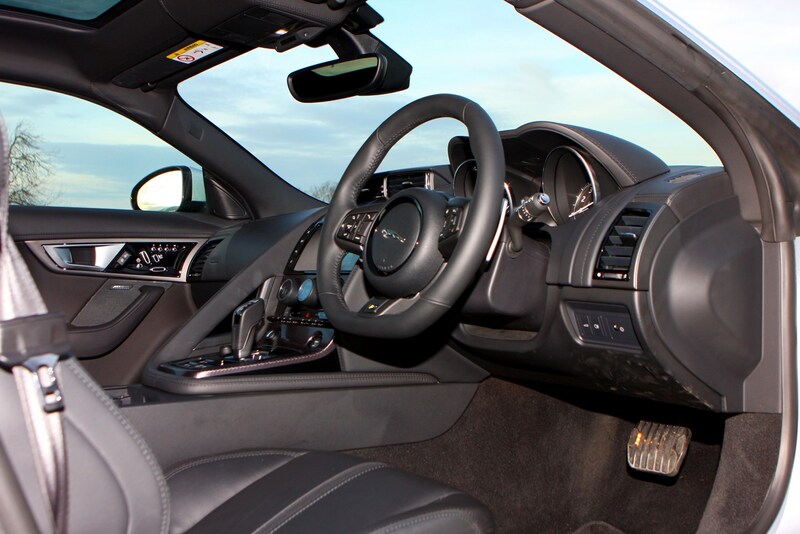 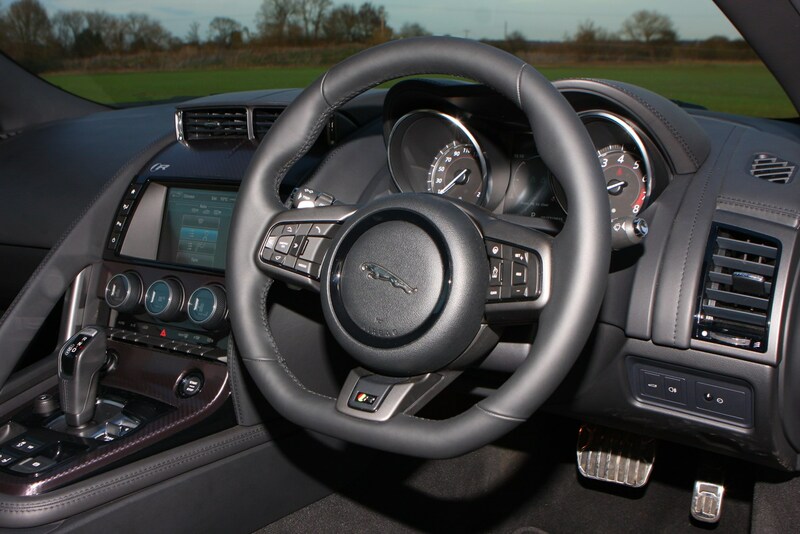 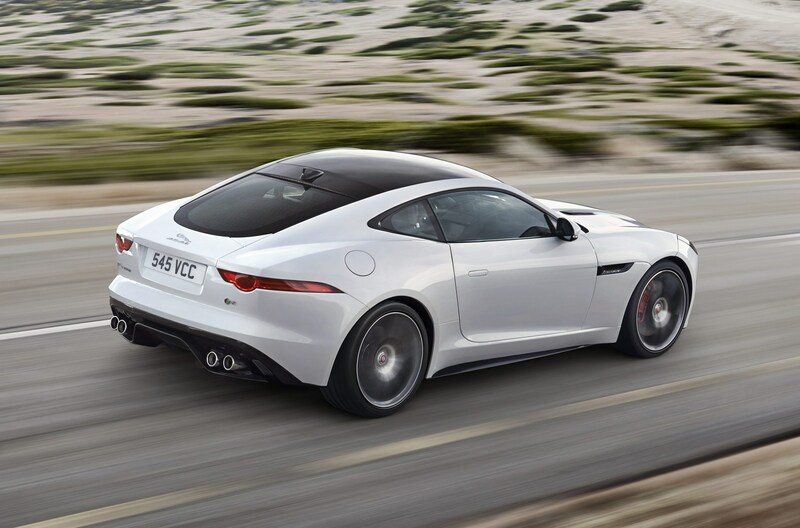 Like the rest of the range, all R Coupes are fitted with Jaguar’s eight-speed ‘Quickshift’ automatic gearbox. 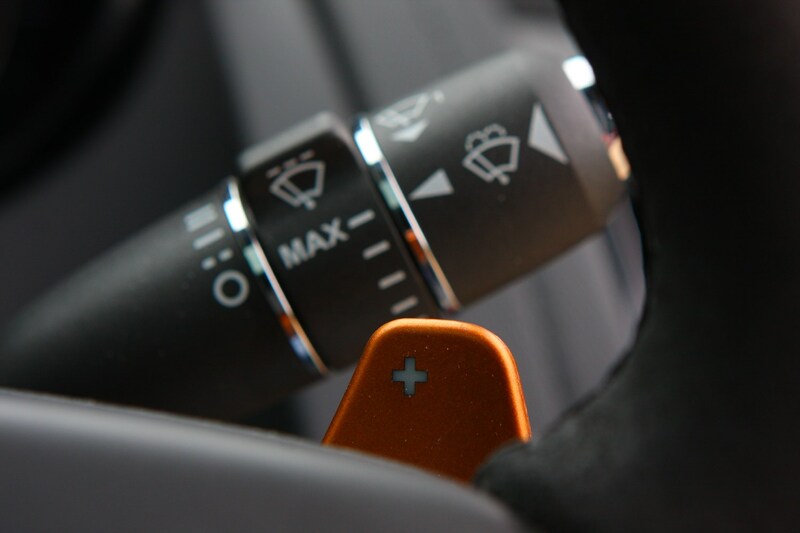 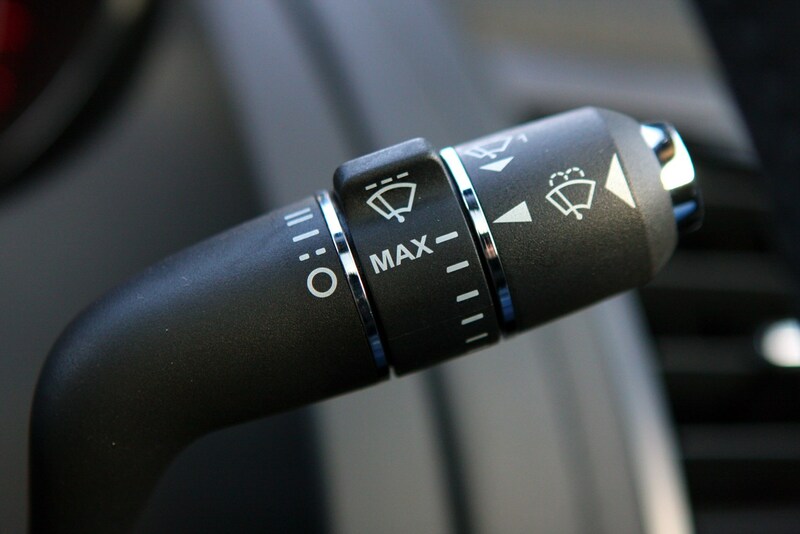 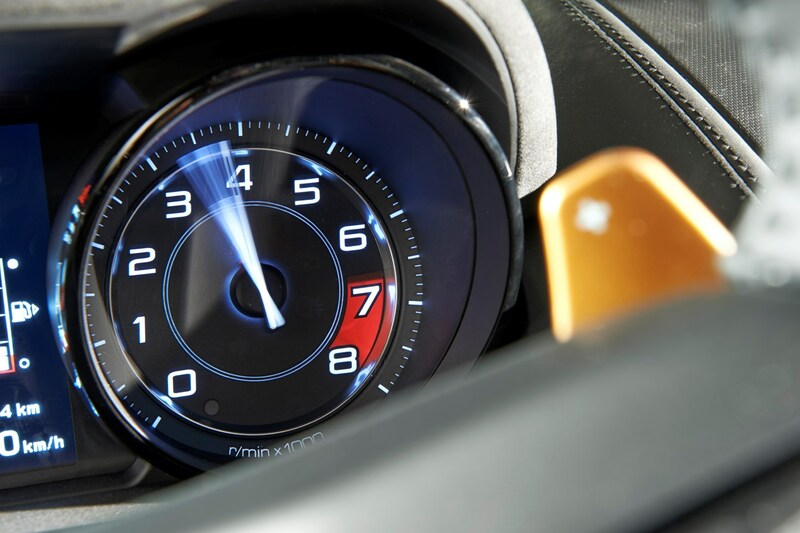 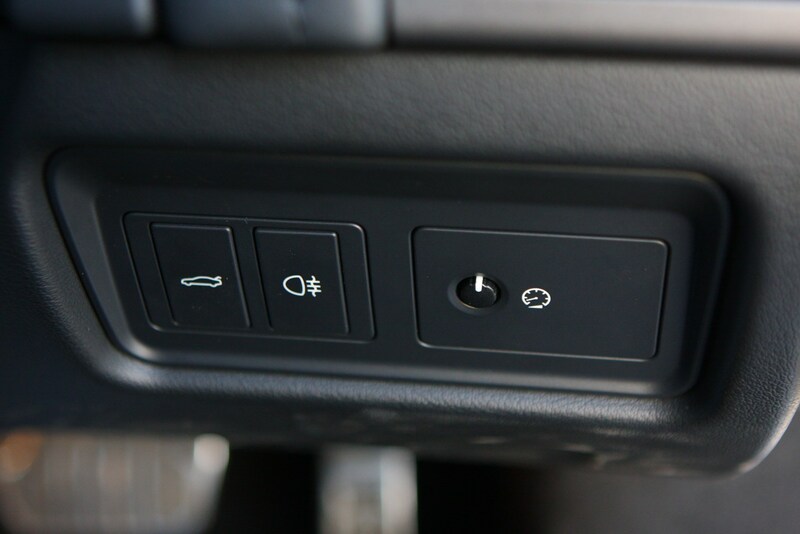 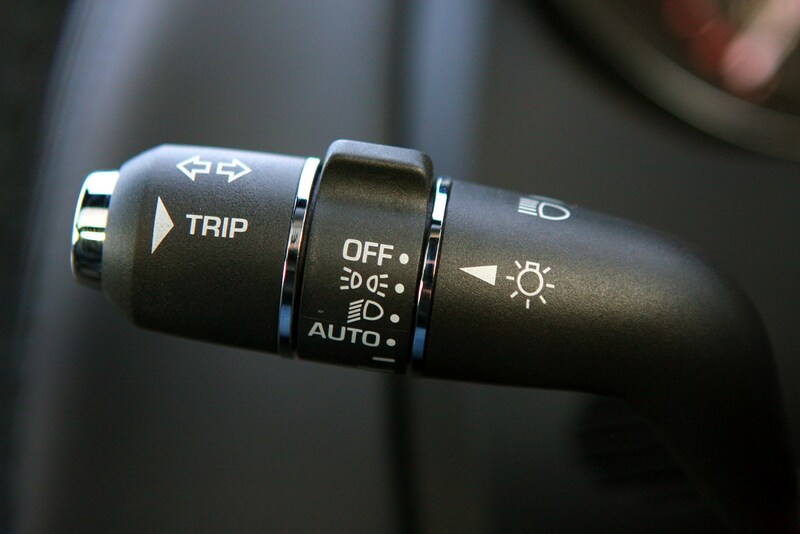 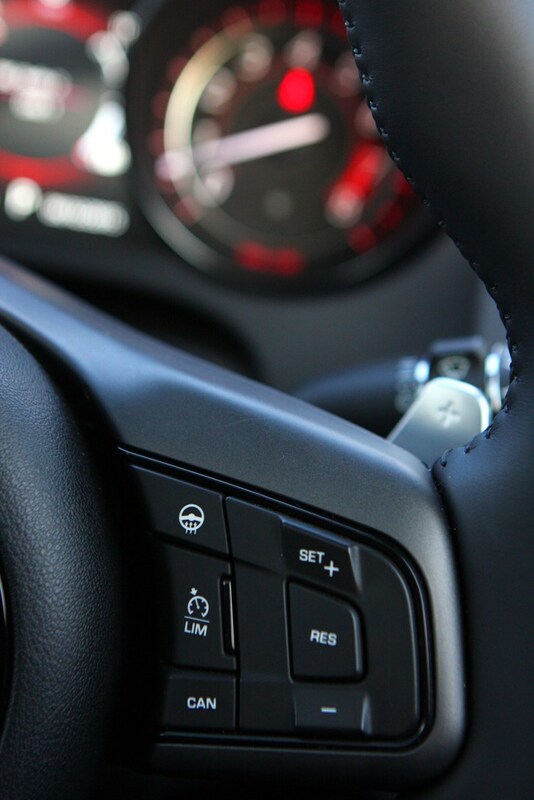 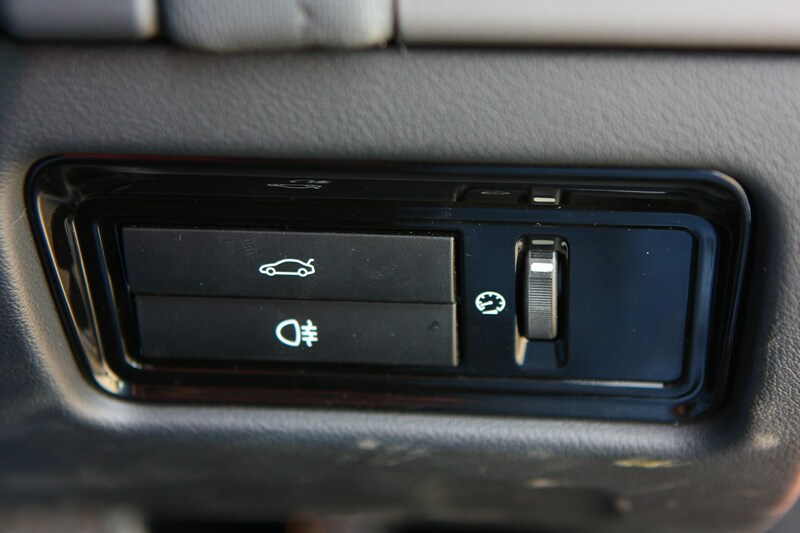 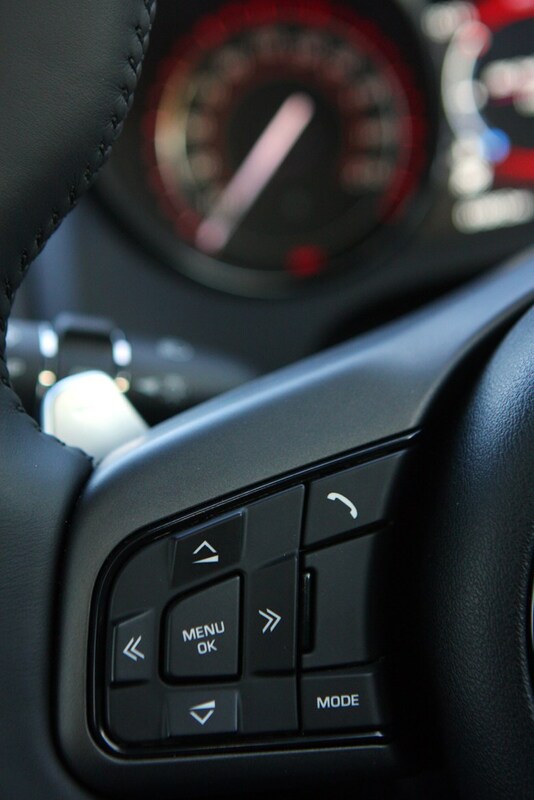 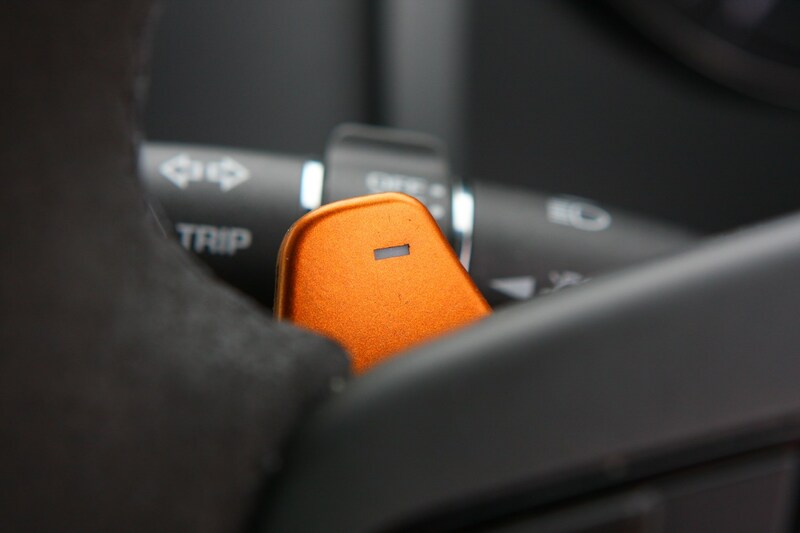 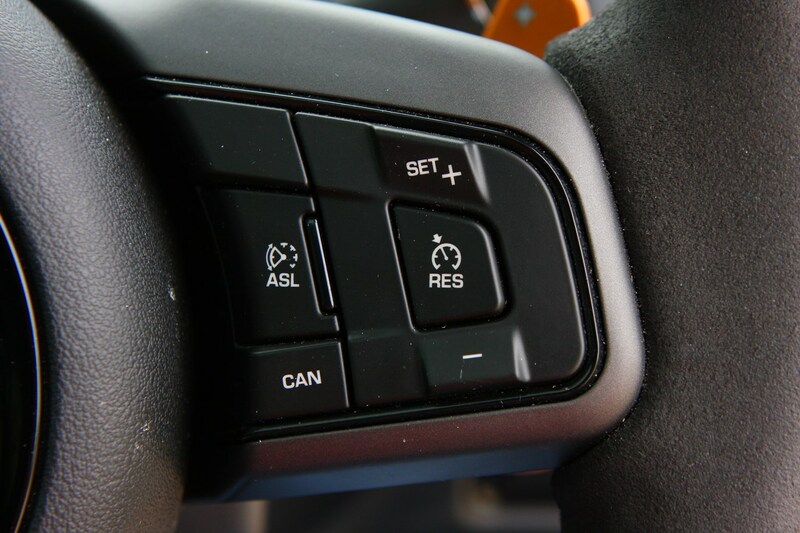 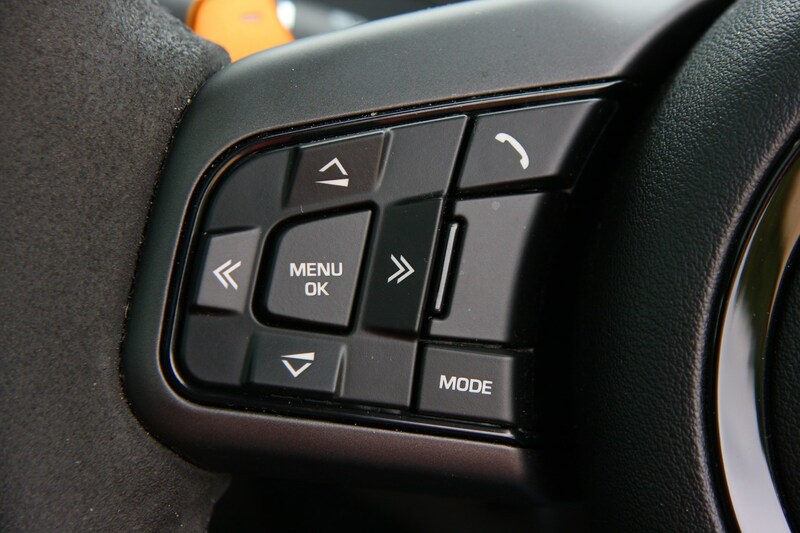 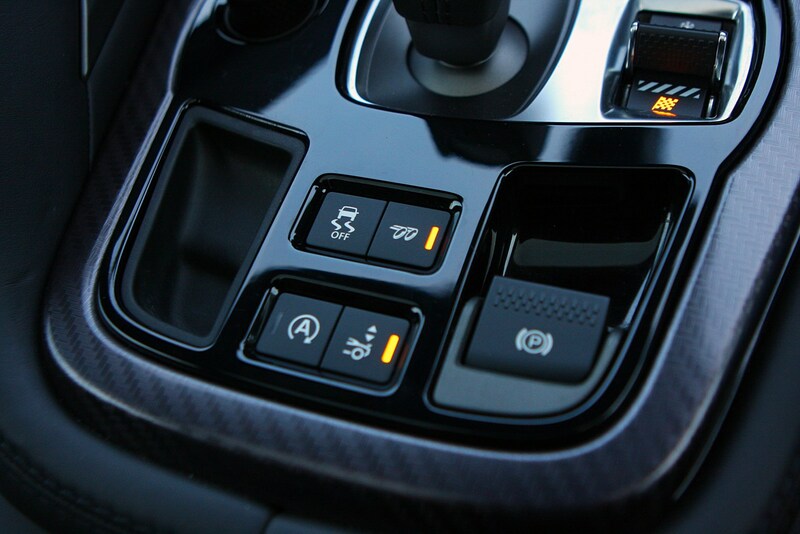 There are steering-mounted paddles for those who like to select gear themselves, though. 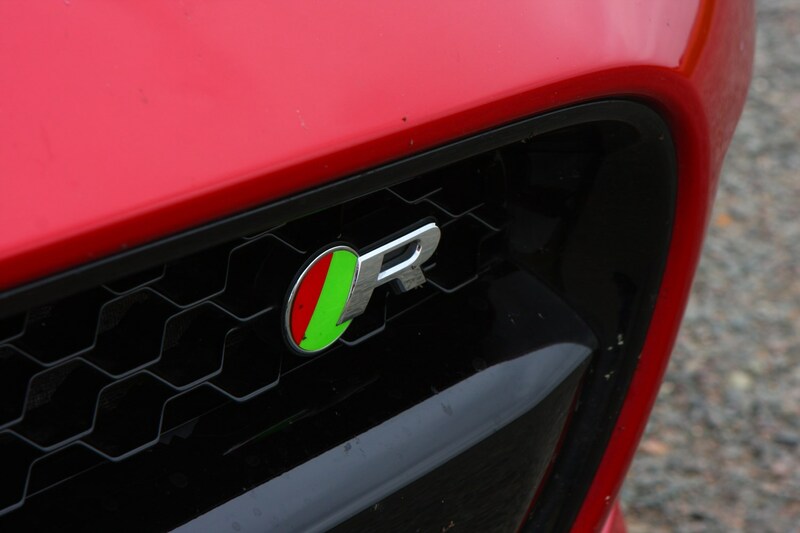 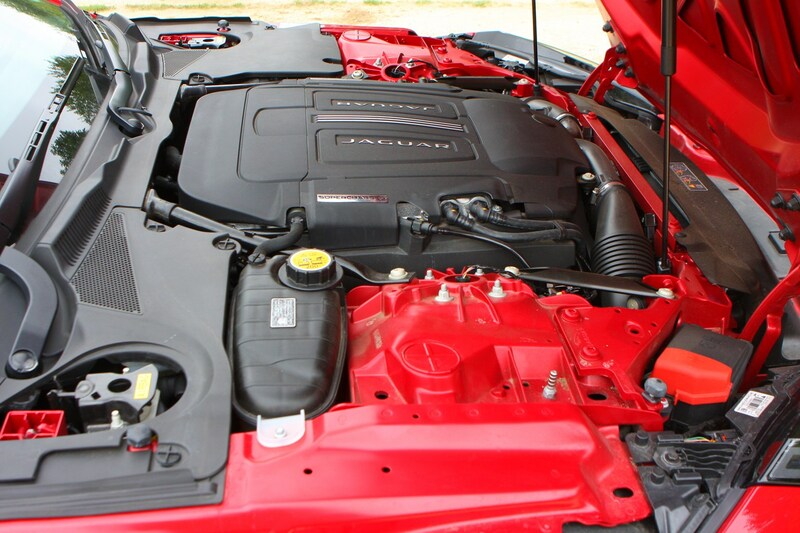 Find out why we were blown away by this gearbox in the Performance section of this review. 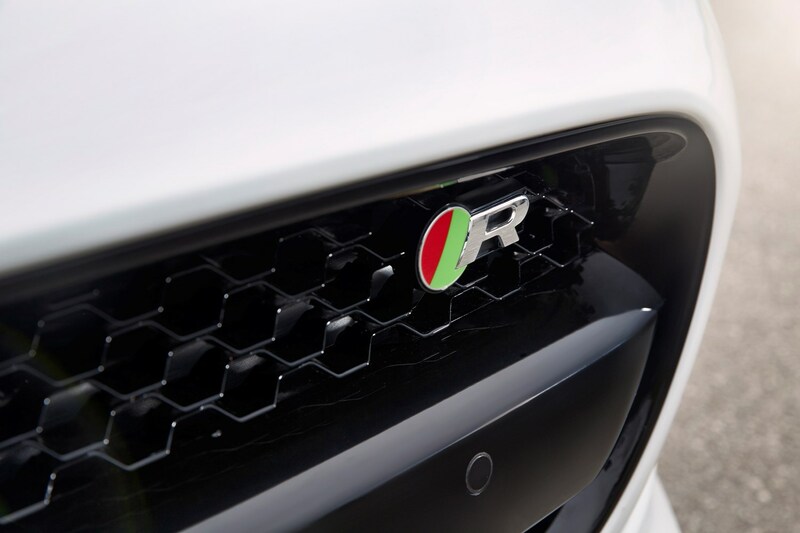 Compared with the rest of the Coupe line-up, the R has a different suspension setup to help keep tabs on the extra power. 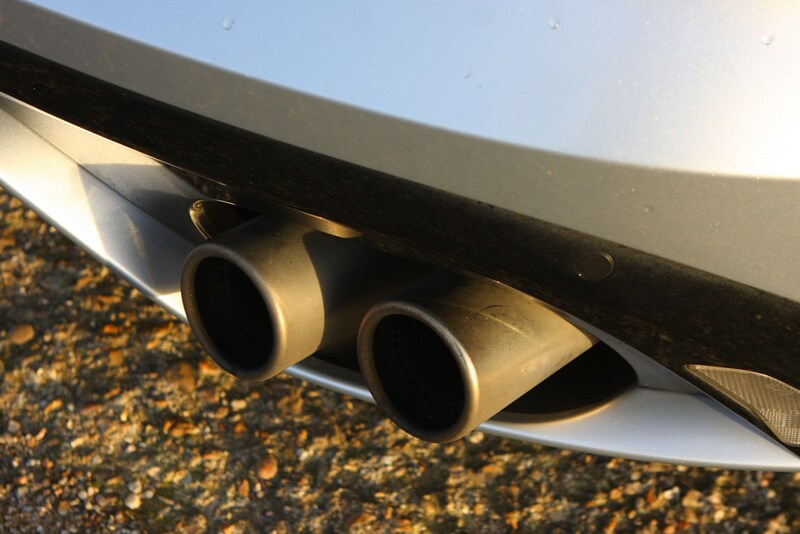 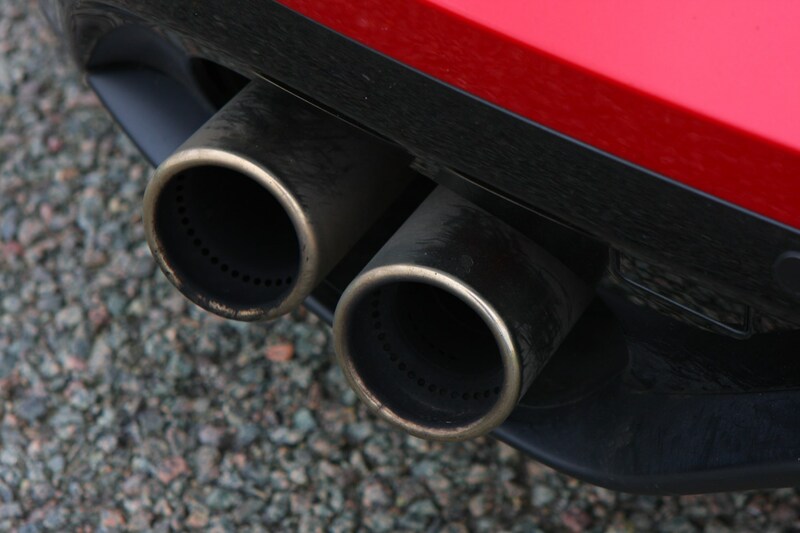 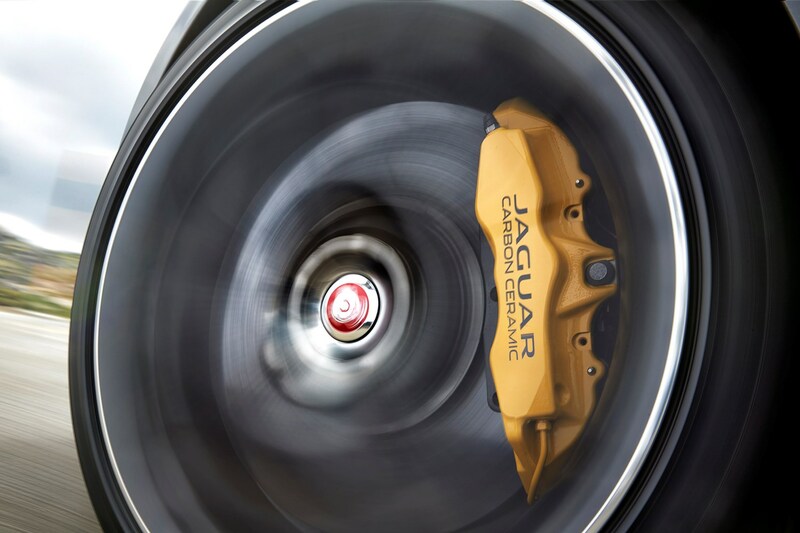 Its adaptive dampers are automatically adjusted up to 500 times a second for optimum stability. 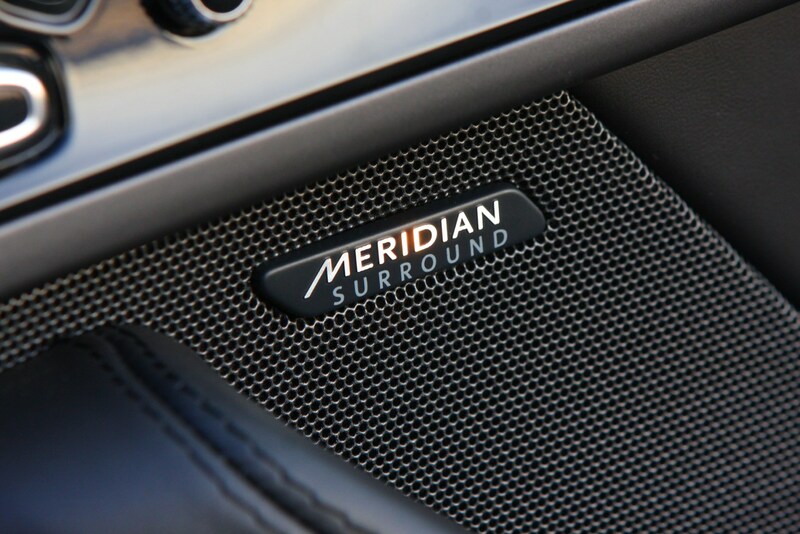 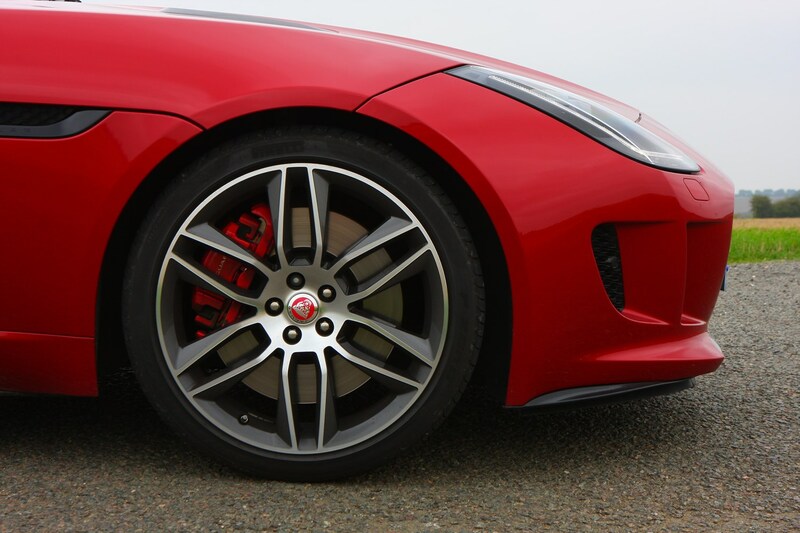 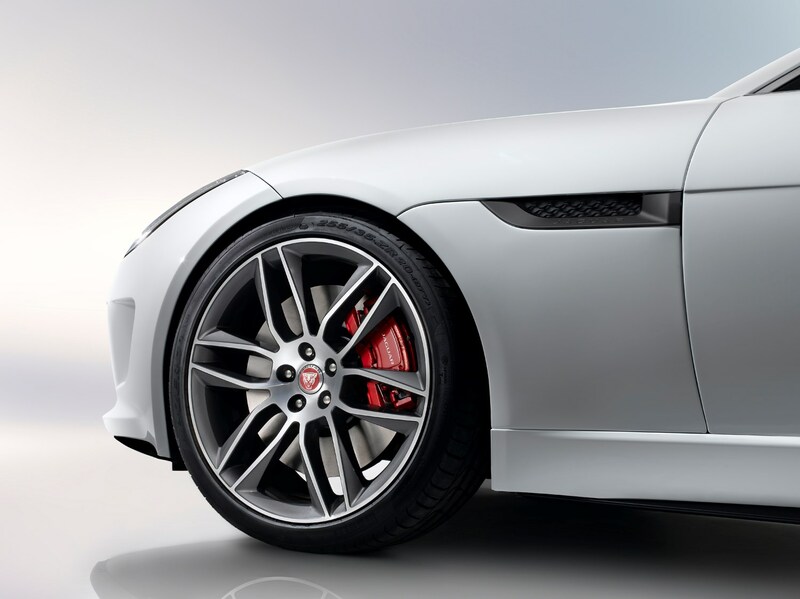 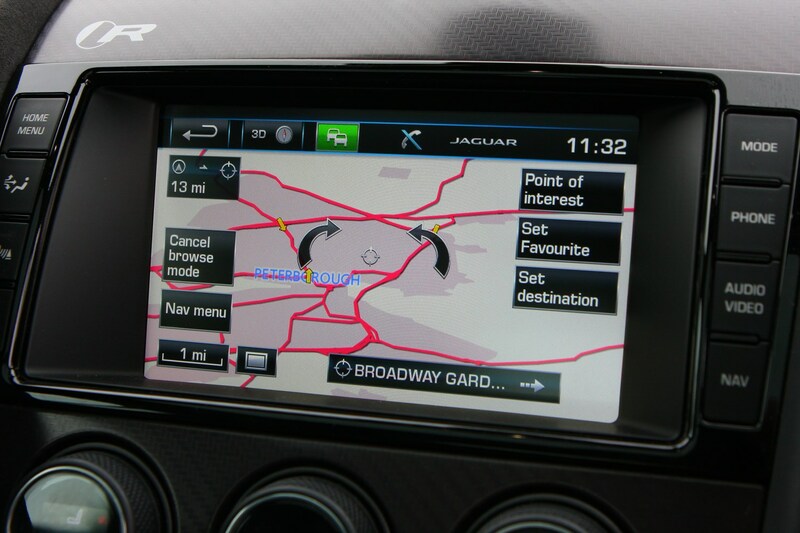 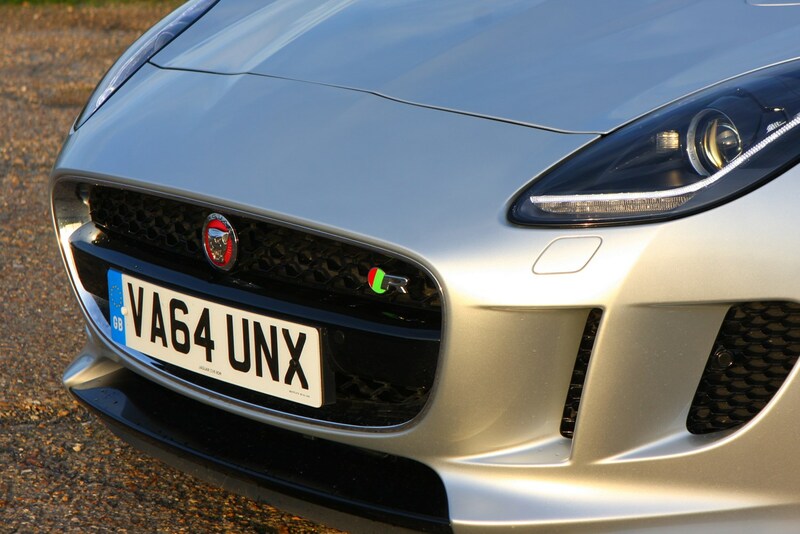 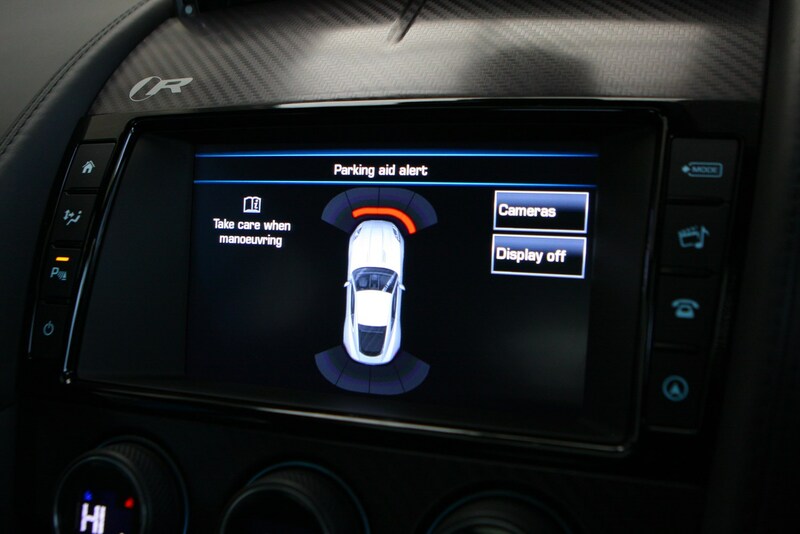 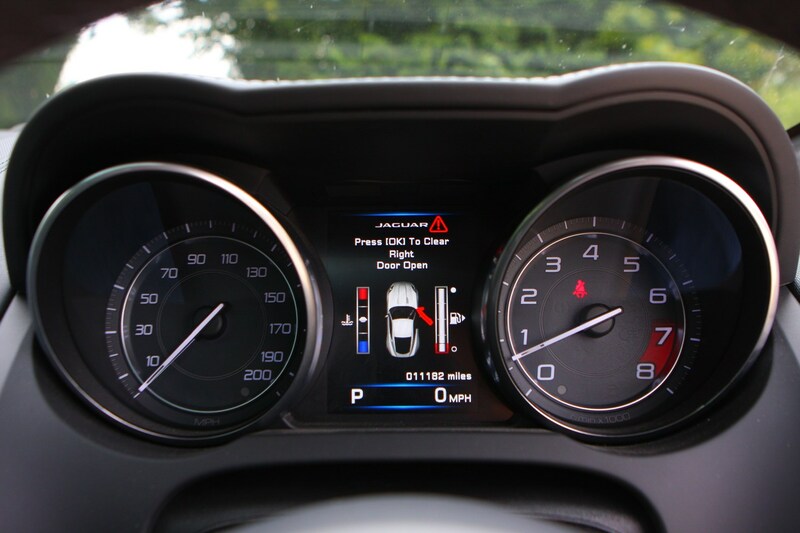 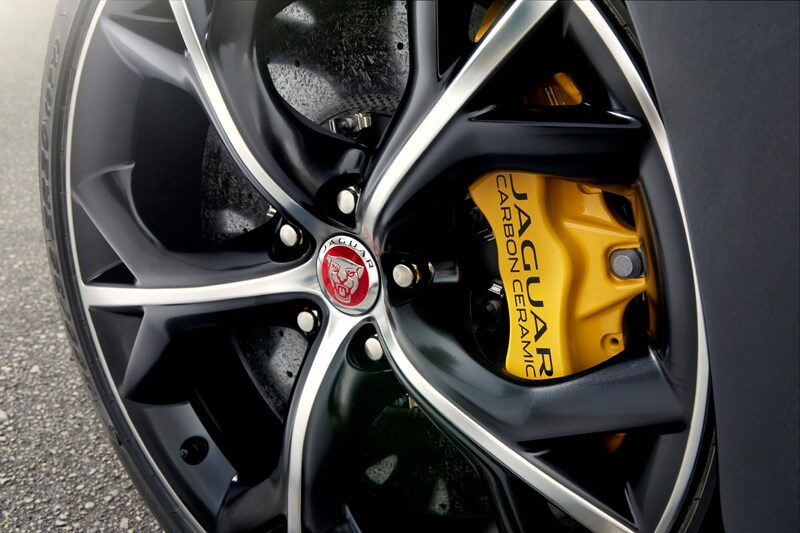 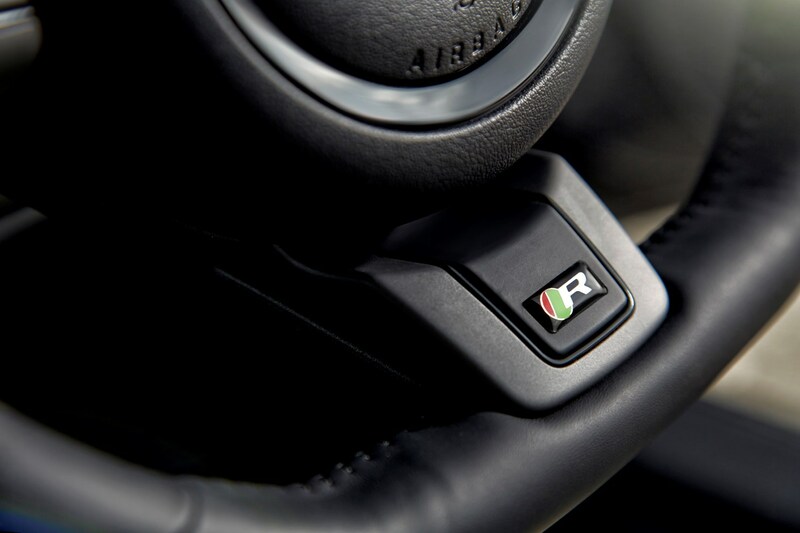 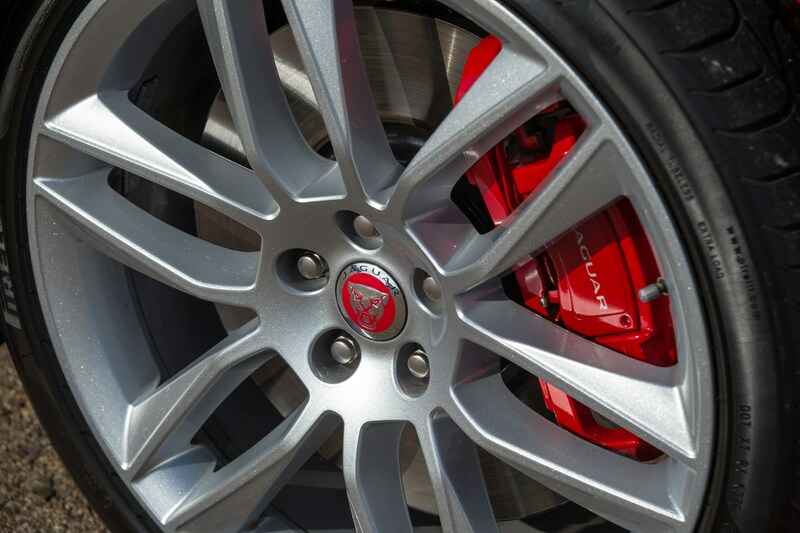 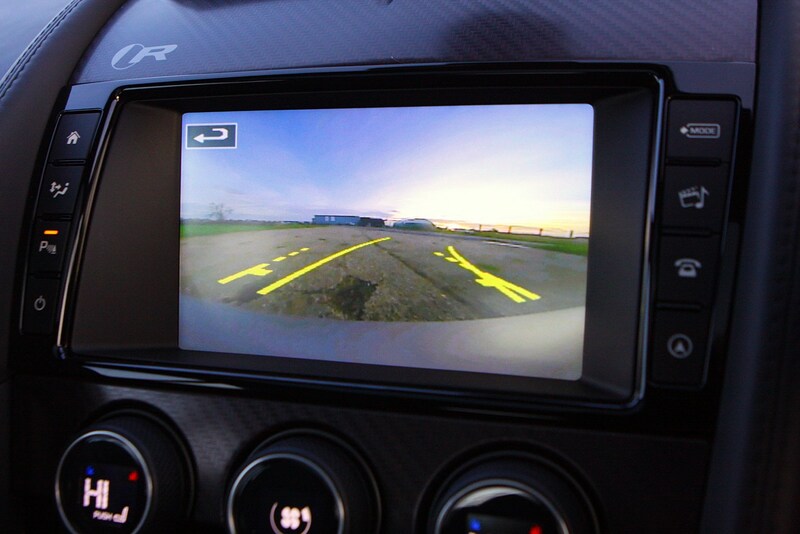 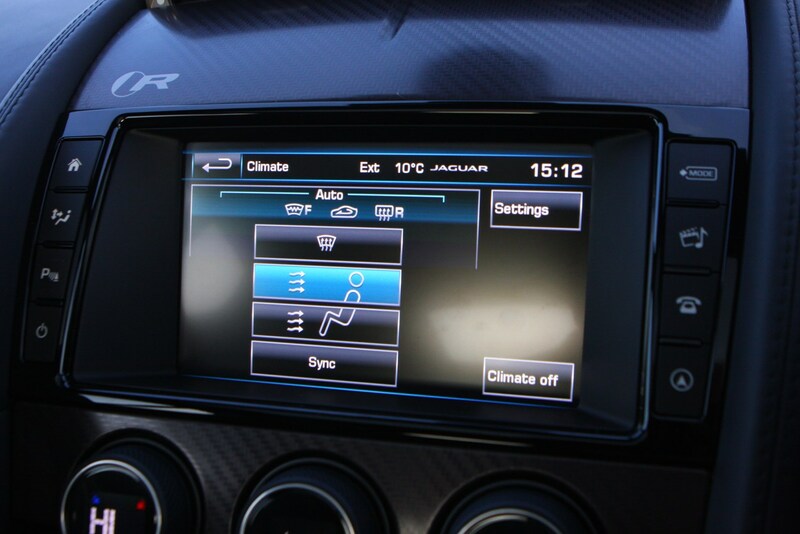 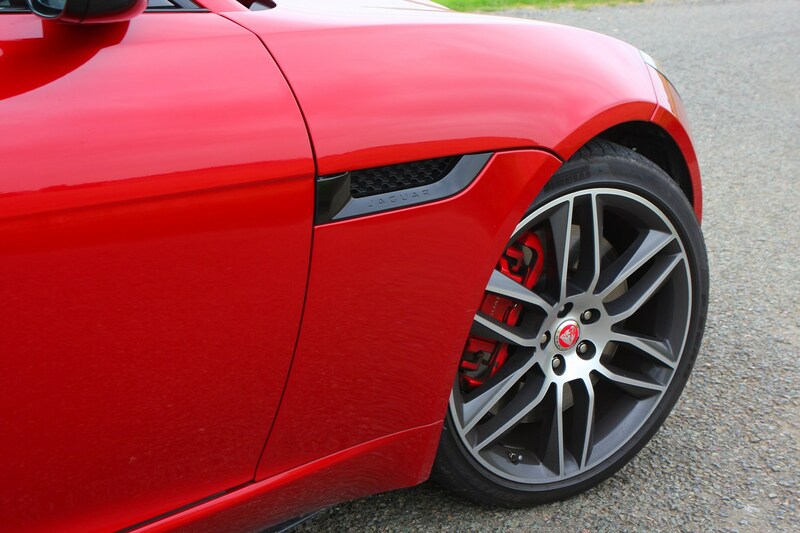 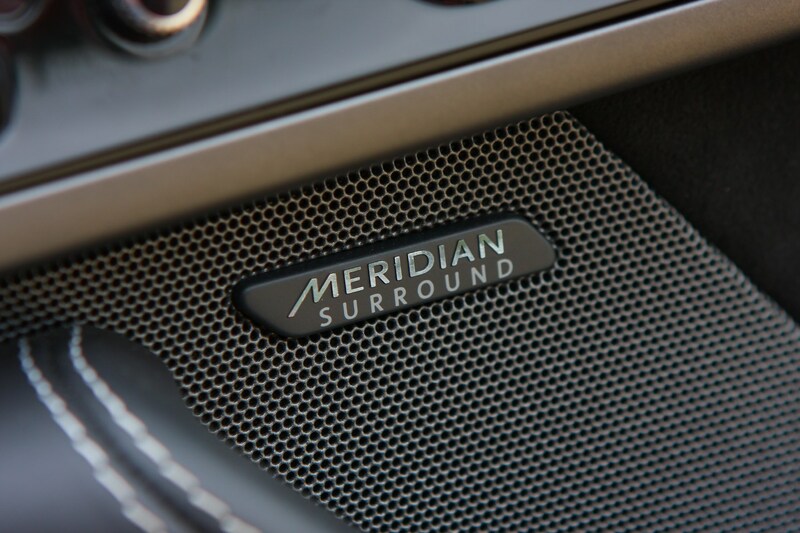 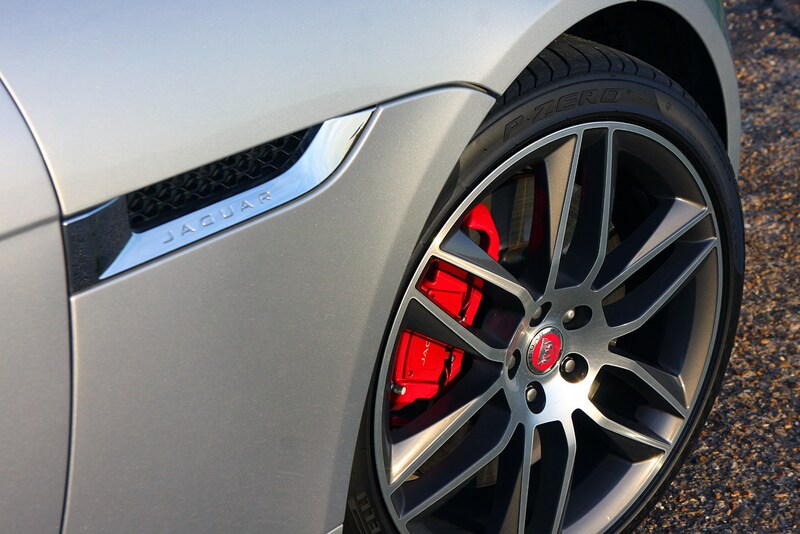 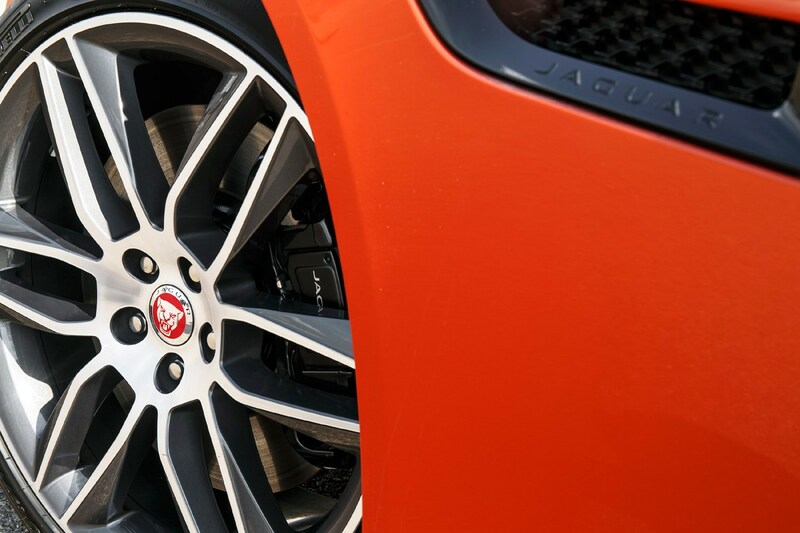 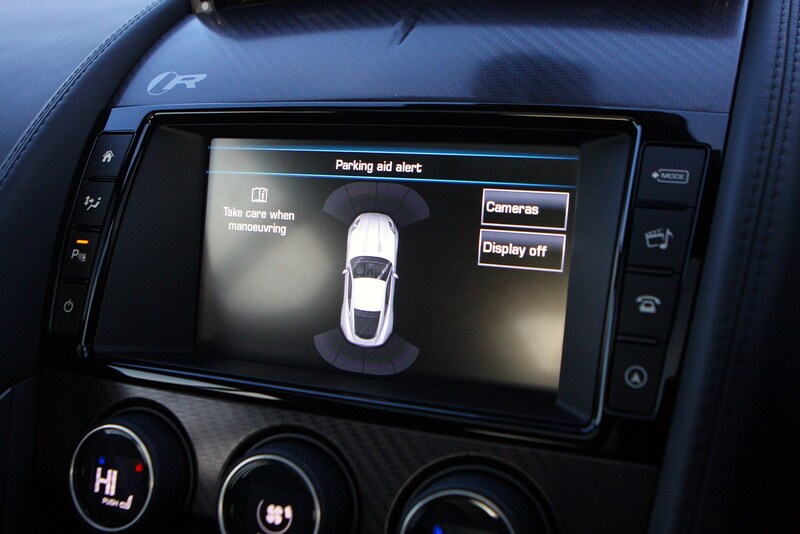 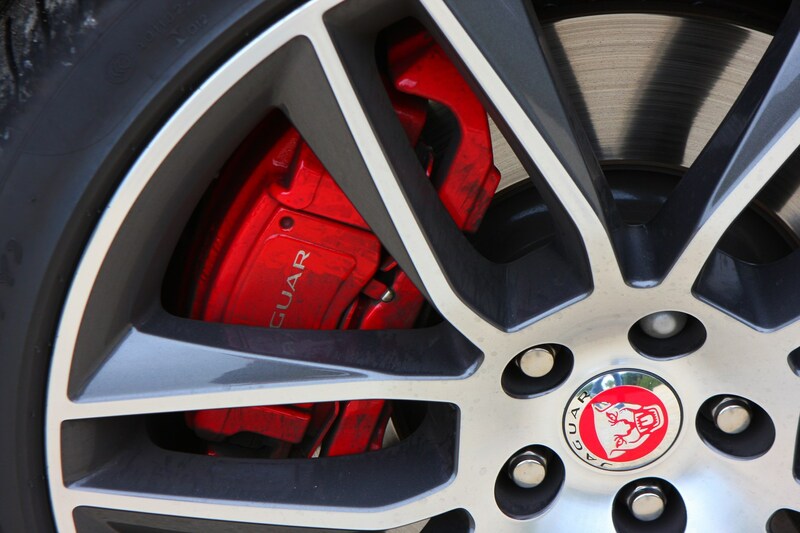 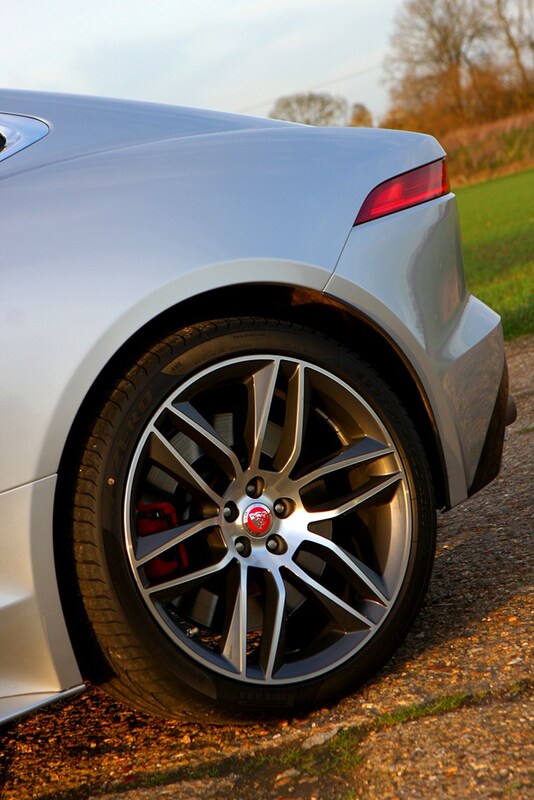 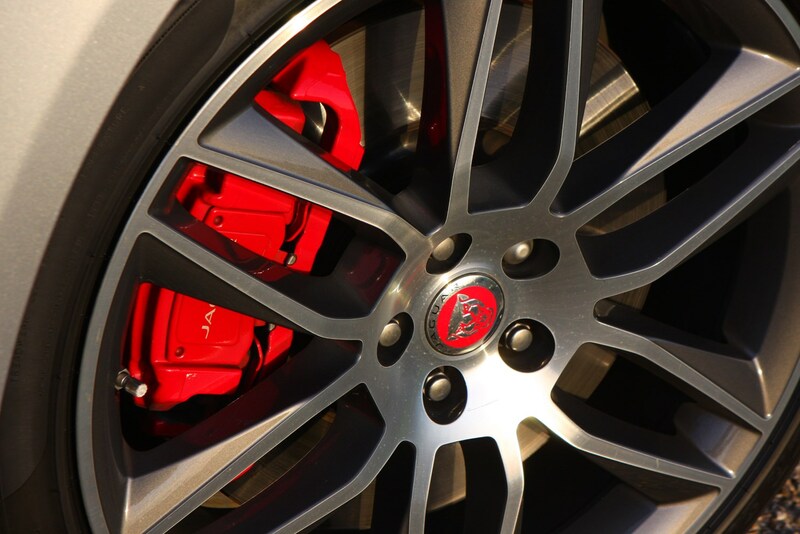 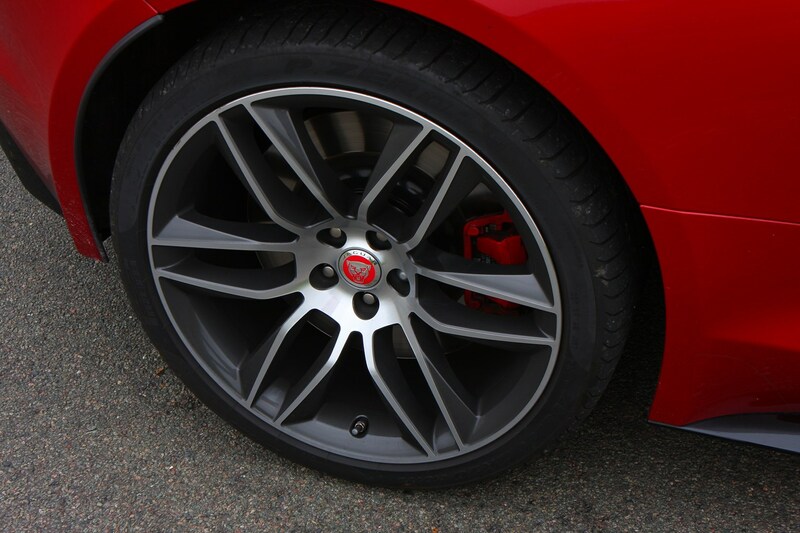 As standard the F-Type R is also fitted with what Jaguar calls an Electronic Active Differential, which constantly monitors and adjusts the balance of power between the rear wheels. 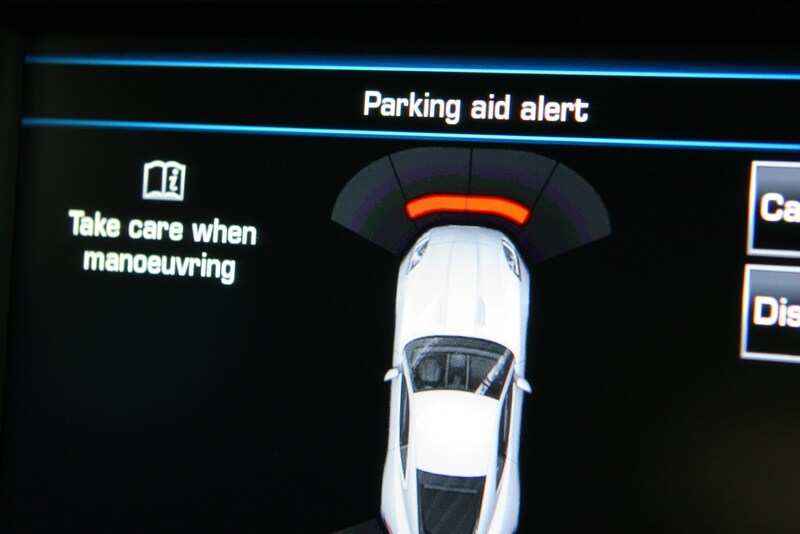 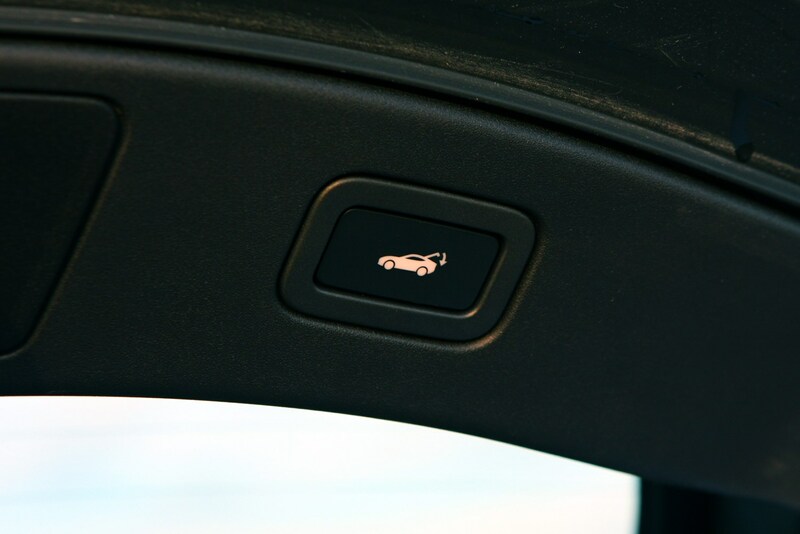 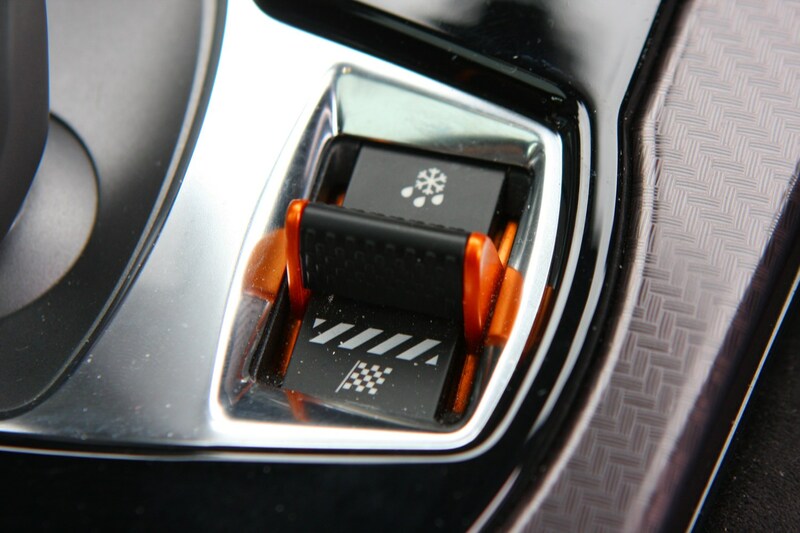 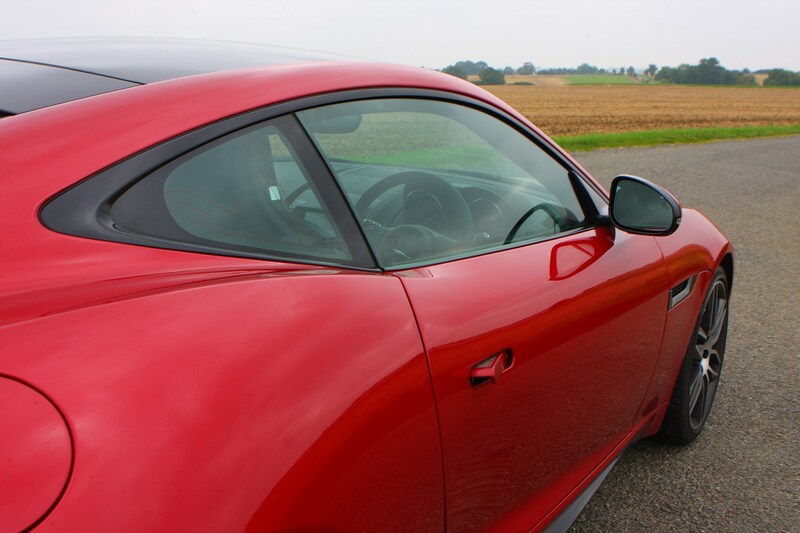 It works in conjunction with a Torque Vectoring braking system, which can gently apply the brakes to the inside wheels when cornering to keep you going in the direction you intended, even if you’ve got in too fast. 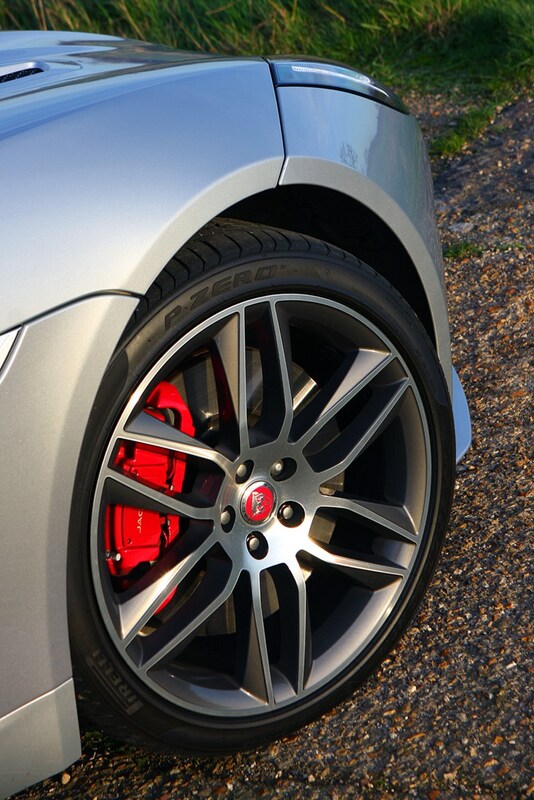 Carbon ceramic brakes, which save weight and resist fade more effectively, are available as an option, as are special high-performance tyres and a panoramic sunroof. 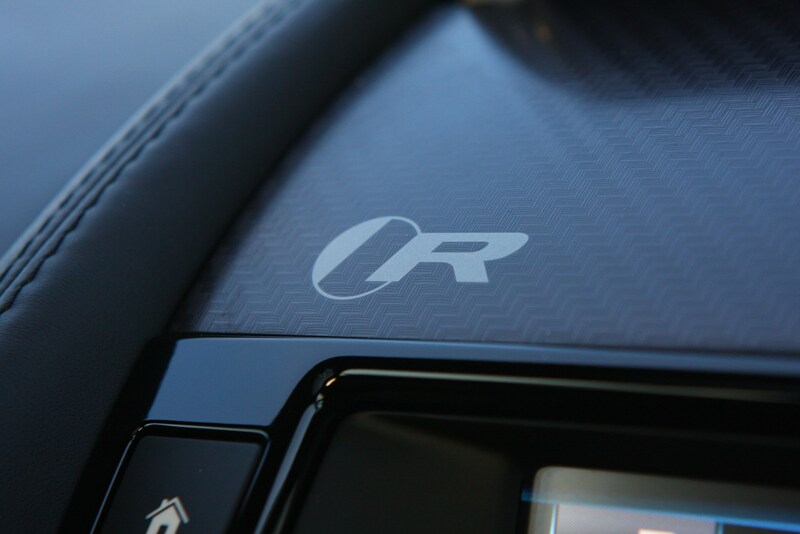 The R Coupe can be told apart by 20-inch silver alloy wheels and ‘R’ emblems on the front grille and embossed on the seats and steering wheel. 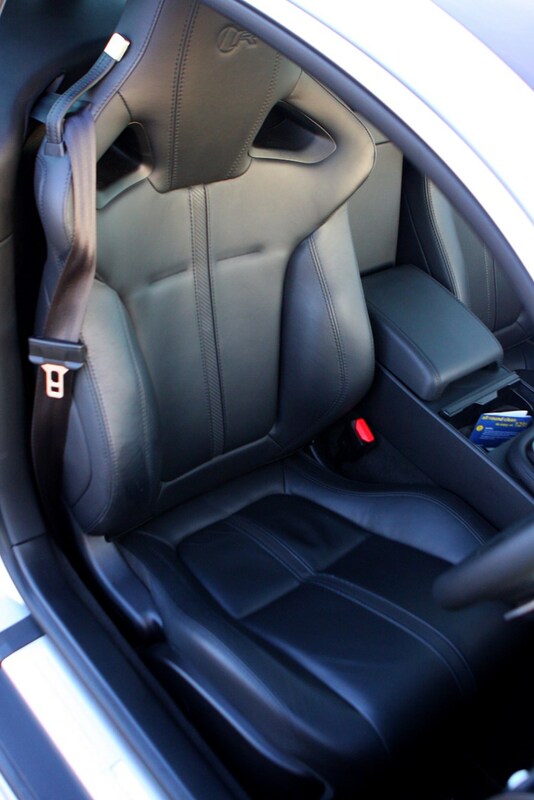 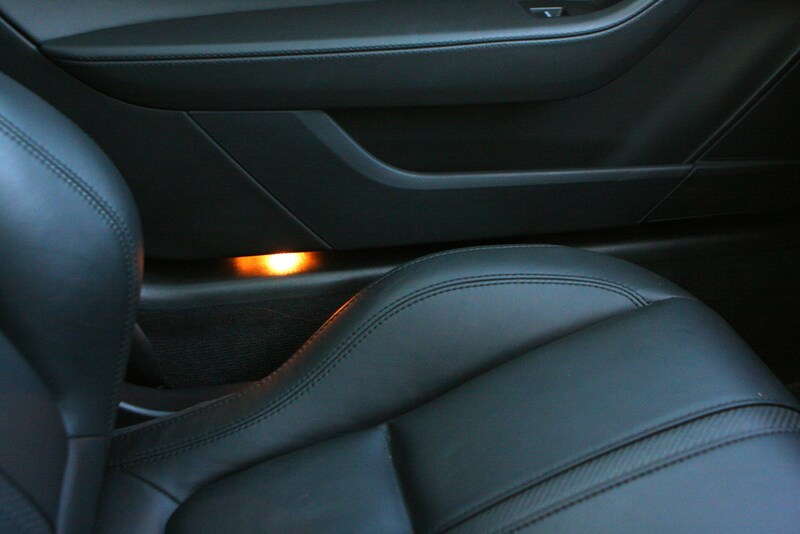 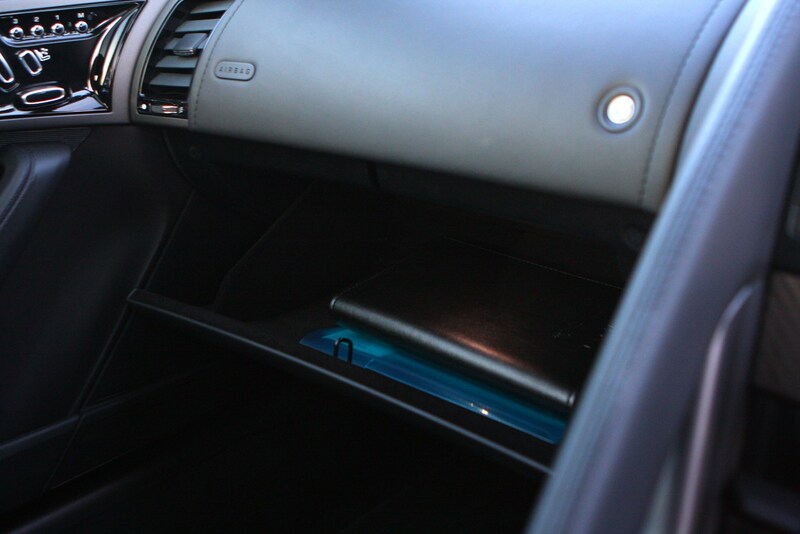 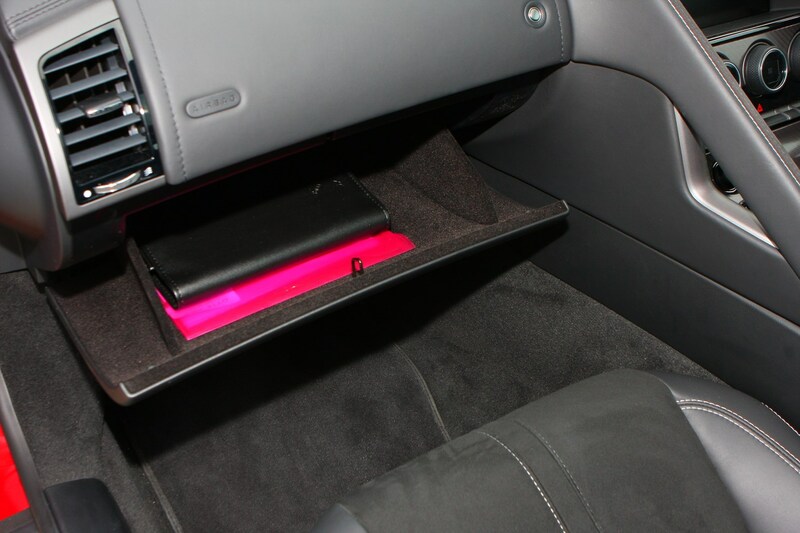 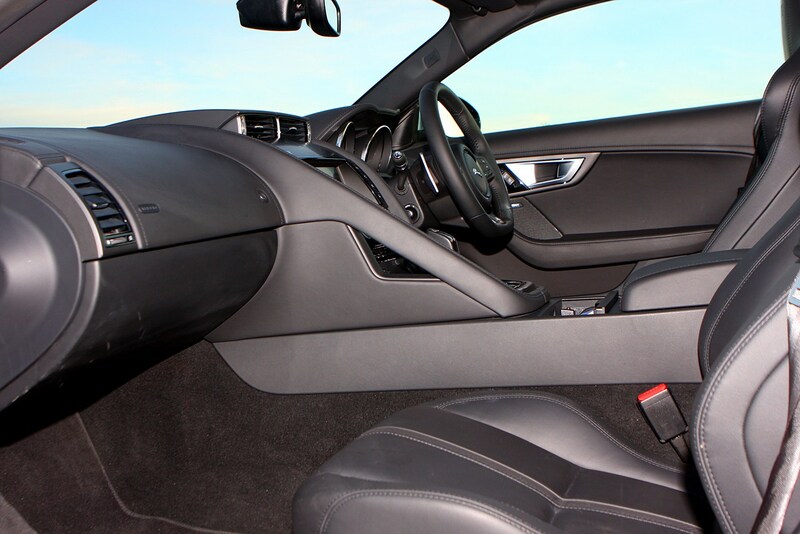 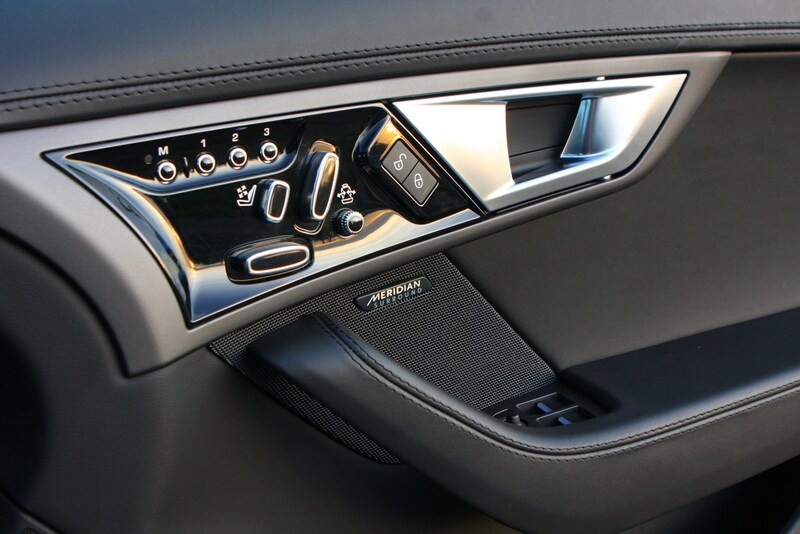 There’s plenty of leather upholstery inside, with a combination of leather and suede available as an option. 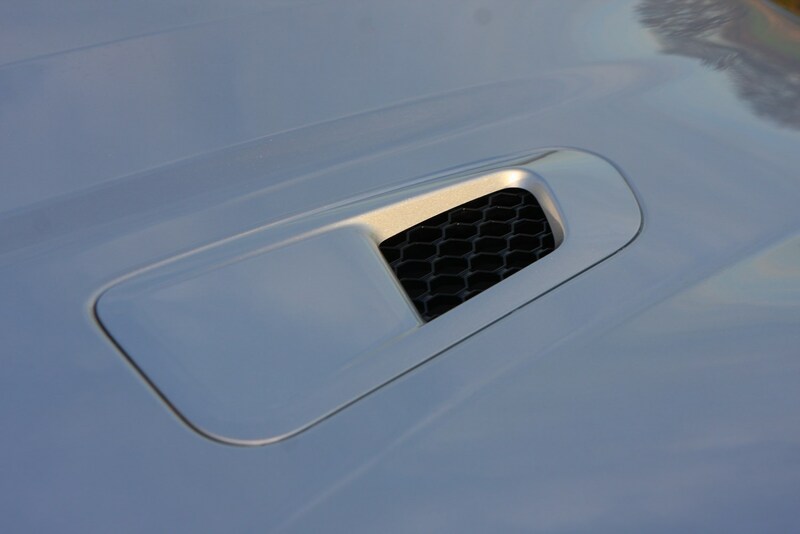 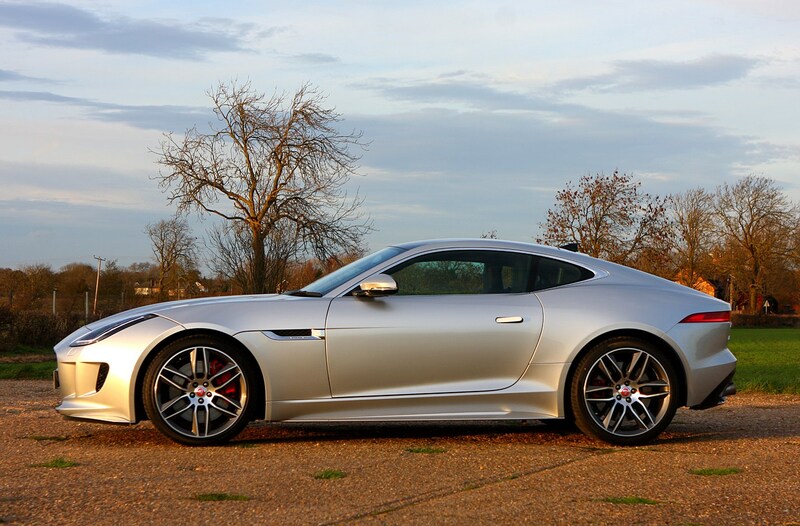 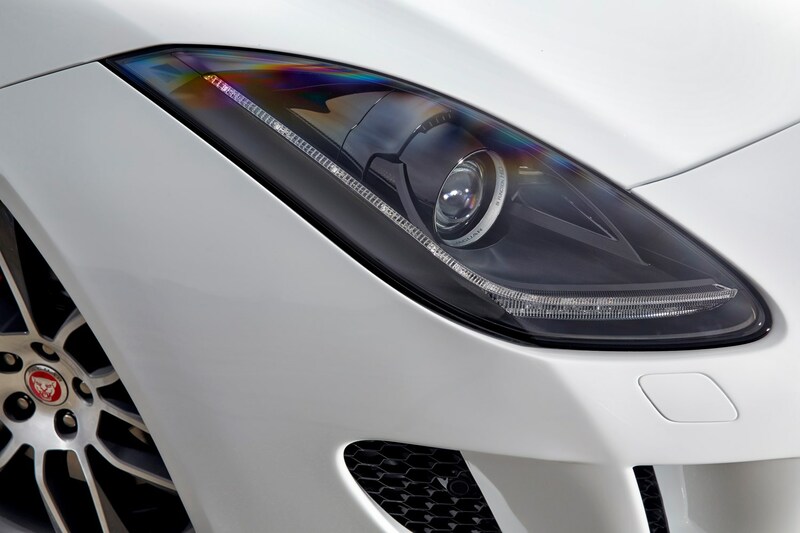 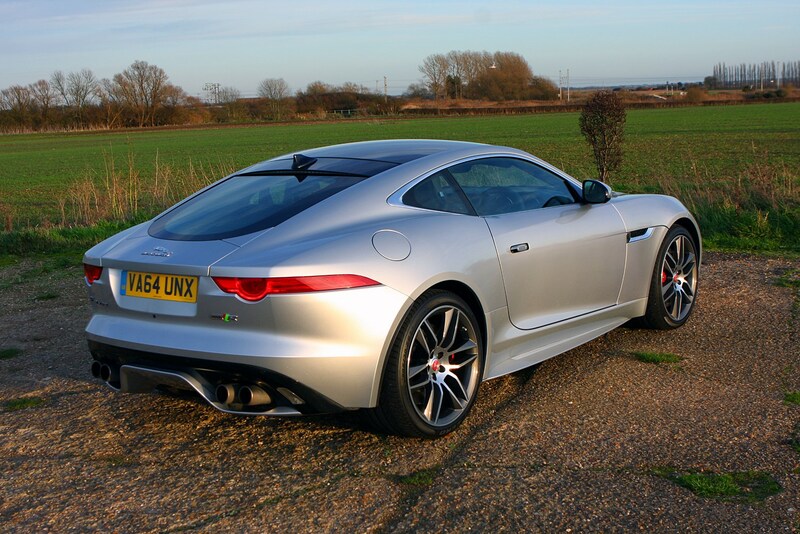 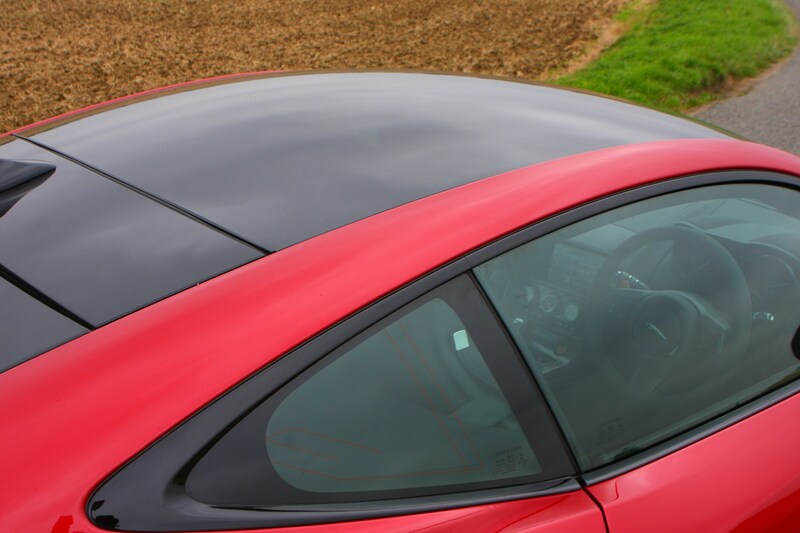 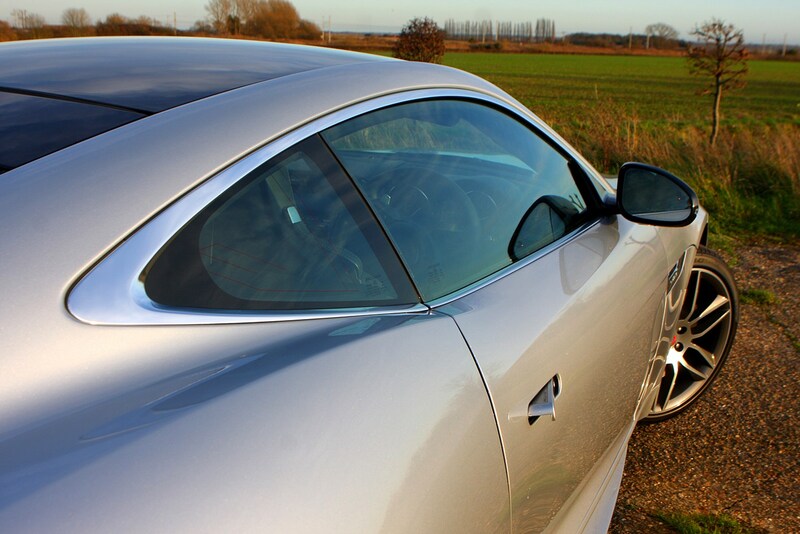 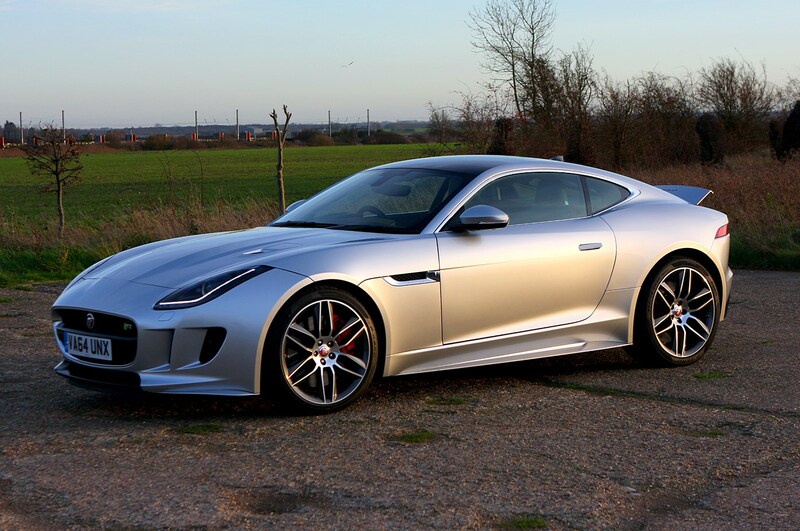 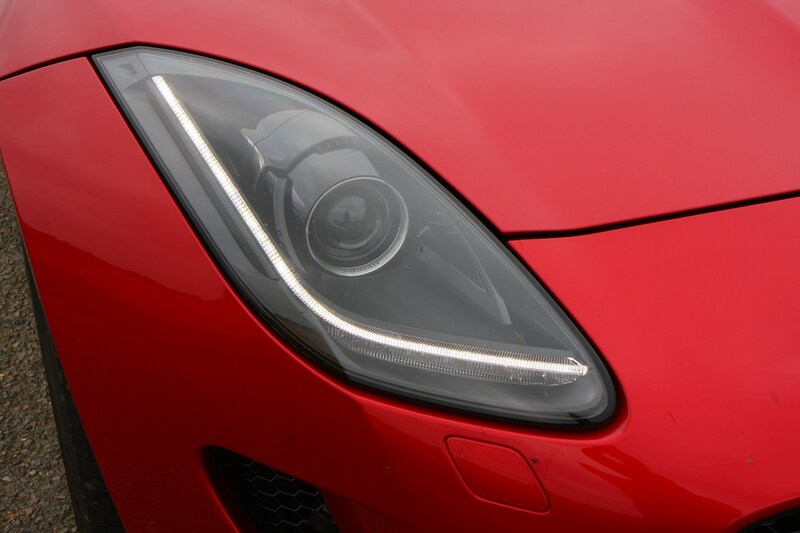 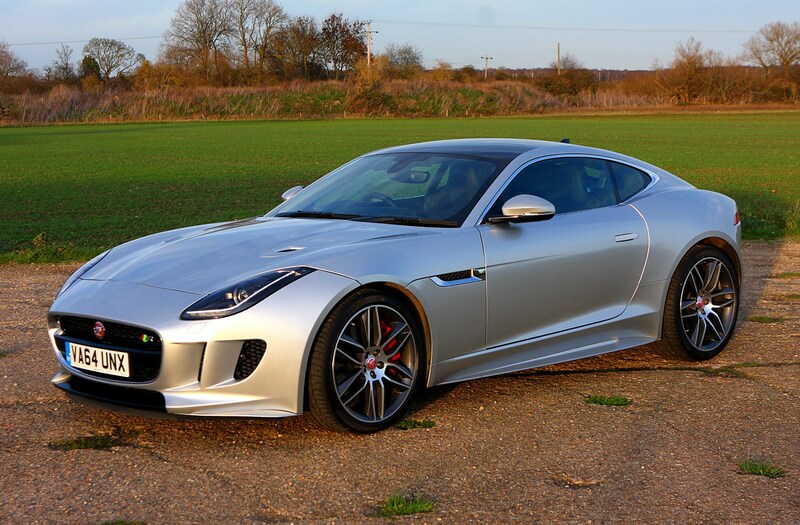 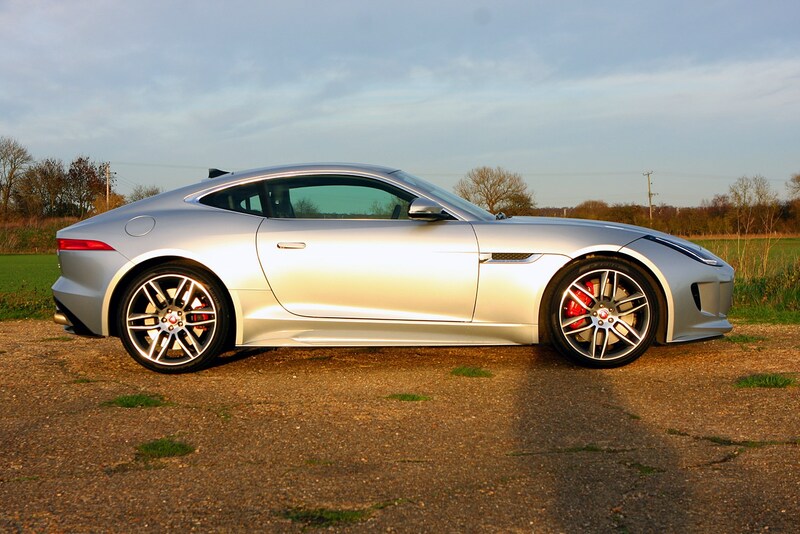 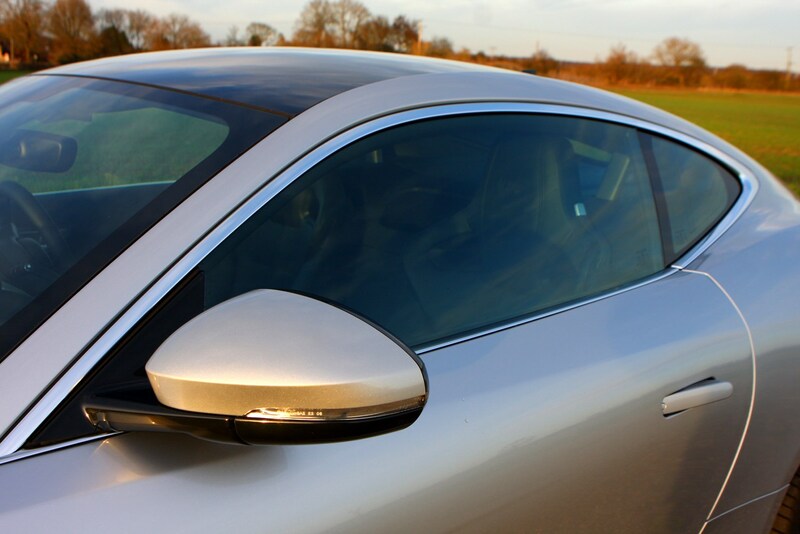 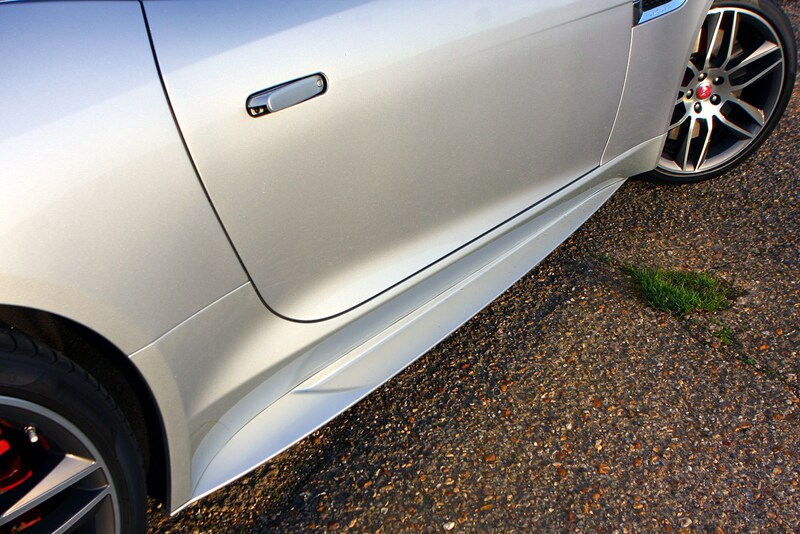 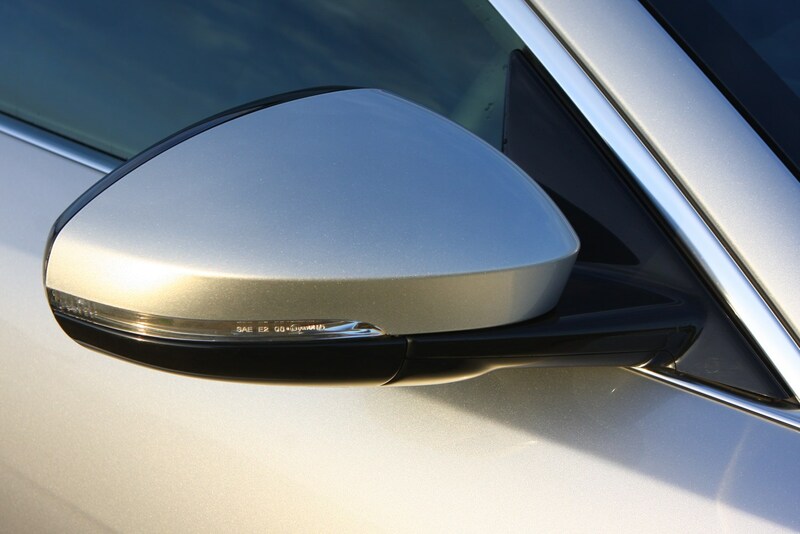 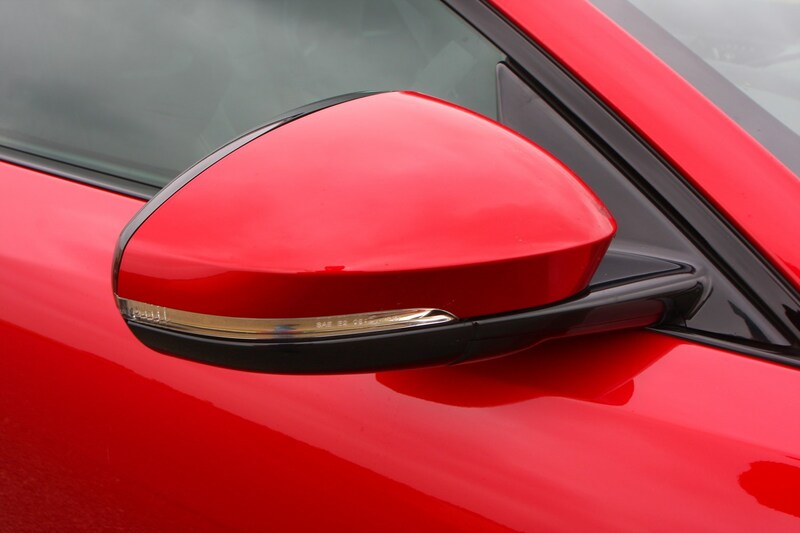 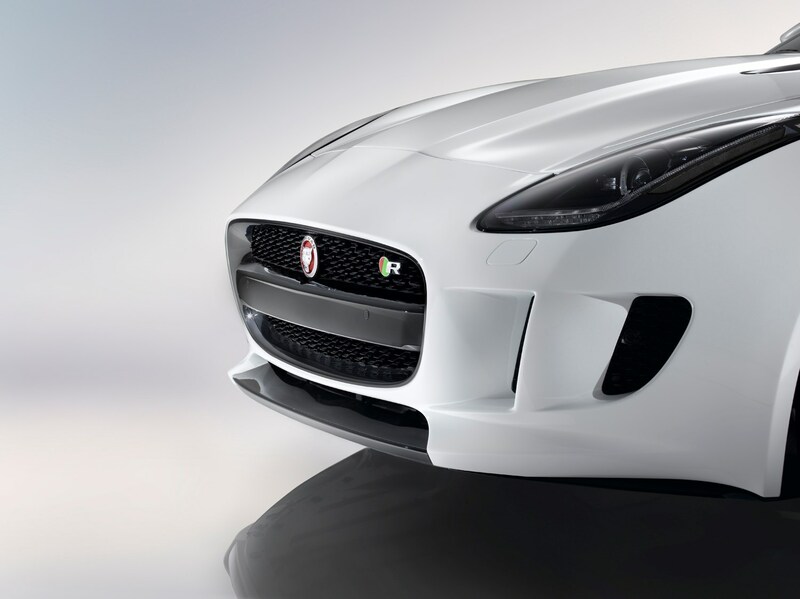 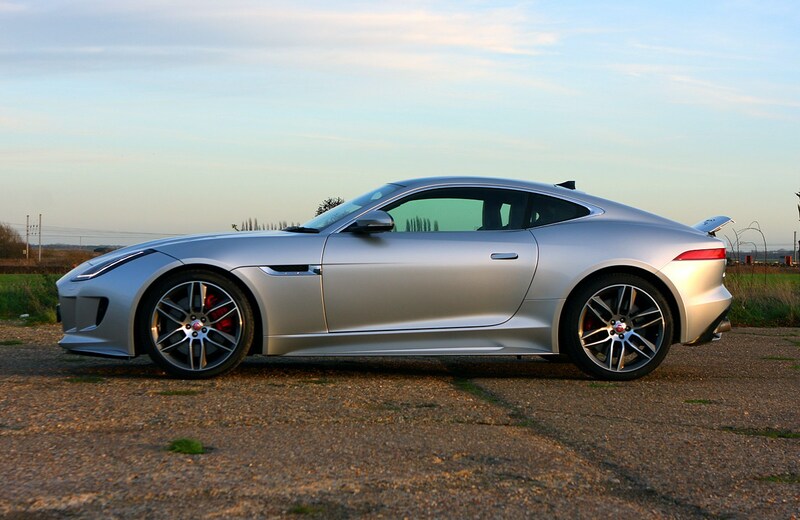 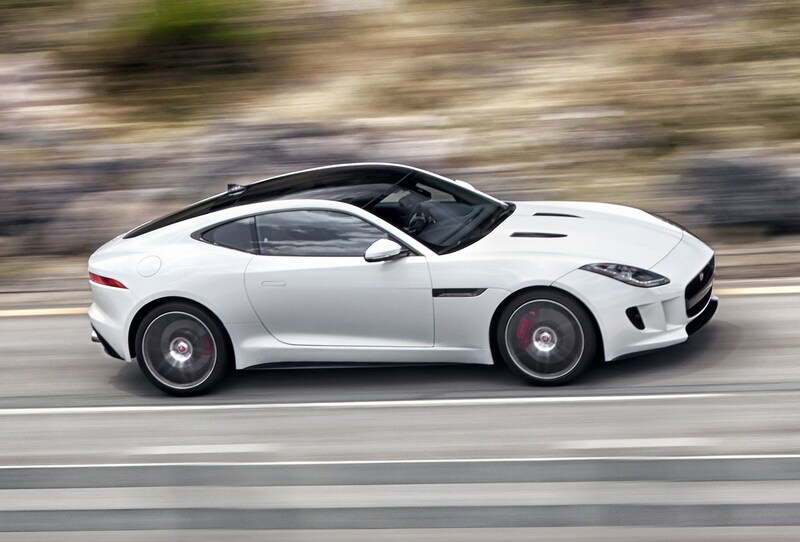 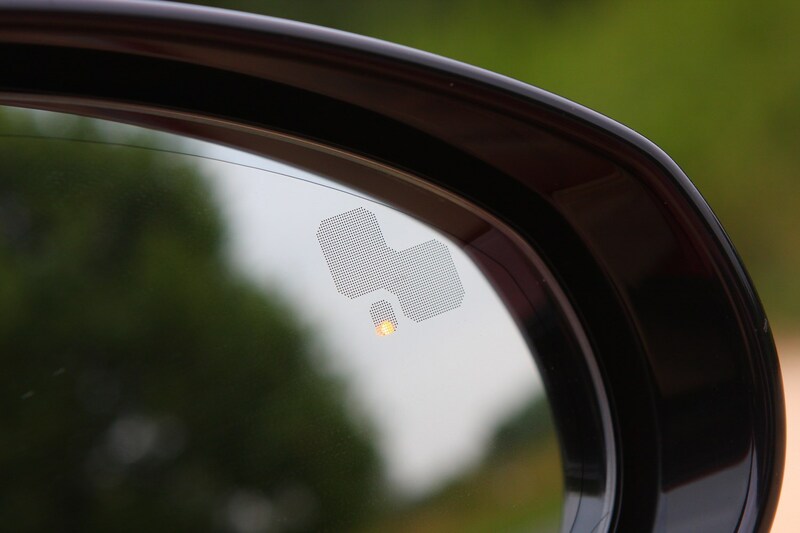 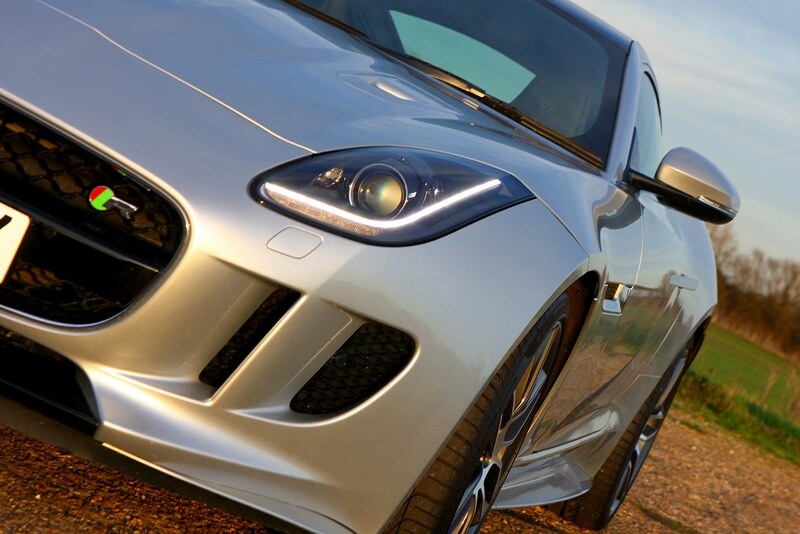 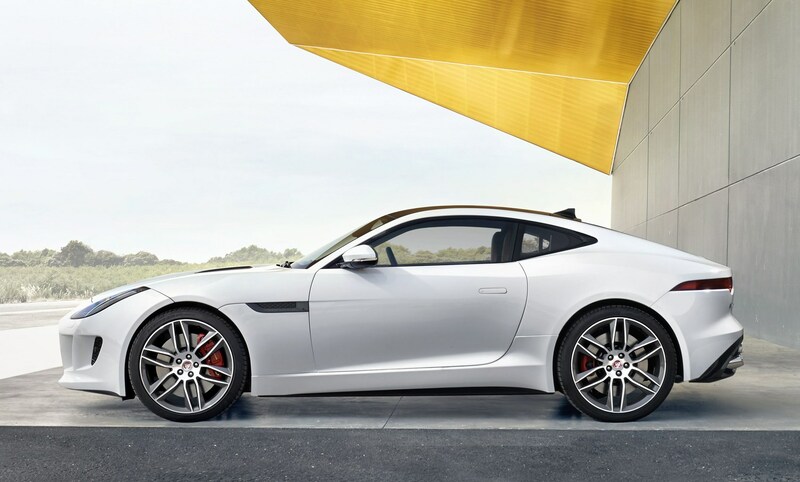 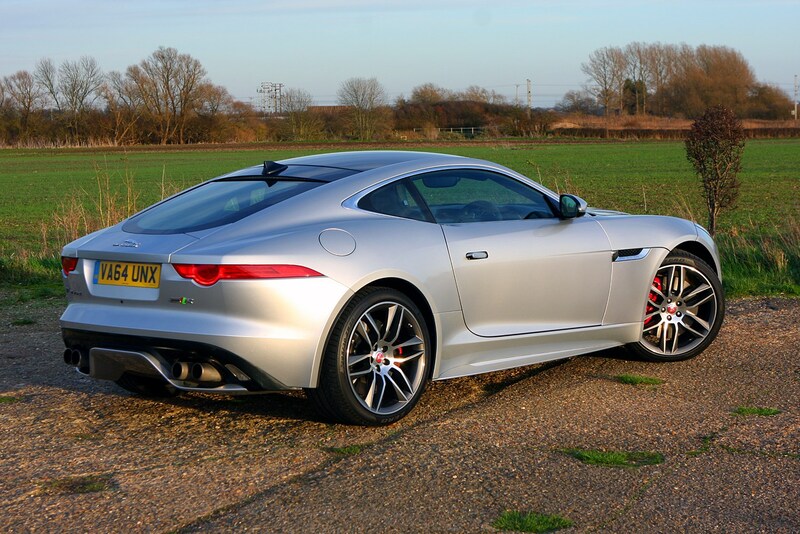 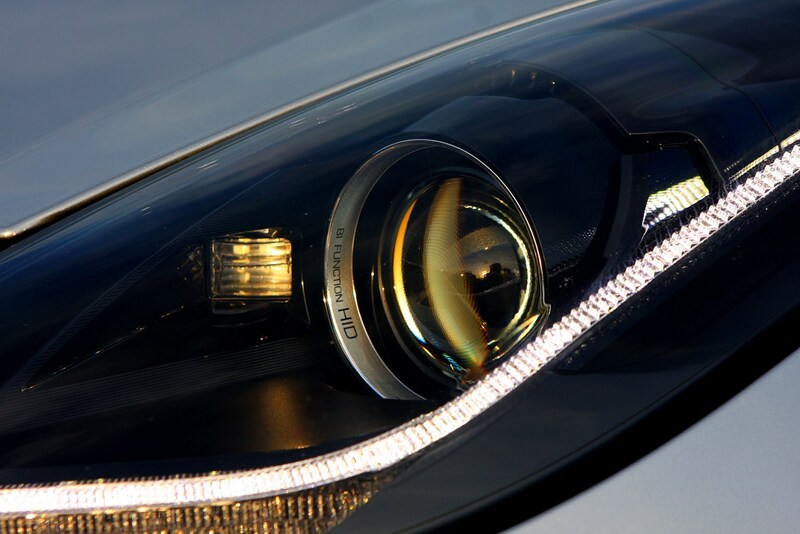 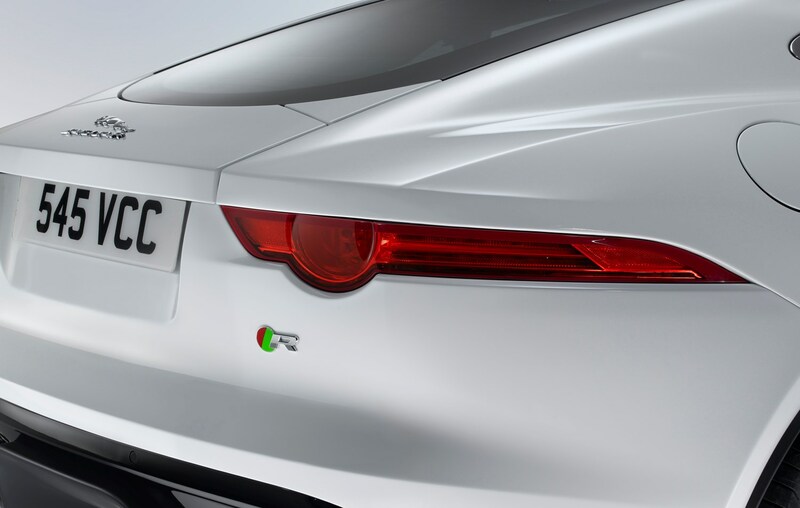 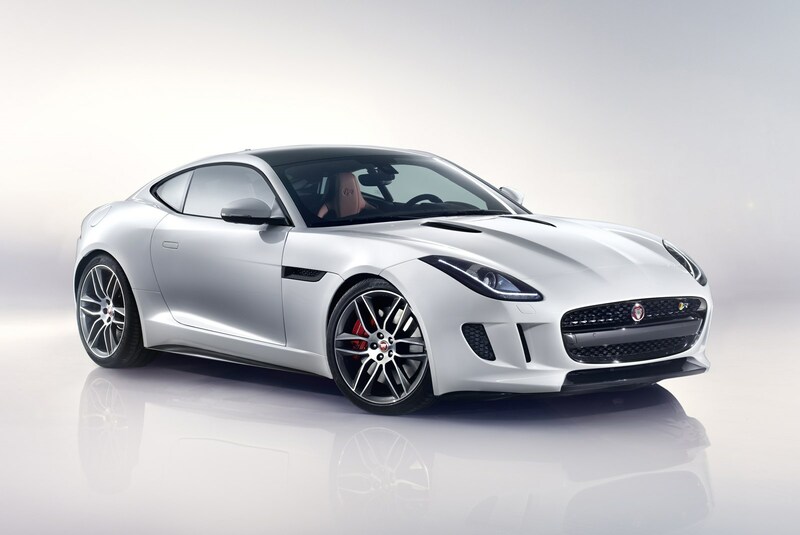 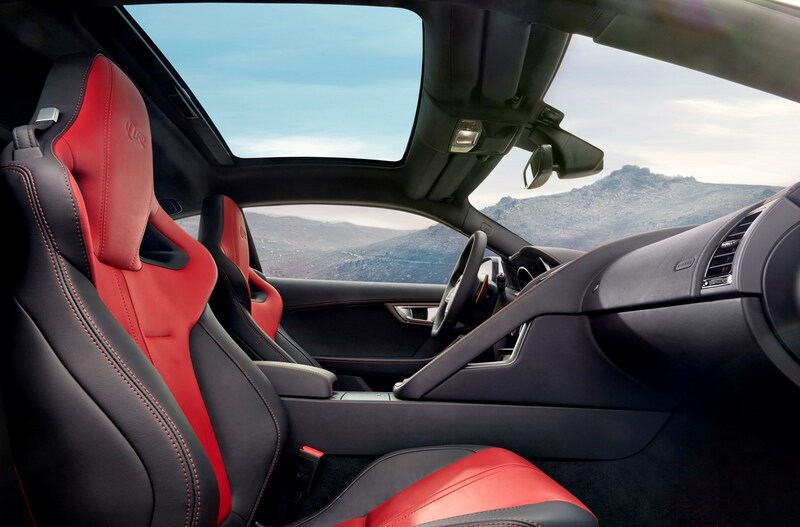 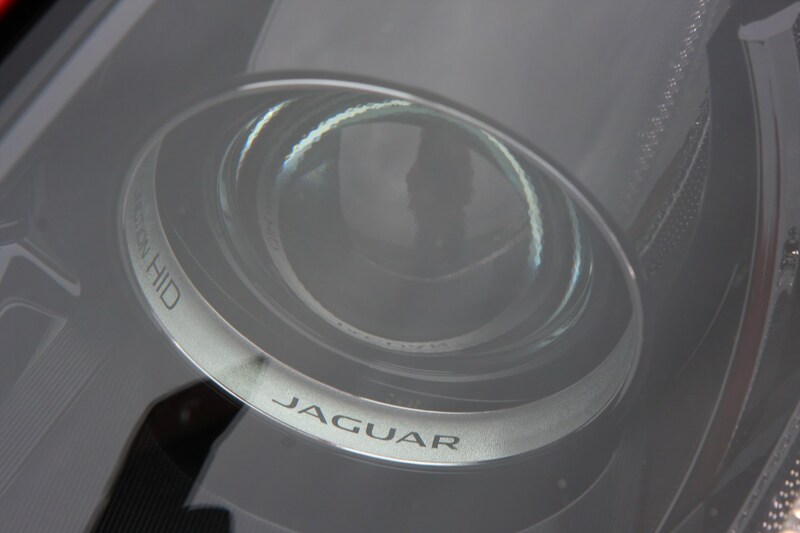 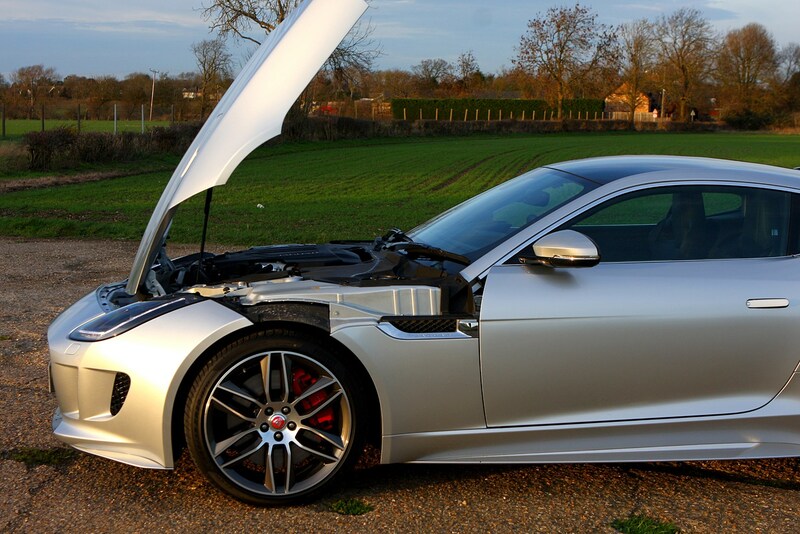 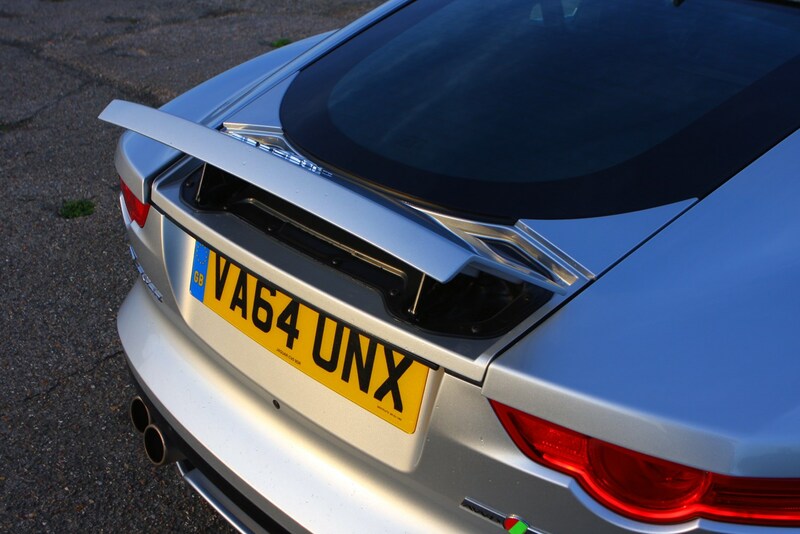 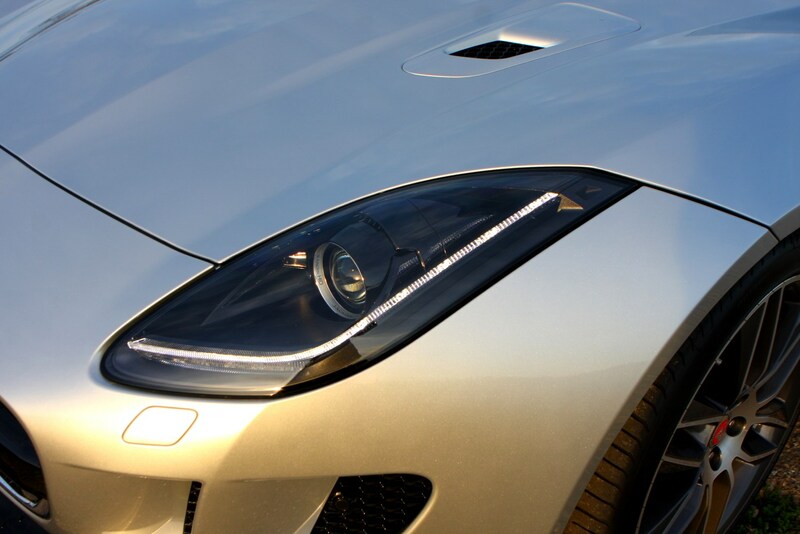 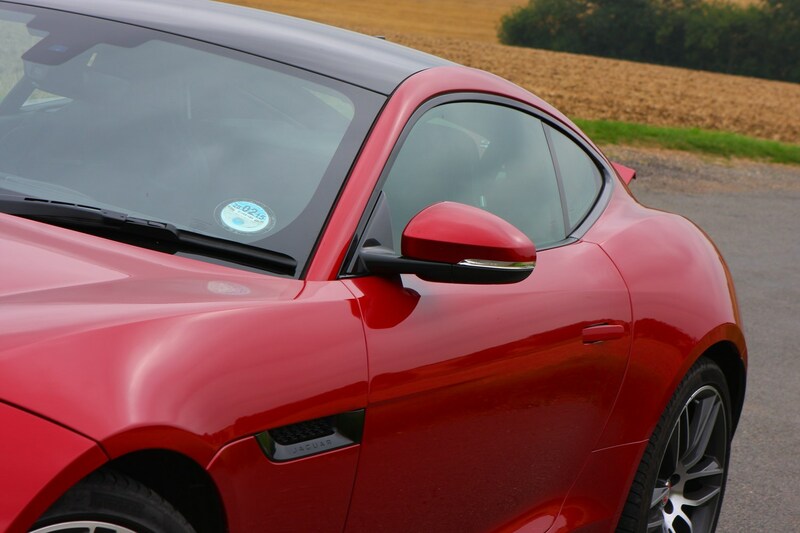 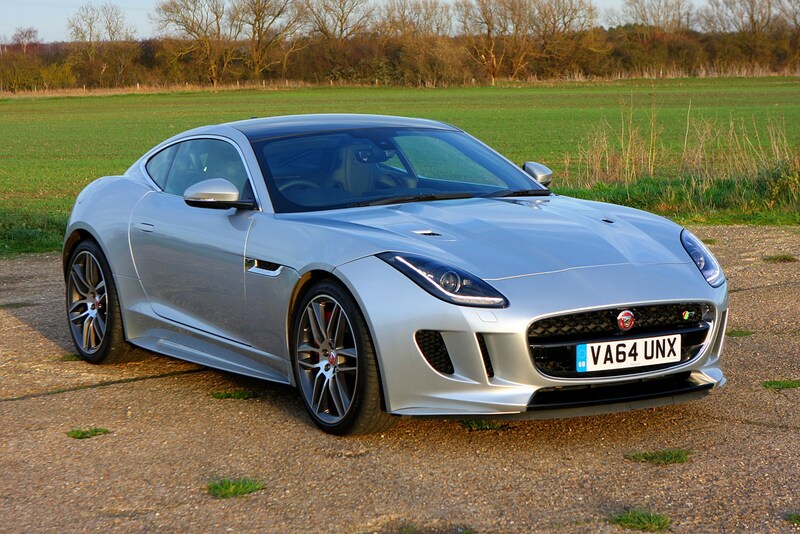 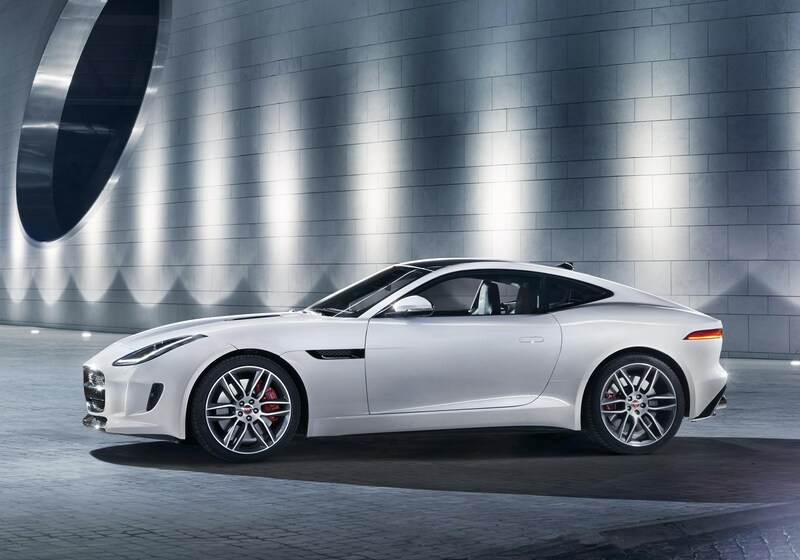 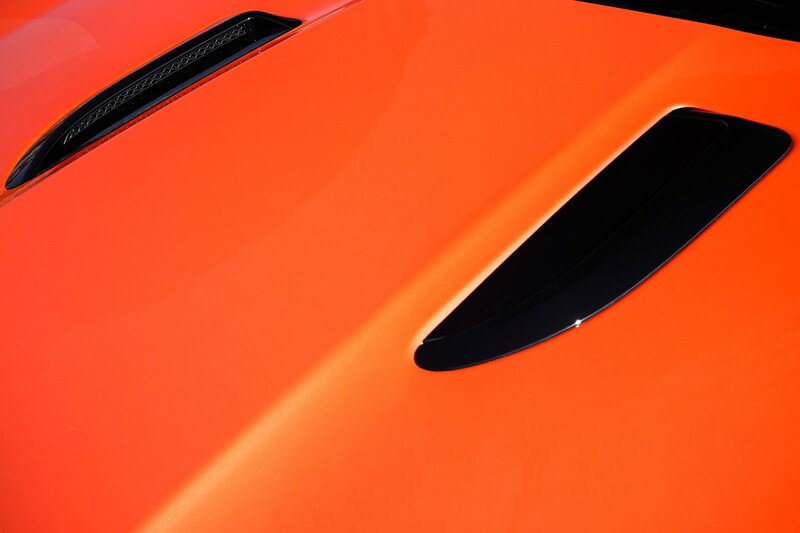 Like other F-Type Coupes, the R can be specified with either a glass or aluminium roof. 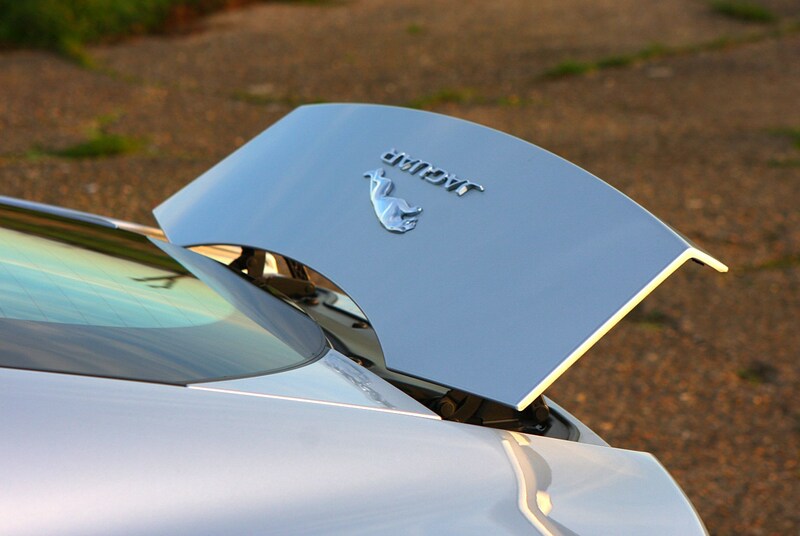 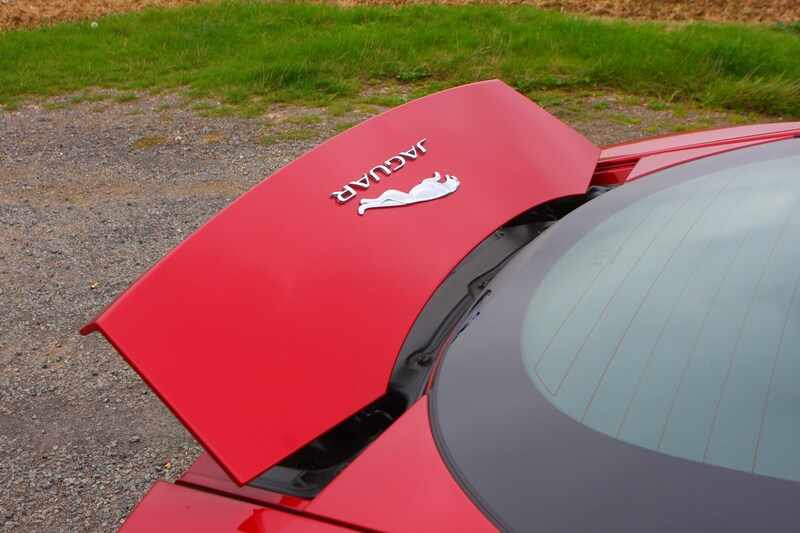 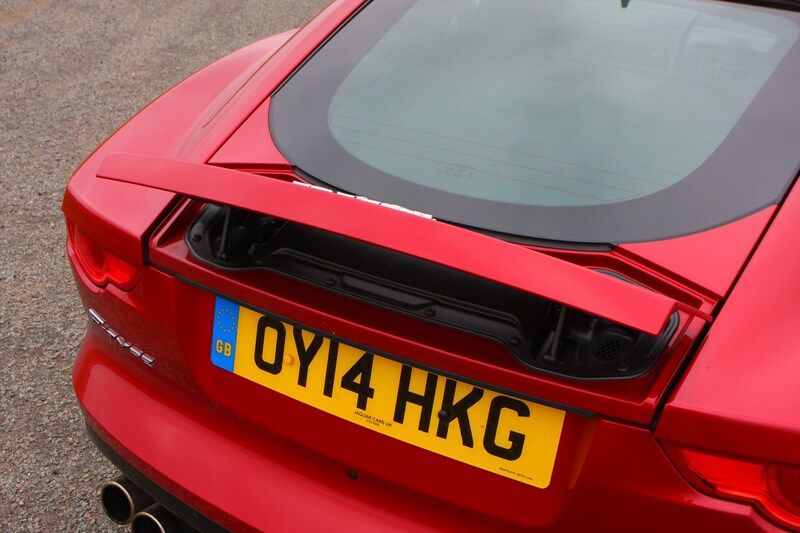 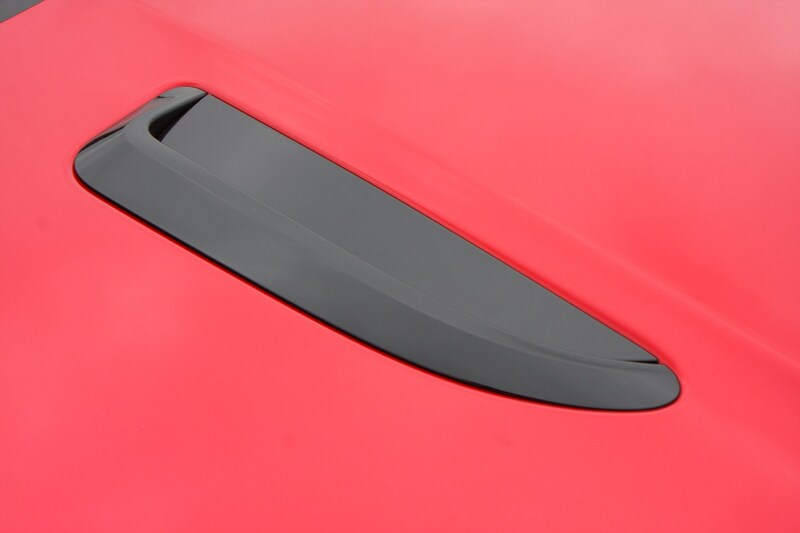 A neat hidden rear spoiler automatically rises at 70mph and retracts at 50mph, also coming up under hard braking to help slow the car down. 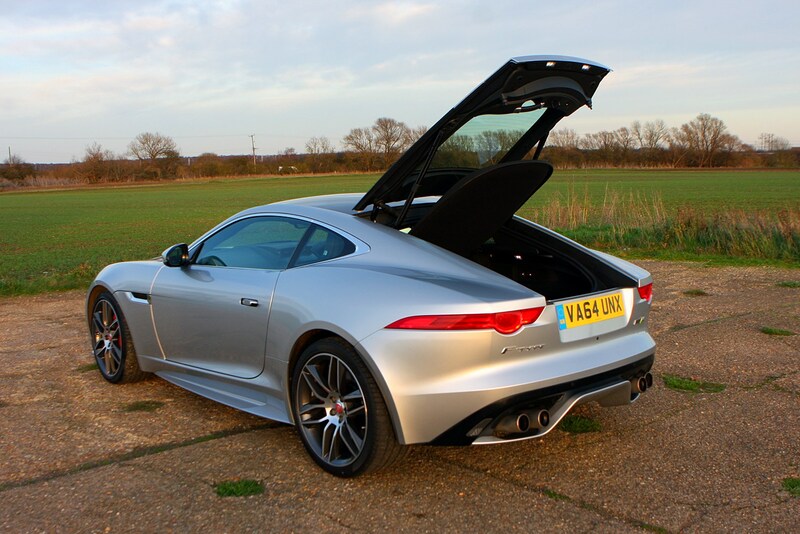 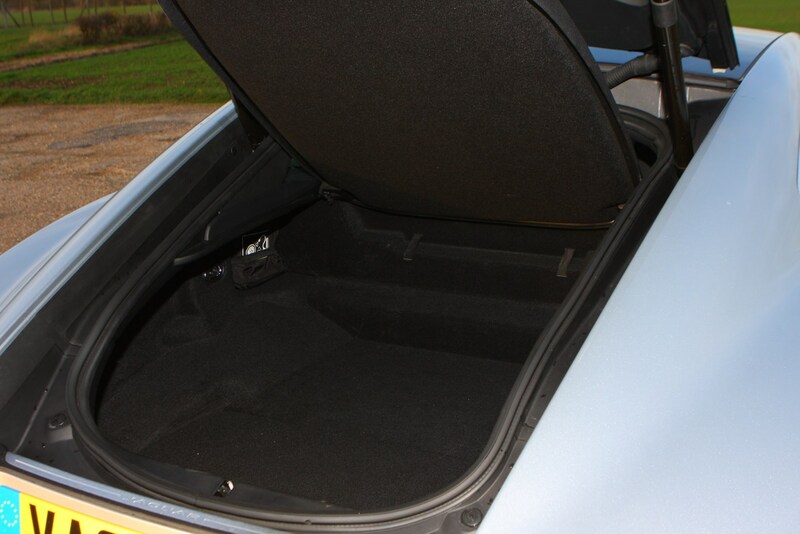 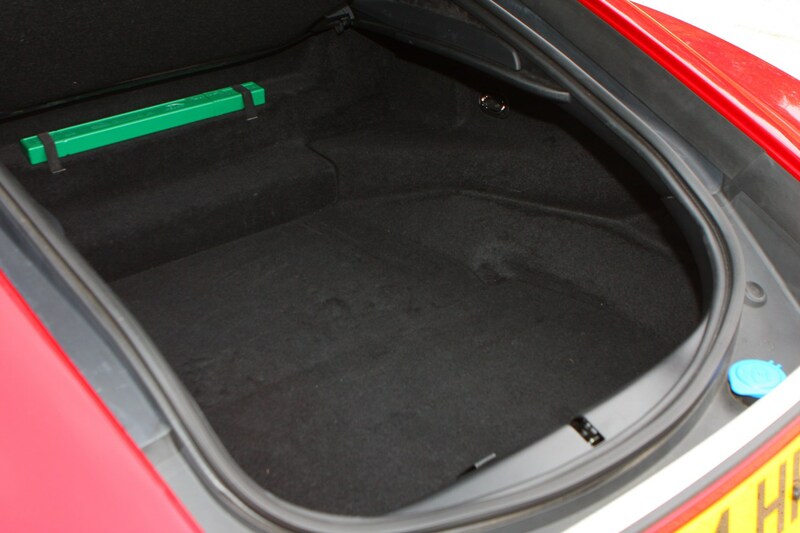 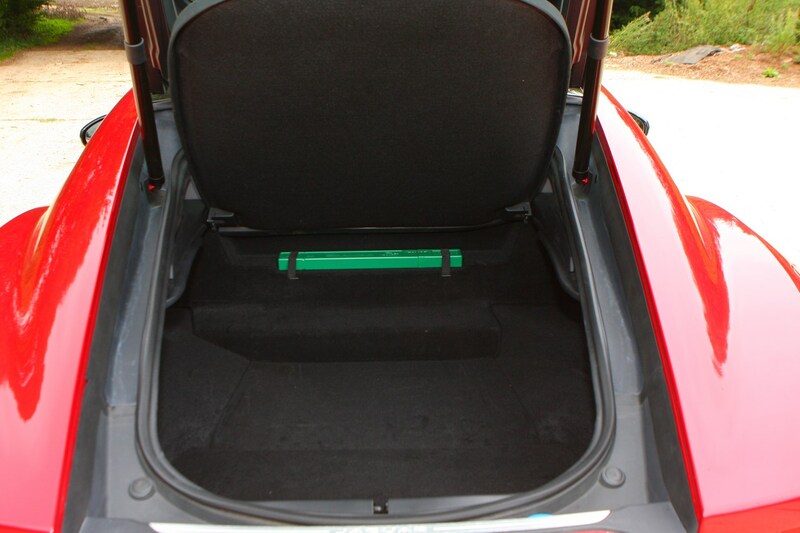 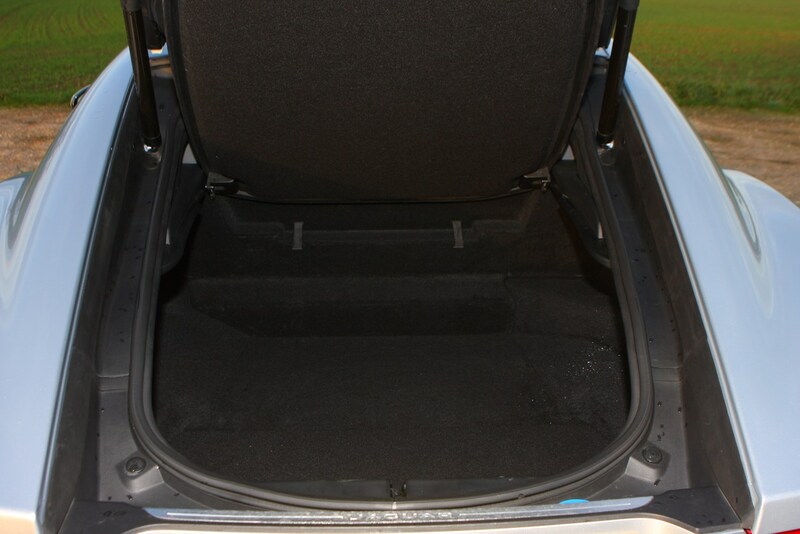 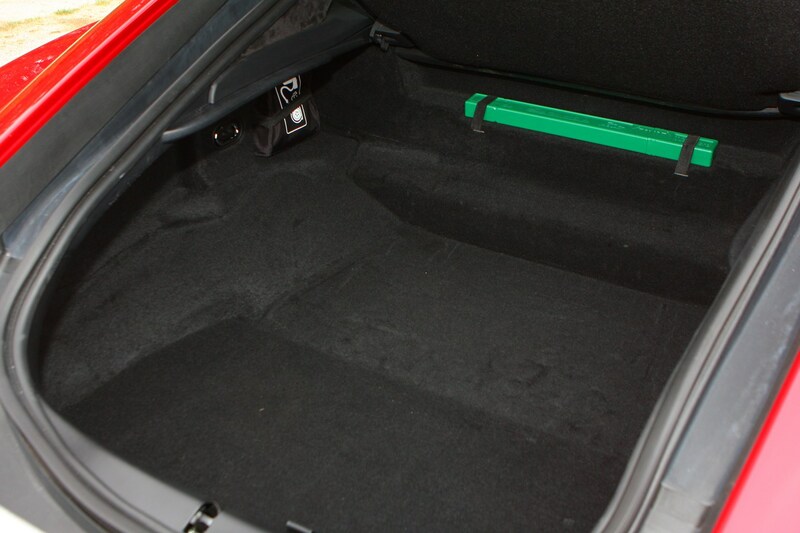 Jaguar is also keen to point out that the Coupe’s boot will accommodate two sets of golf clubs – a big improvement on the F-Type Convertible, which was lambasted by critics for its lack of usable luggage space. 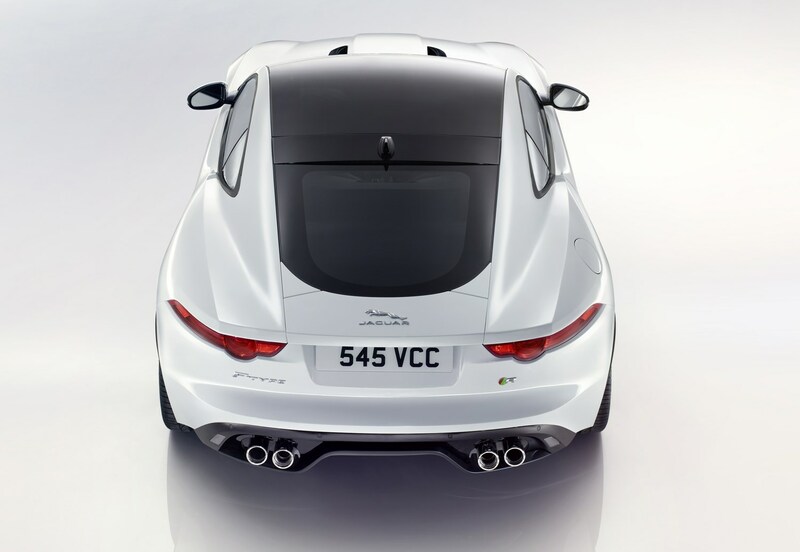 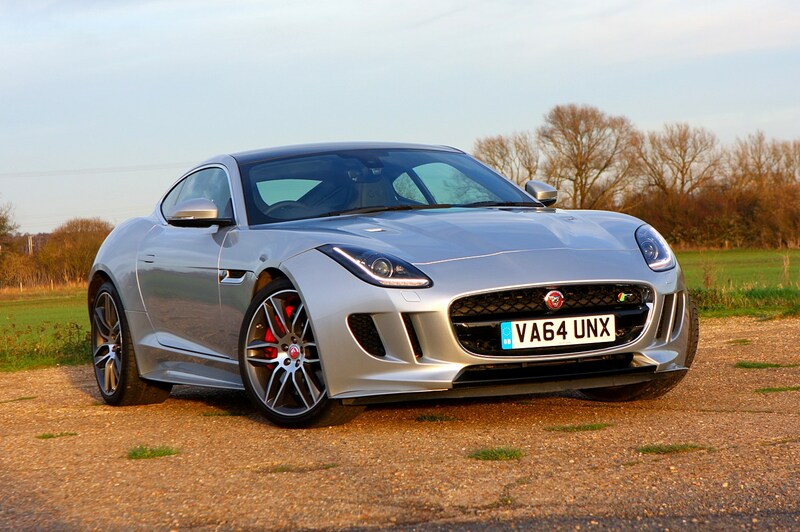 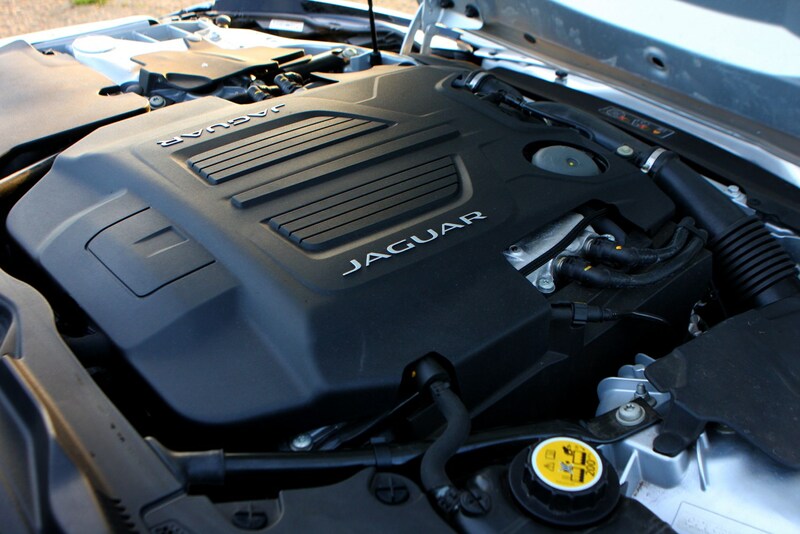 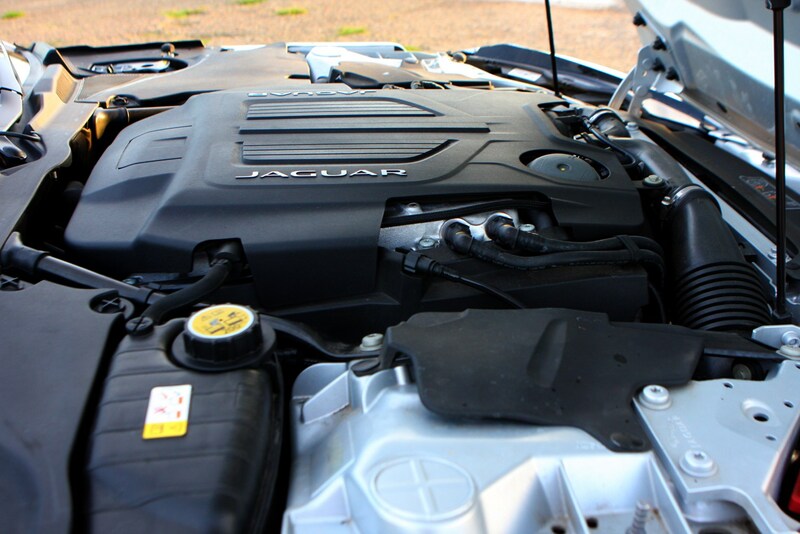 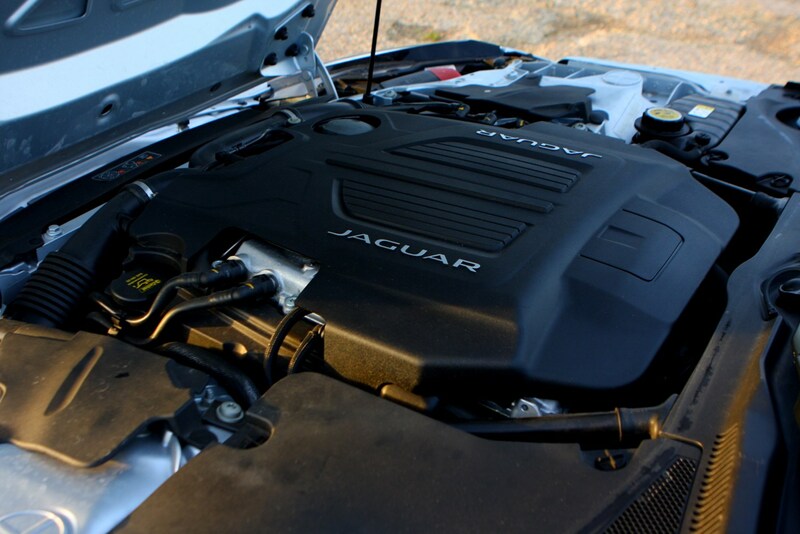 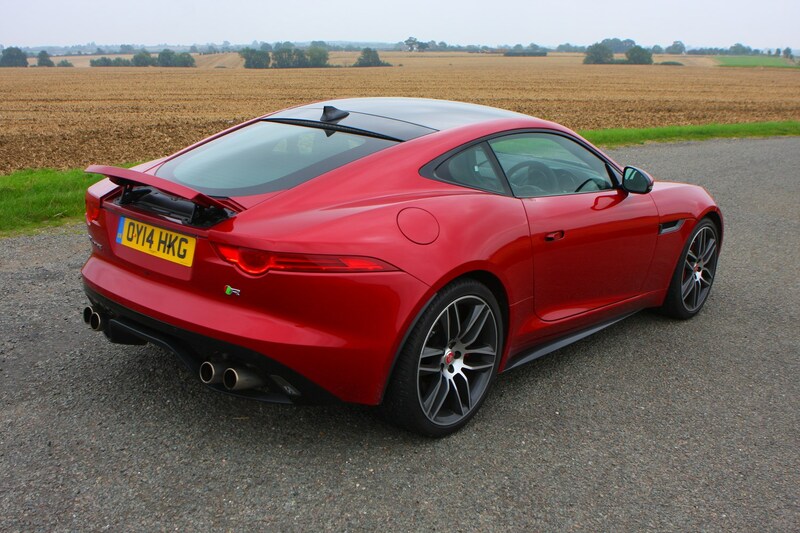 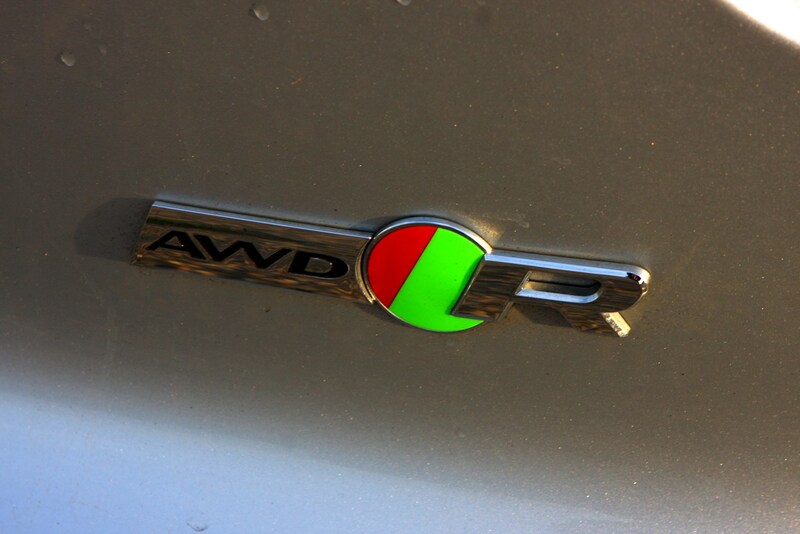 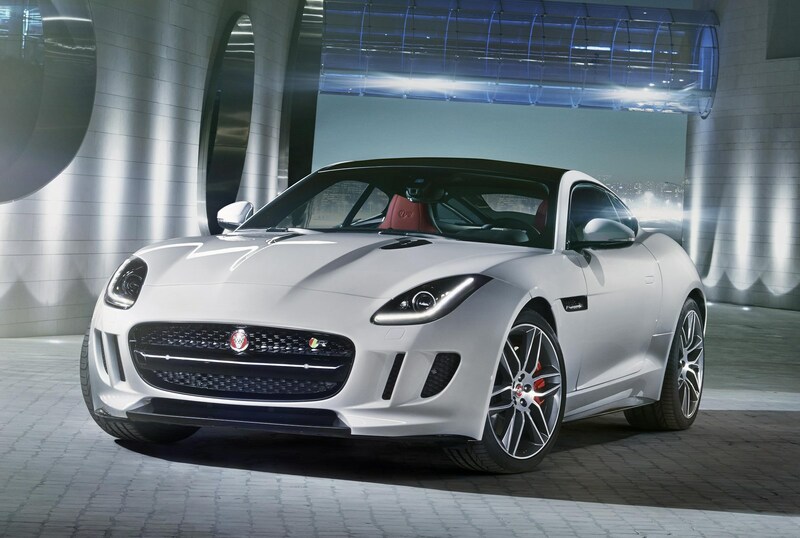 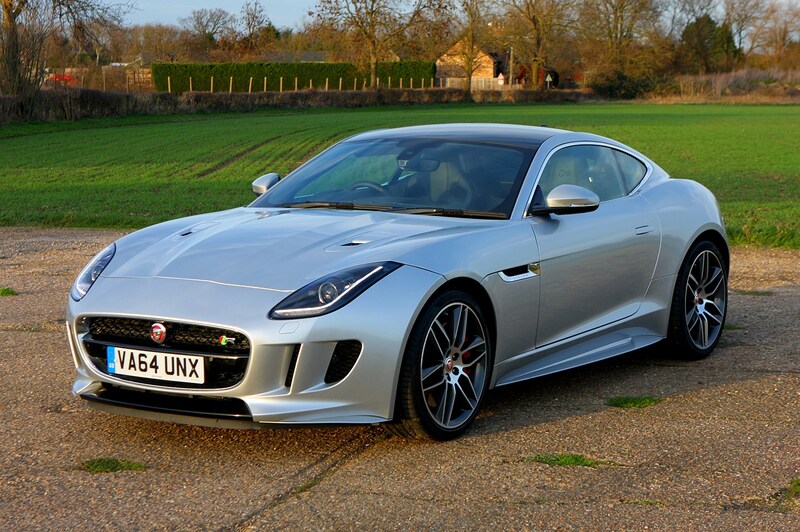 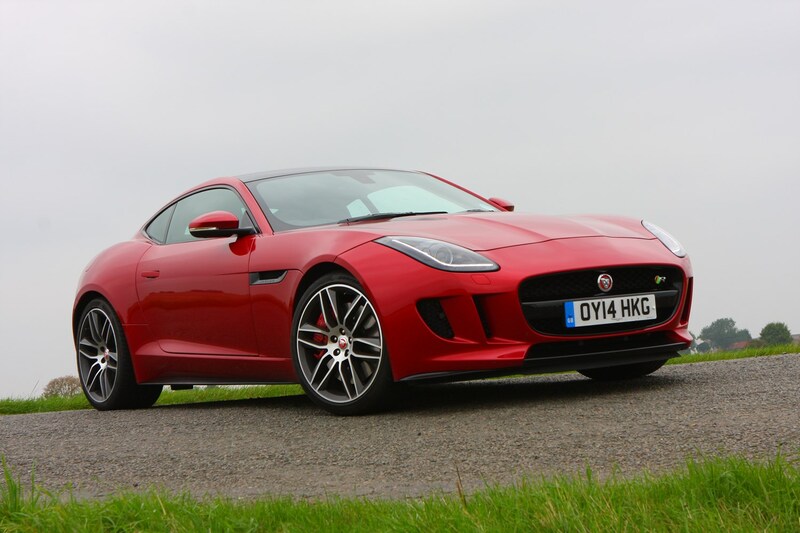 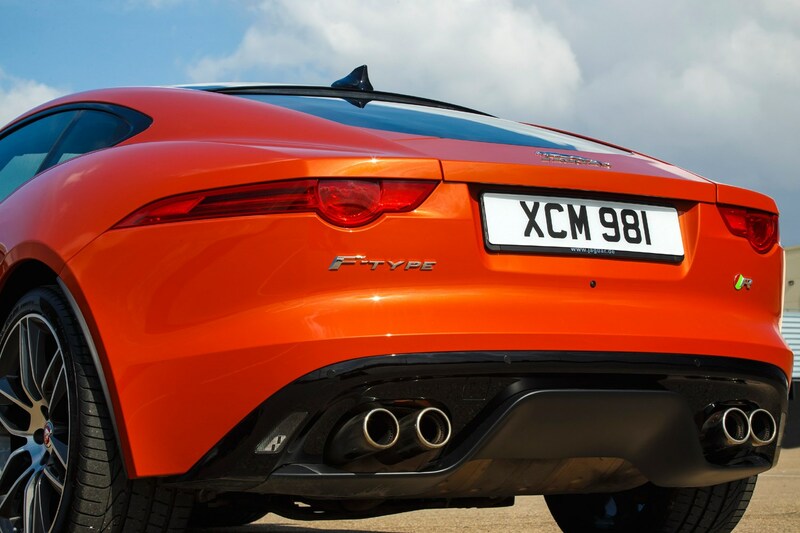 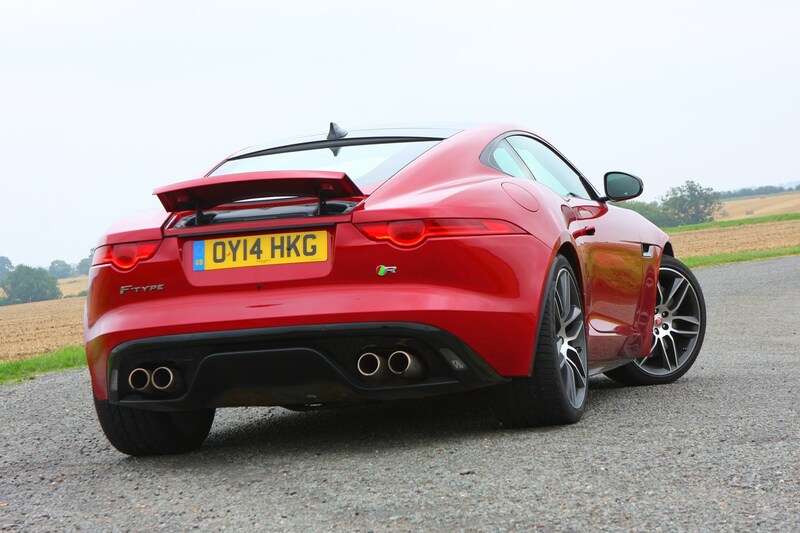 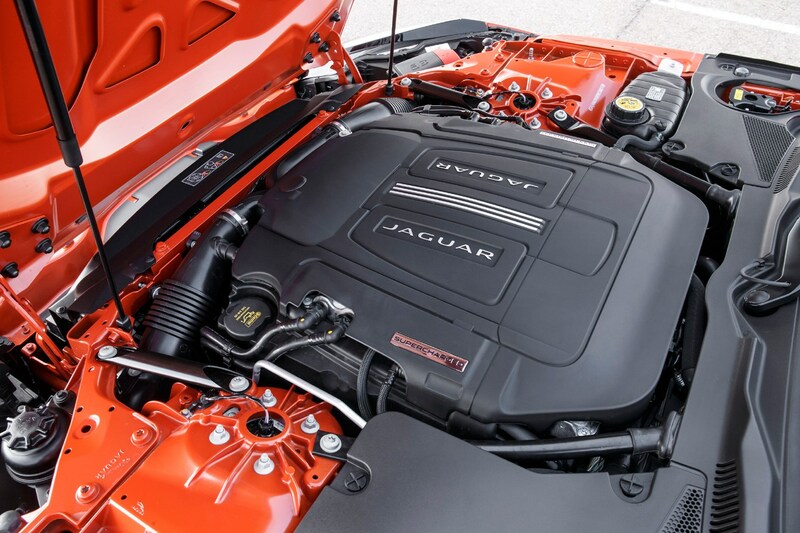 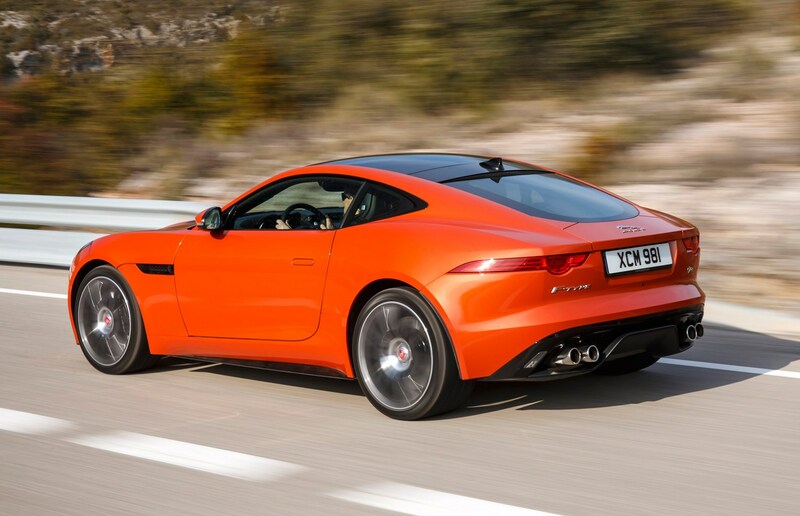 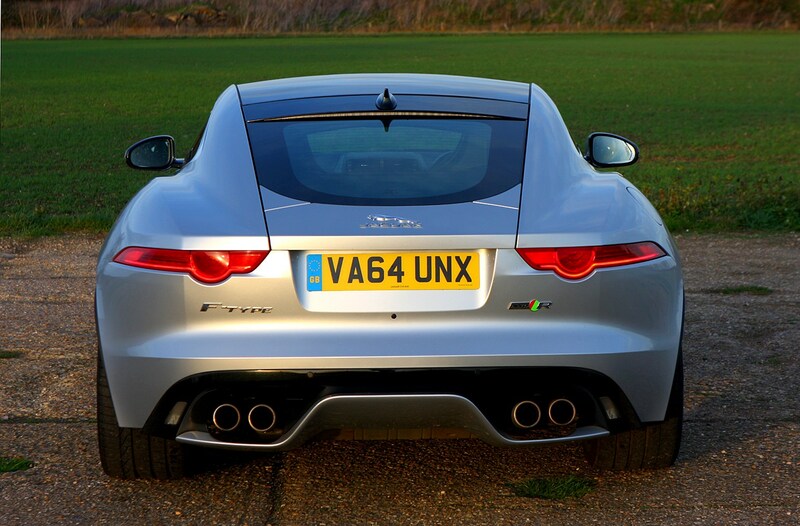 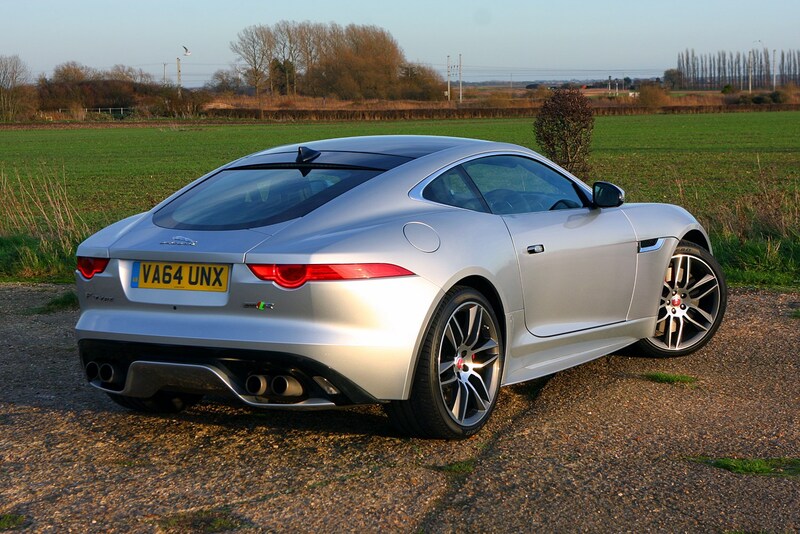 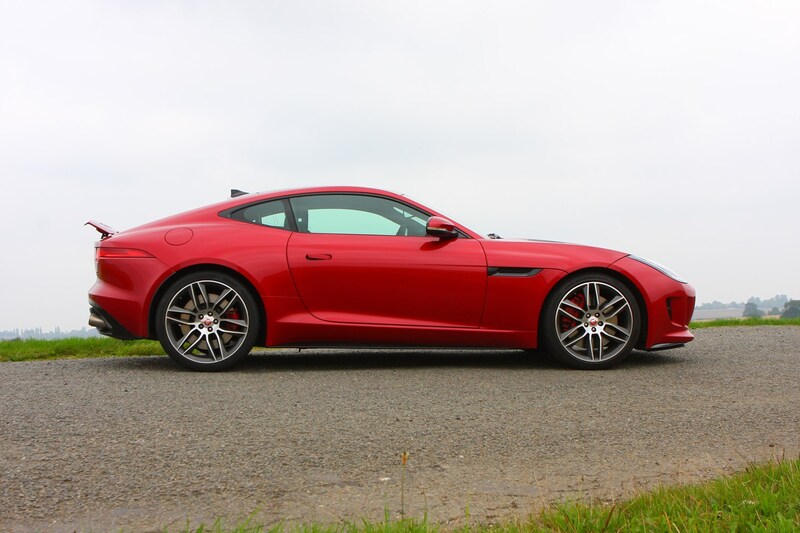 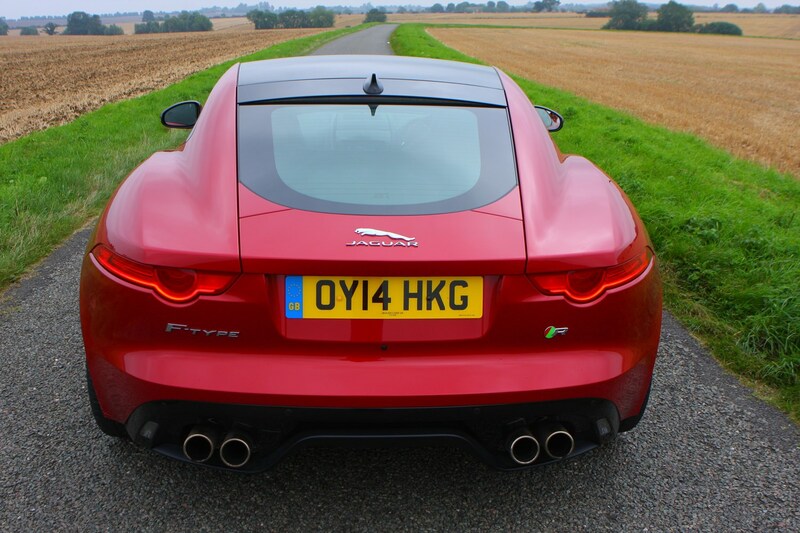 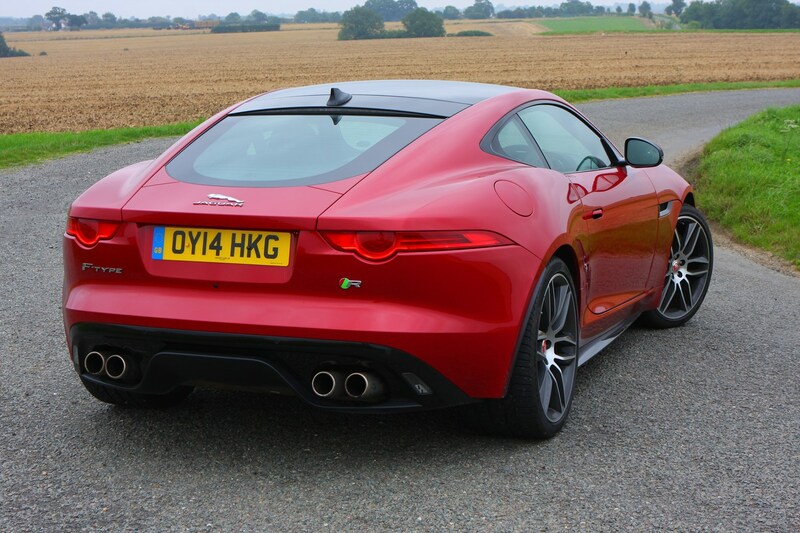 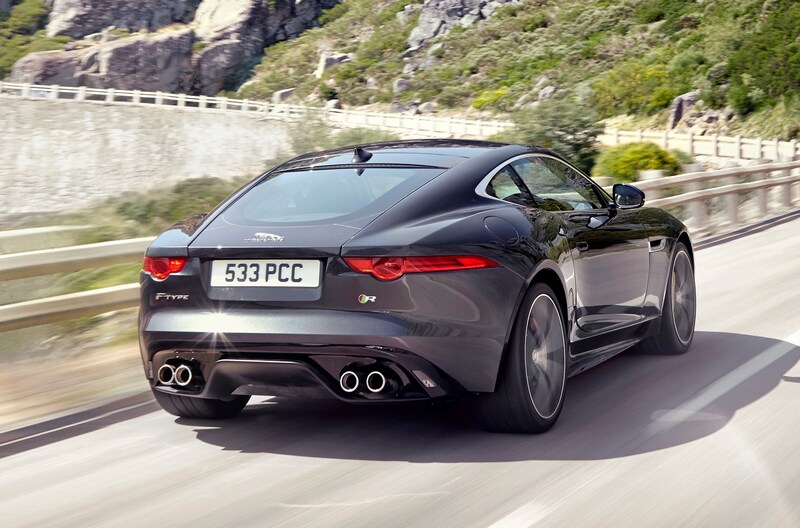 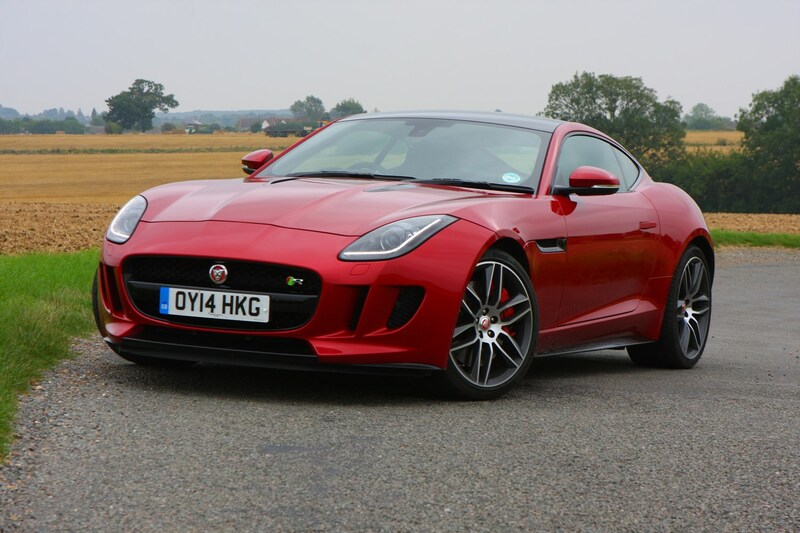 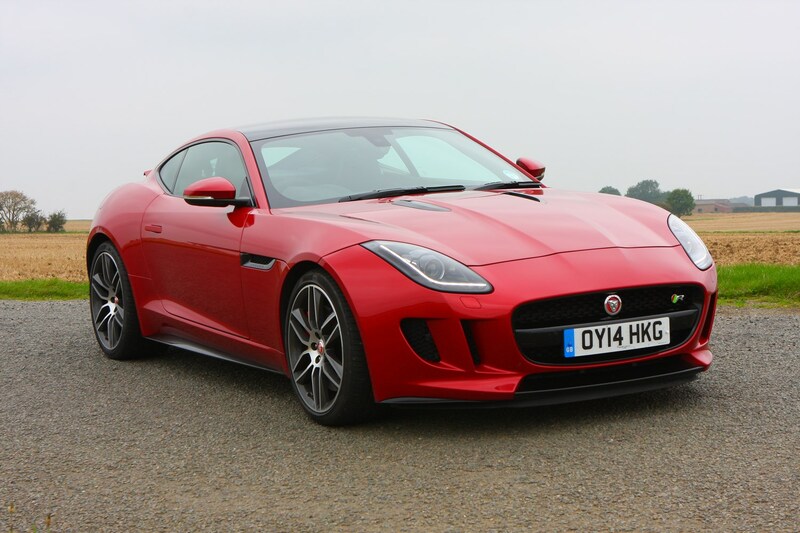 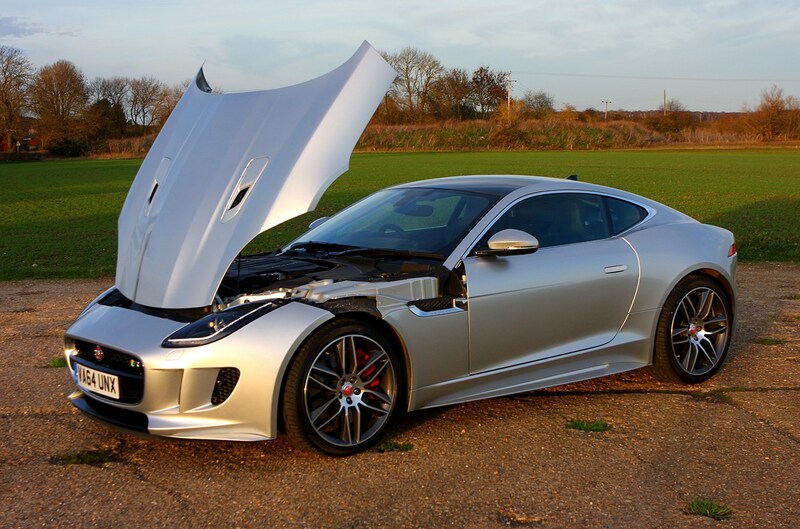 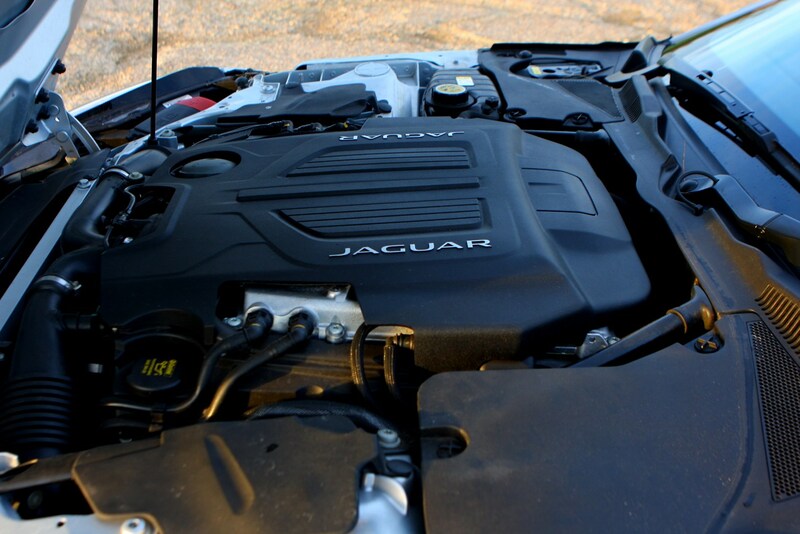 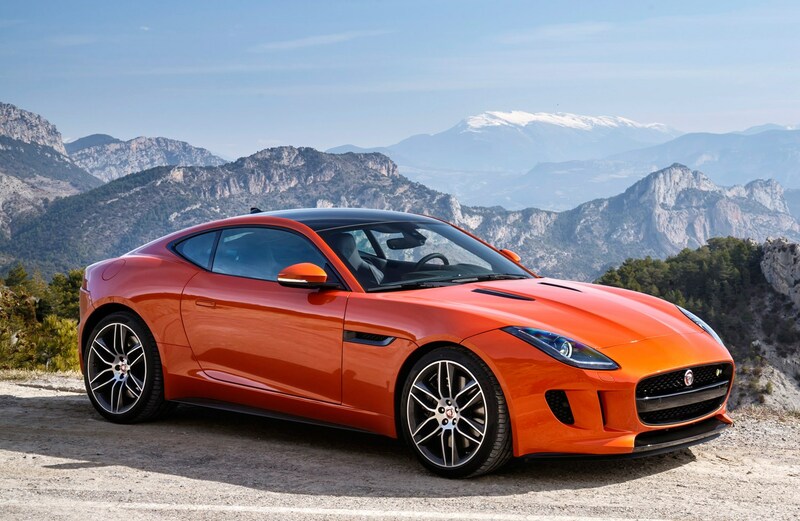 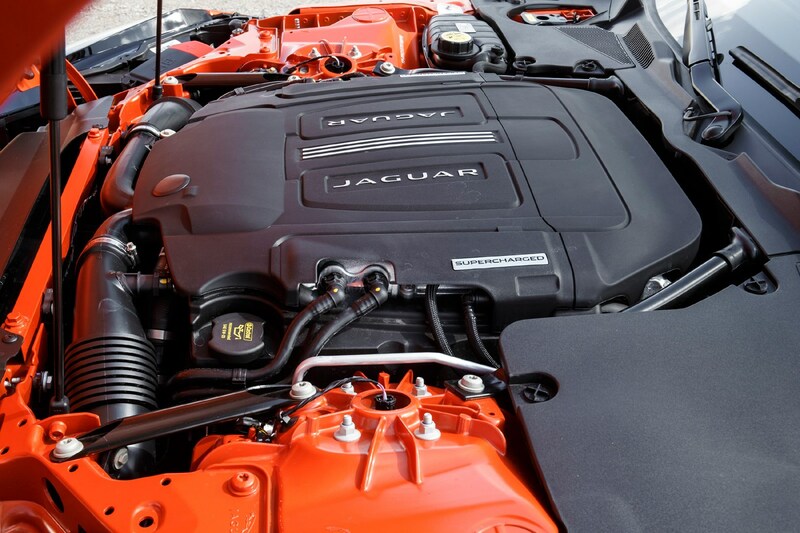 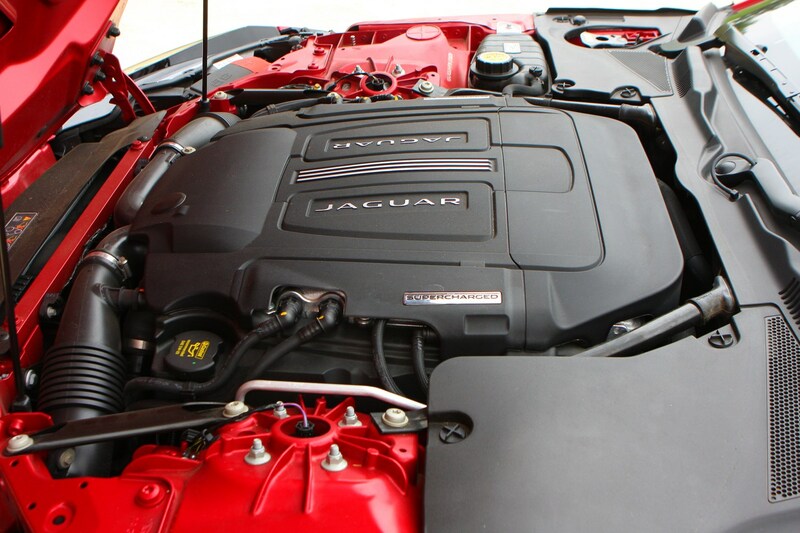 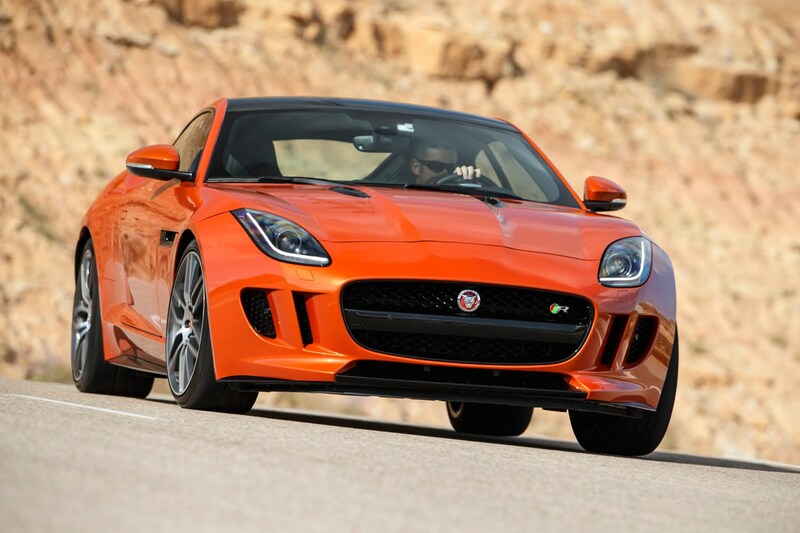 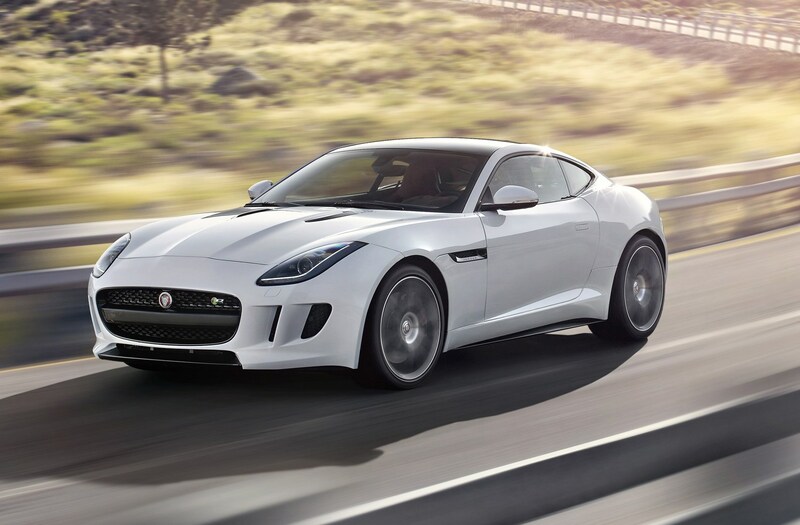 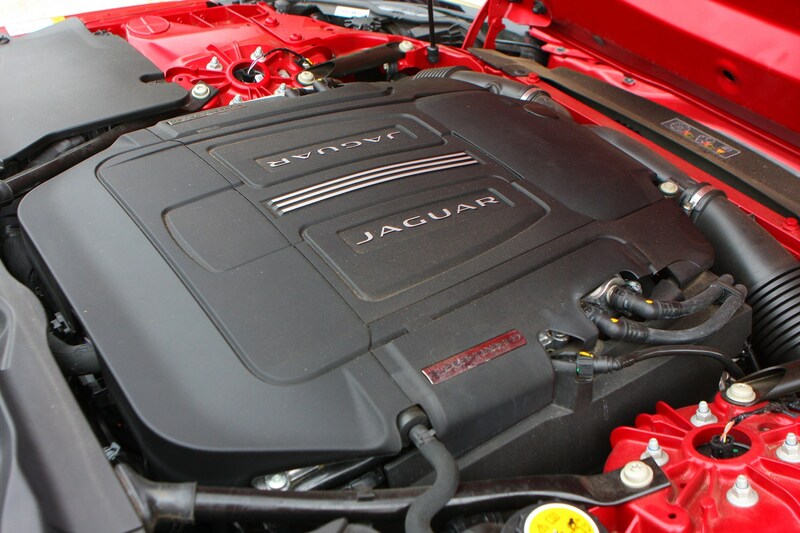 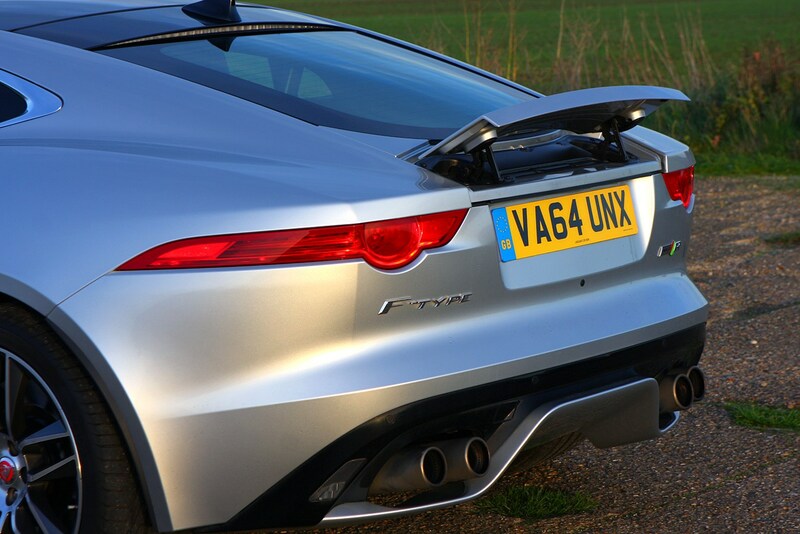 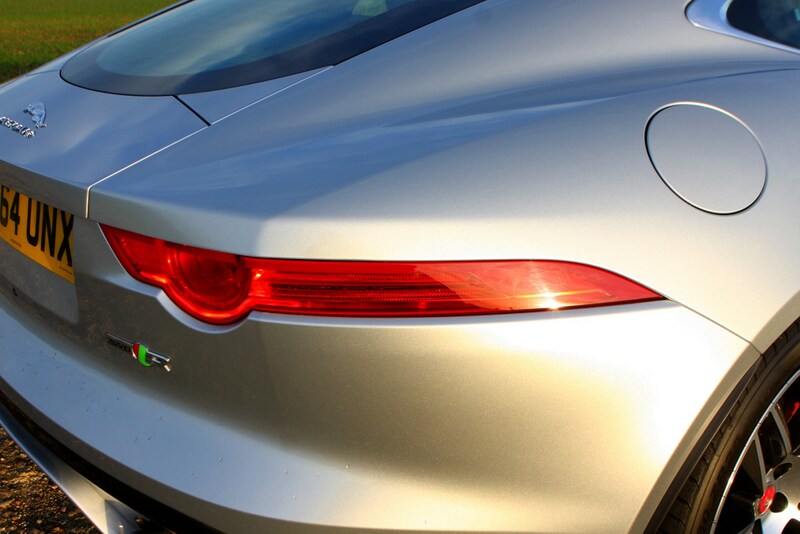 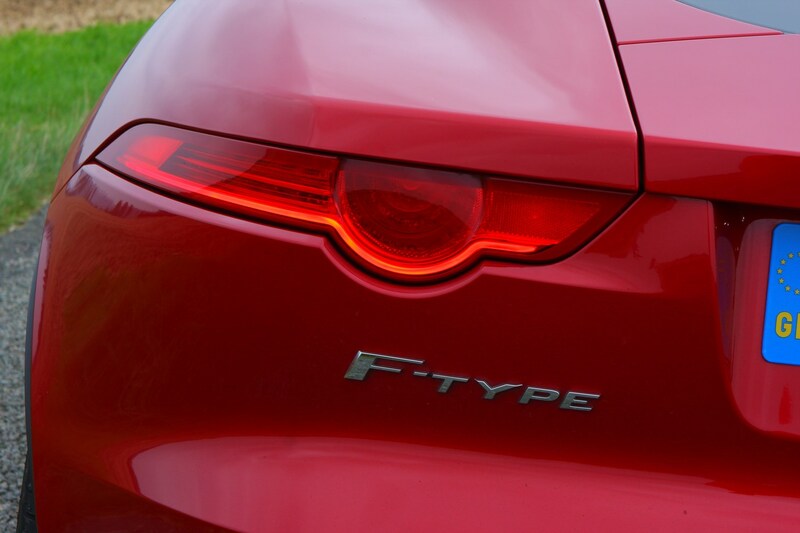 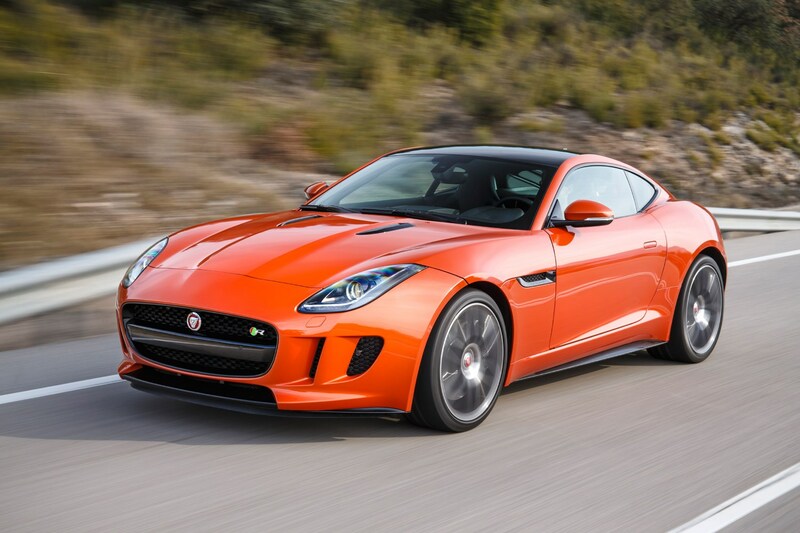 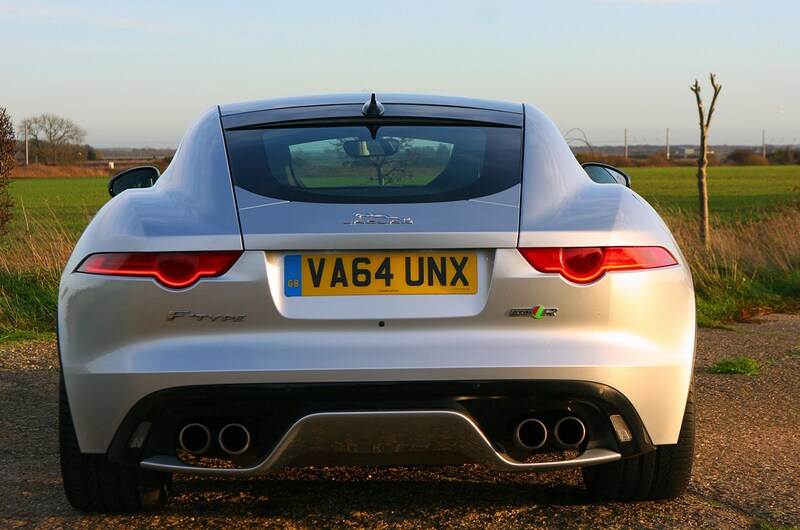 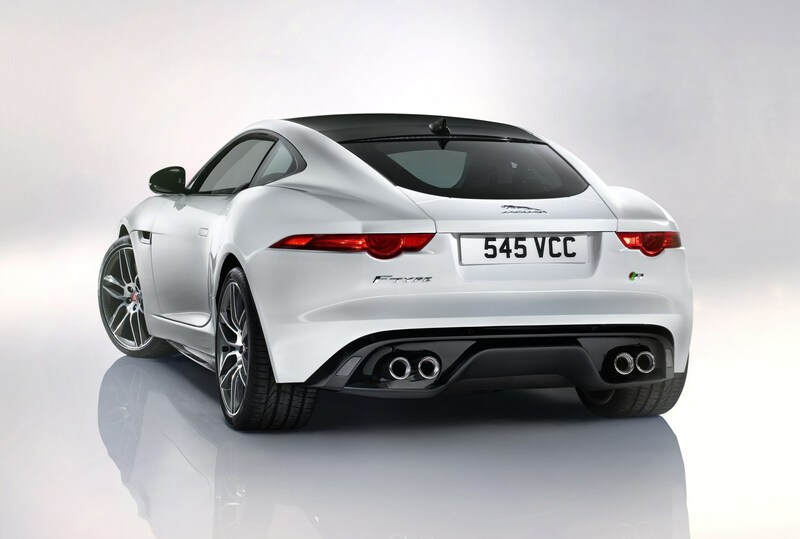 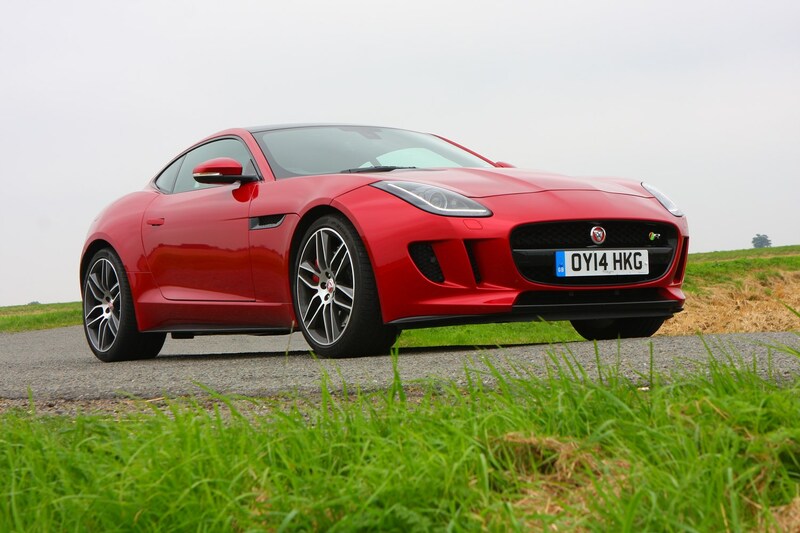 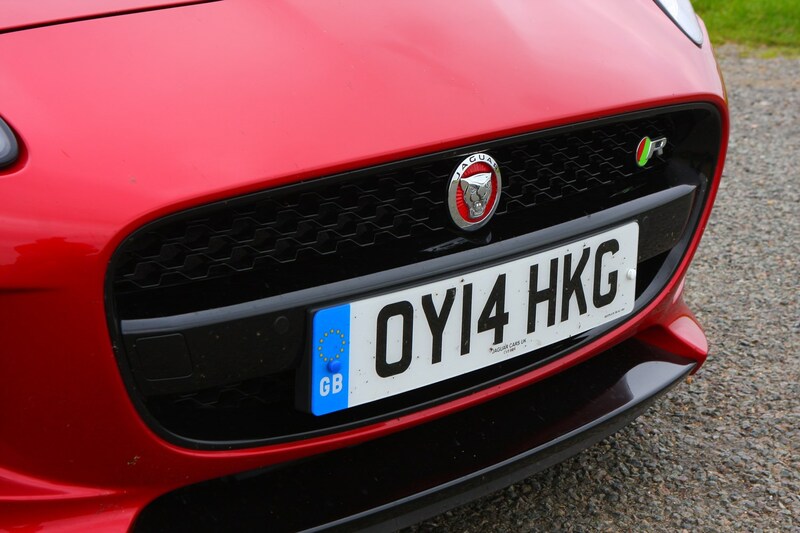 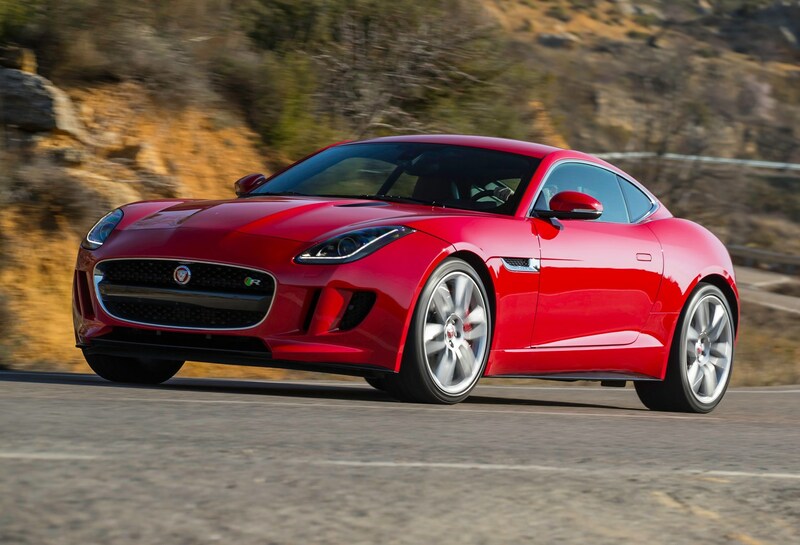 The regular F-Type Coupe and S Coupe models are powered by smaller V6 engines and are covered in a separate review. 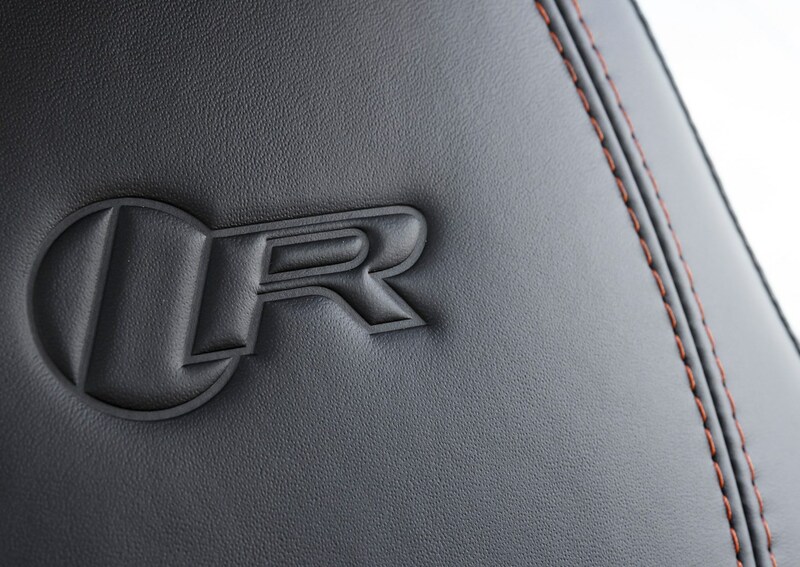 The R Coupe is considerably more expensive than the rest of the range, priced at nearly £85,000 on-the-road. 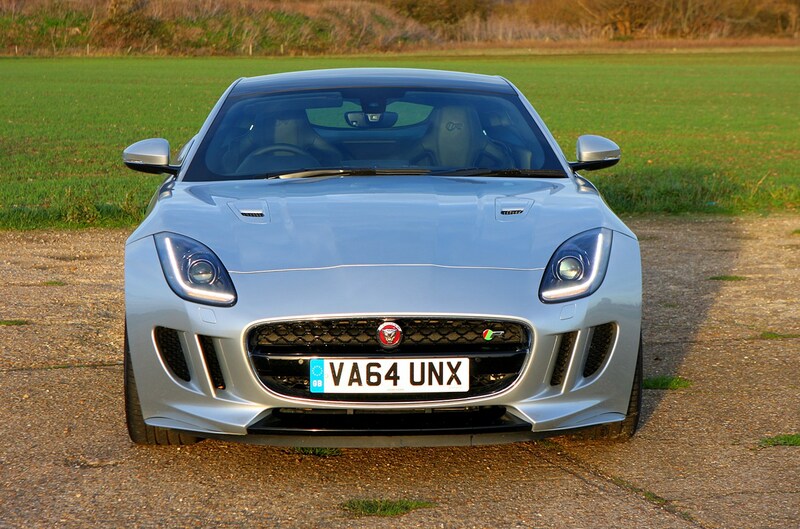 That’s over £30,000 more than the entry-level V6 Jaguar F-Type Coupe. 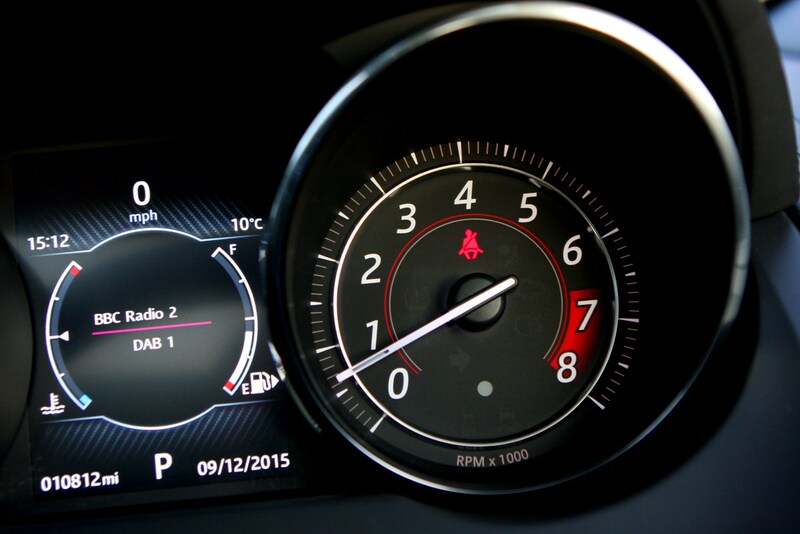 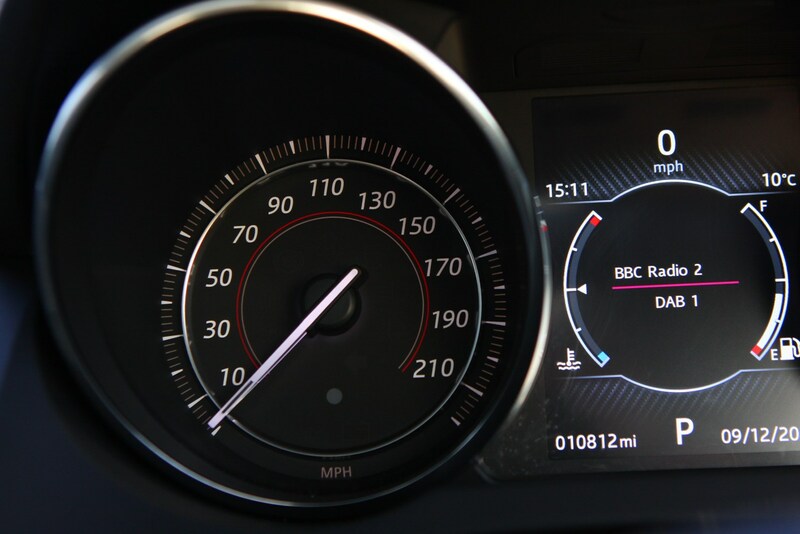 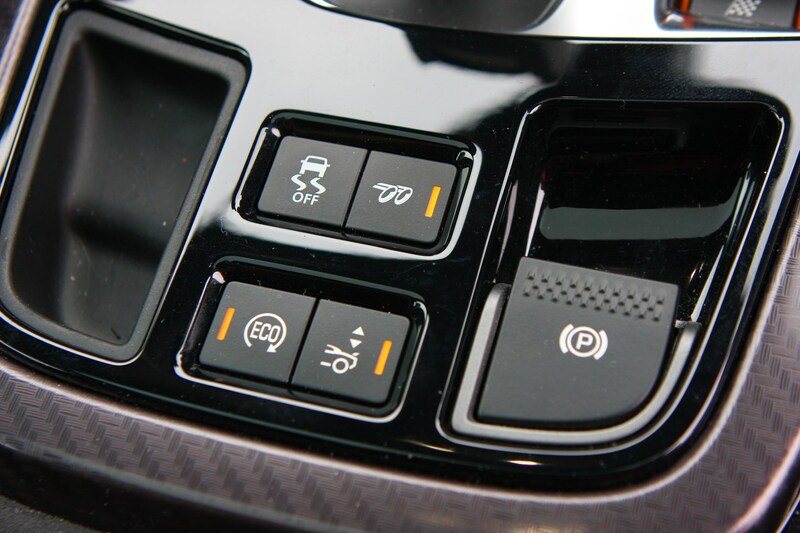 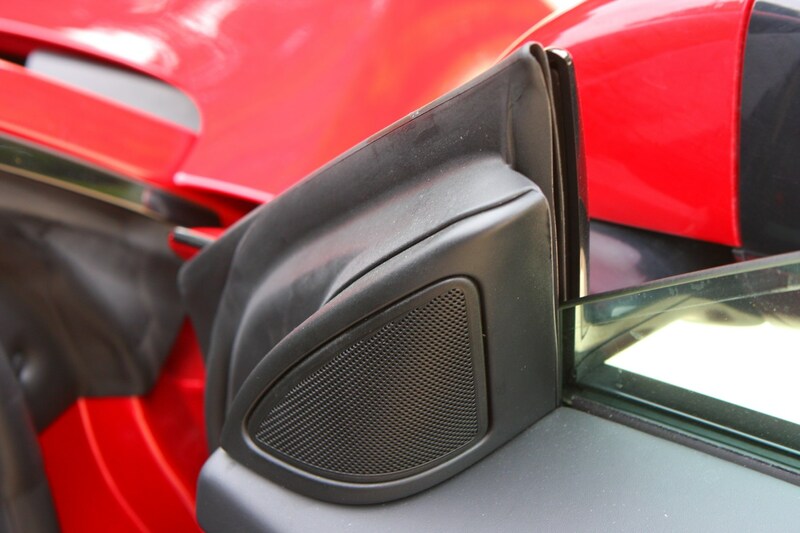 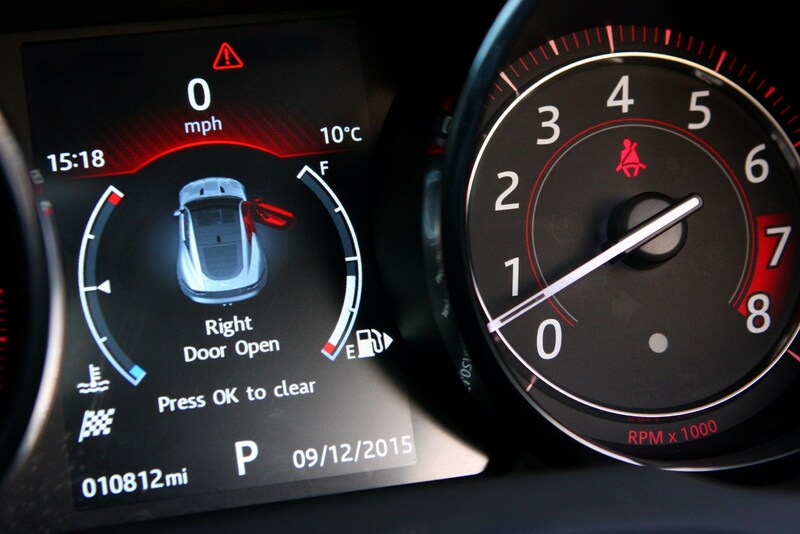 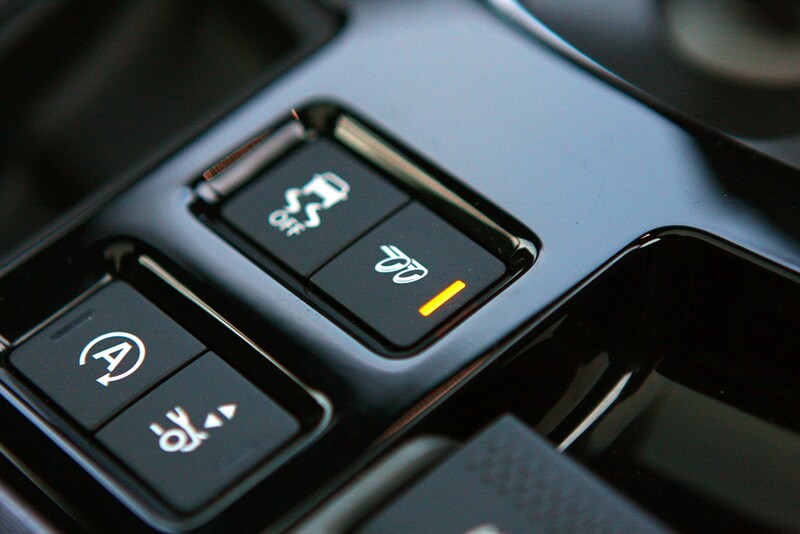 Tick a few boxes on the optional extras list, and that cost can rise to over £100,000 with not much effort at all. 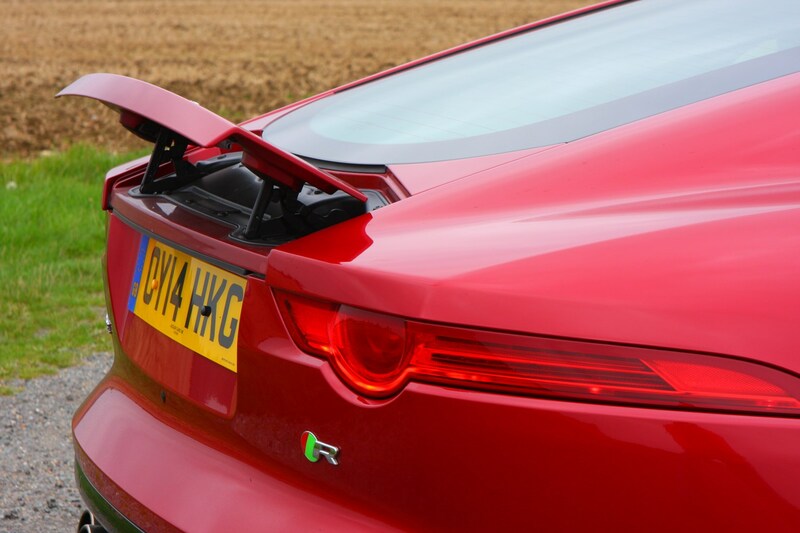 Read on for the full Parkers Jaguar F-Type R Coupe review, and find out why Porsche’s 911 might finally have some serious competition from the UK.